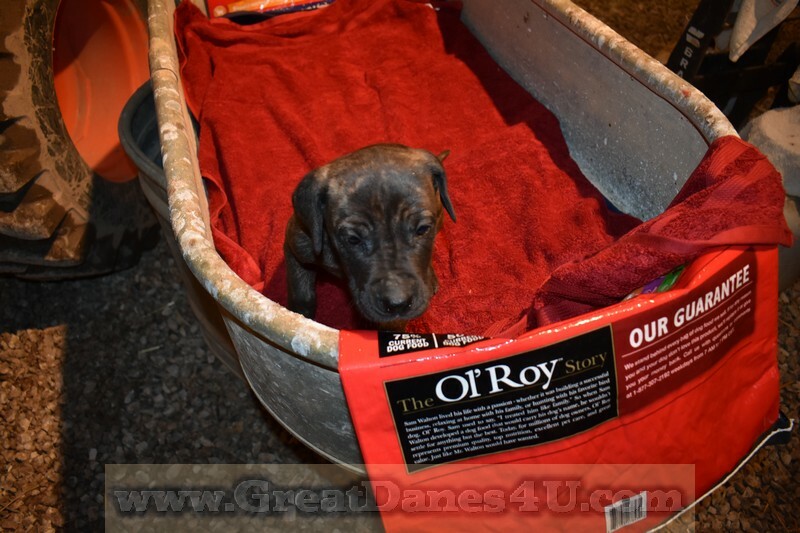 6 Week Photos 9 Mar. 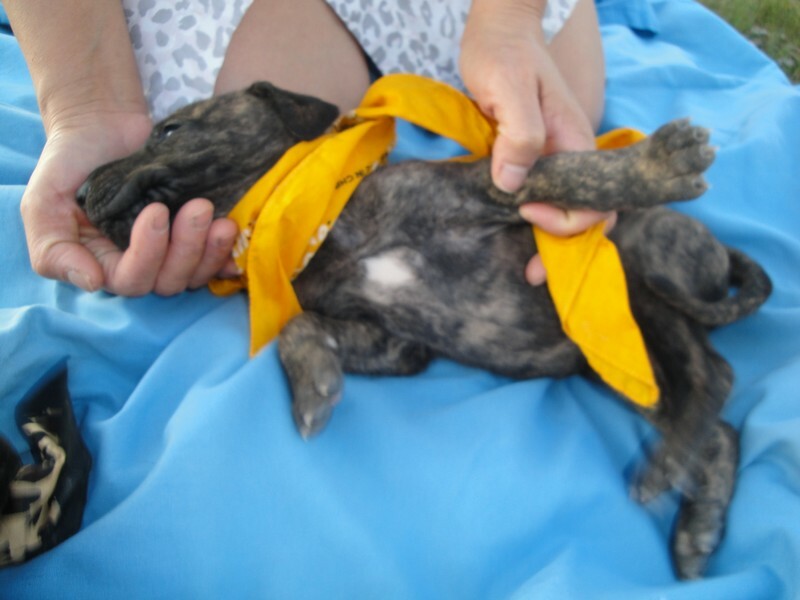 About the Third week and weekly there after we use a gentle round and hookworm medication. 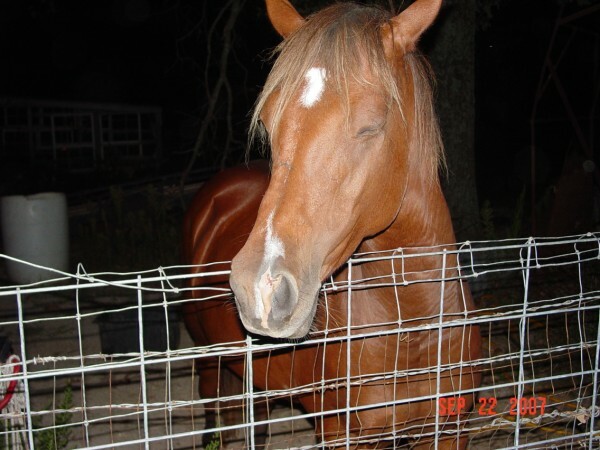 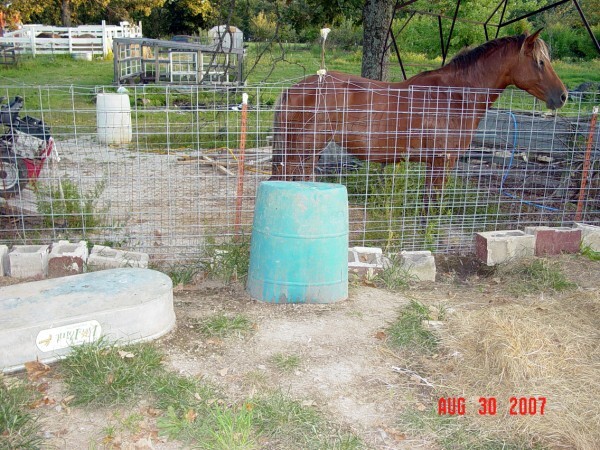 Then by the 6th-week we substitute the weekly wormer with a 3-day application of Panacure. 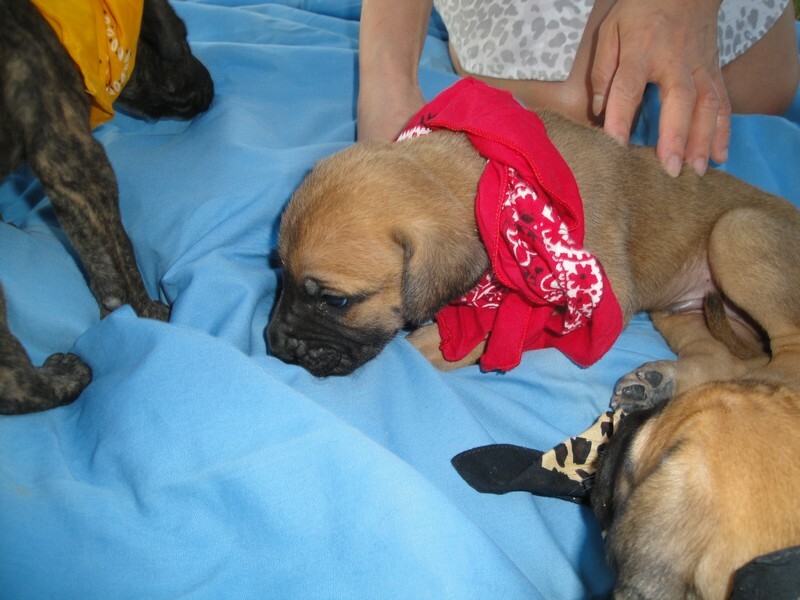 About the Fifth week we provide a 5-way puppy Parvo. 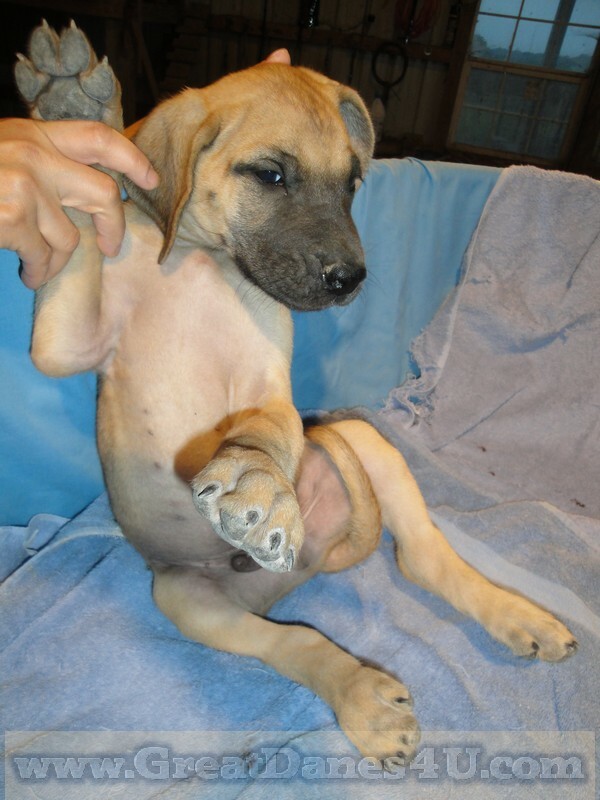 We give Parvo plus Lepto in the 8th week. 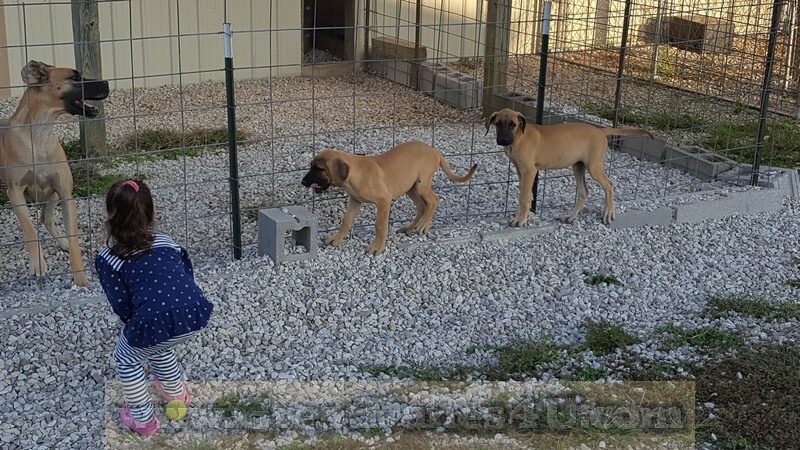 We also provide 2 applications of Kennel Cough (Bordetella Bronchiseptica) medications that are helpful should you ever find a need to board your baby. 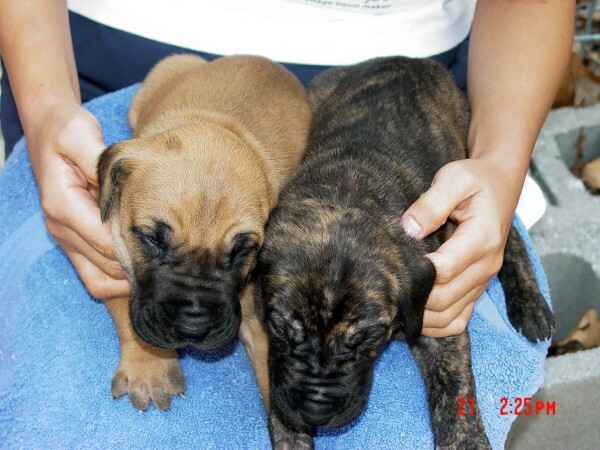 I use SMZ-TMP for 10 days to treat Coccidia during the 7th & 8th week so you can have the best medicated pup ready for your family that will reduce your trips and expenses at your Vet! 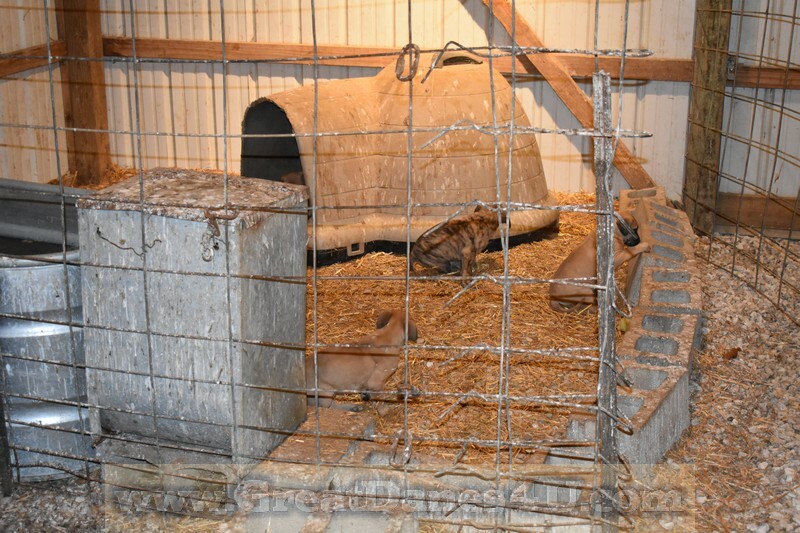 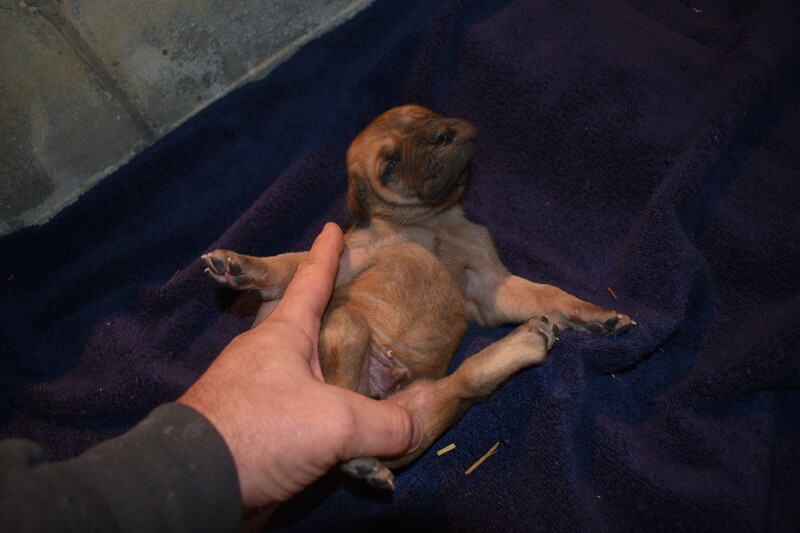 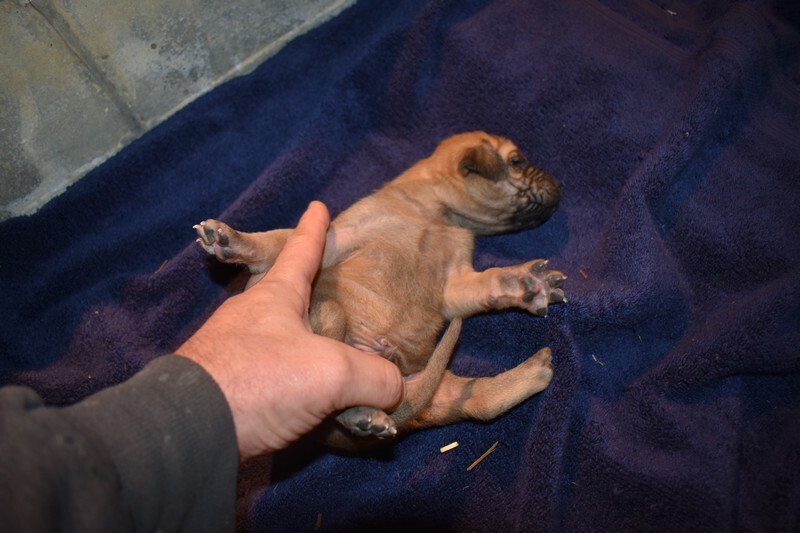 The puppies are raised in a ventilated heated / cooled area where the puppies demonstrate a desire not to pee or poop where they sleep because they are kept clean and not crammed into crowded cages! 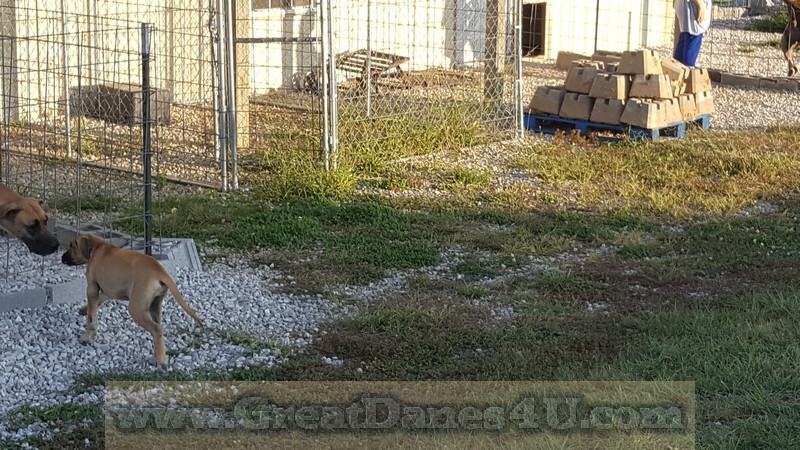 Outdoors areas are filled with a limestone non-compacting pea gravel for cleanliness, their outdoor socialization and personalization continues while becoming acclimated to outdoor temperatures as required by the FAA for air shipping if required. 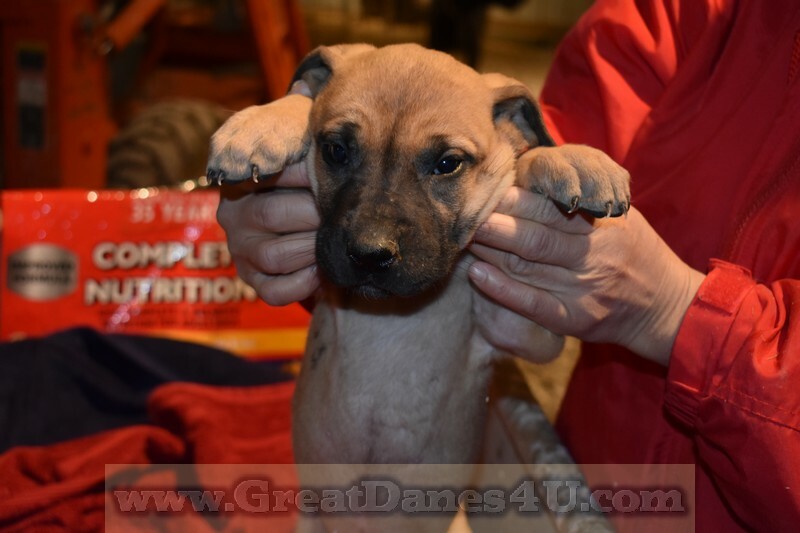 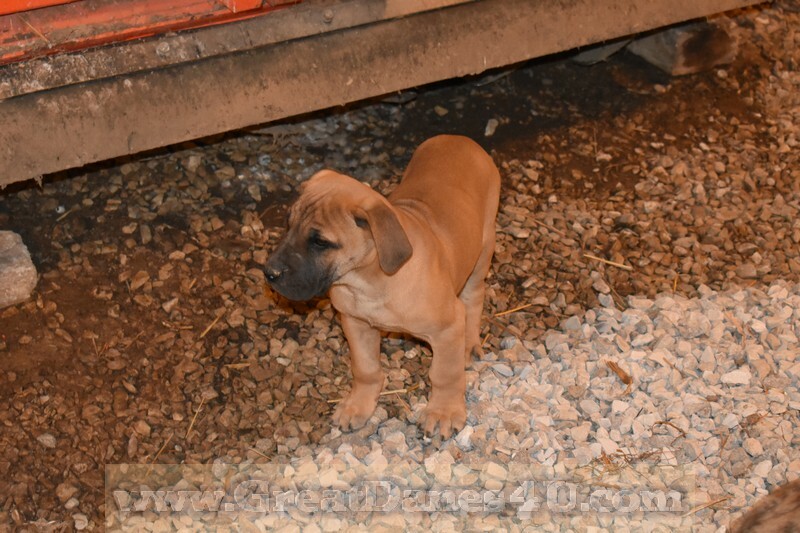 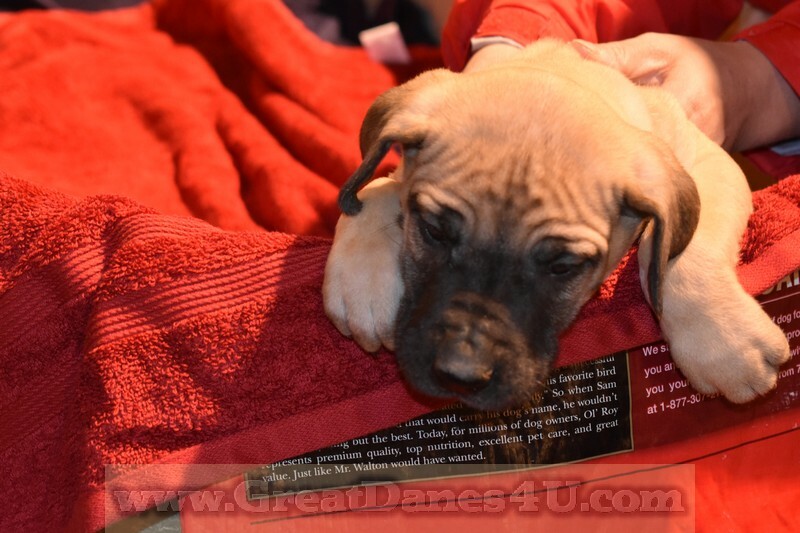 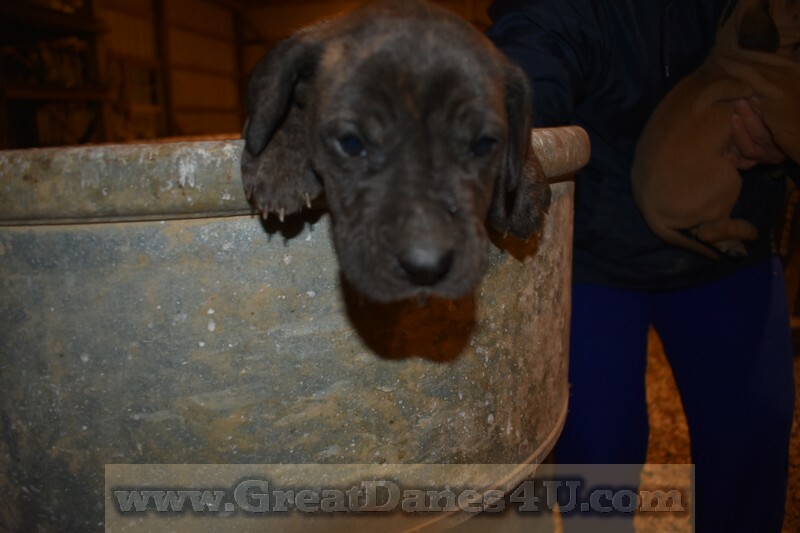 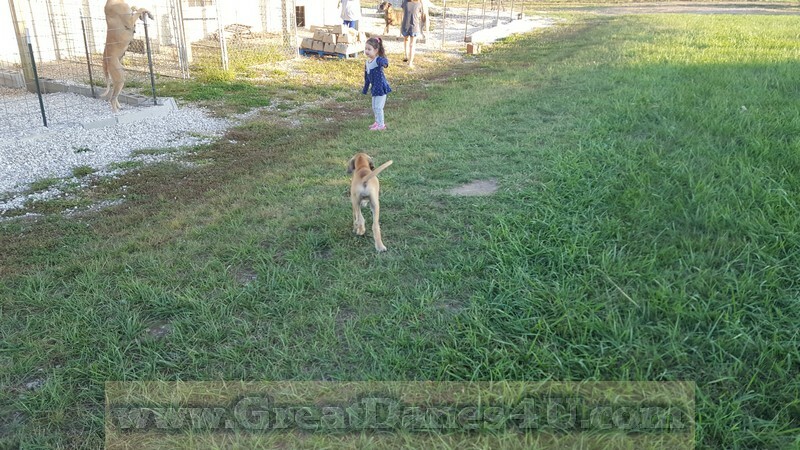 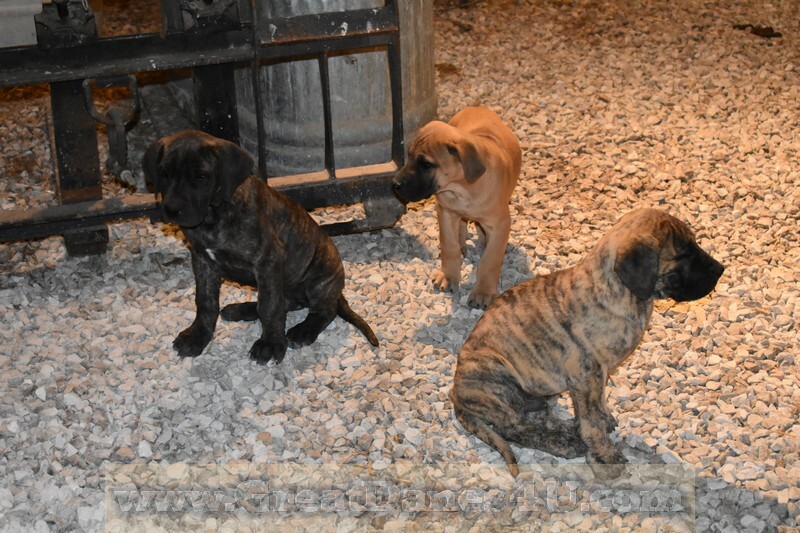 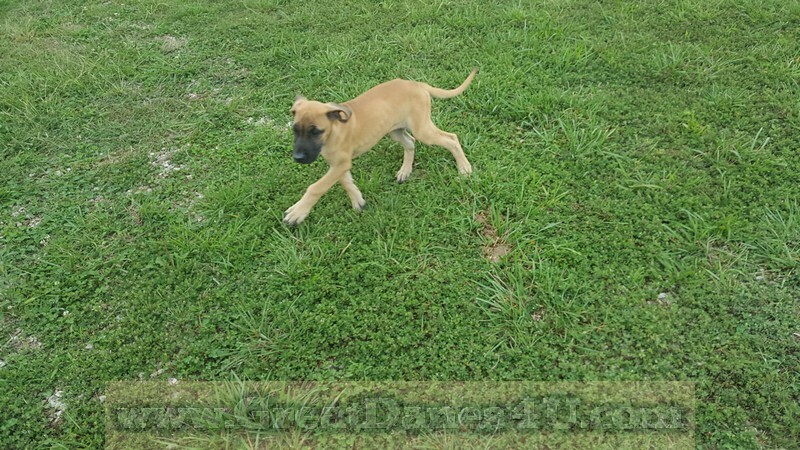 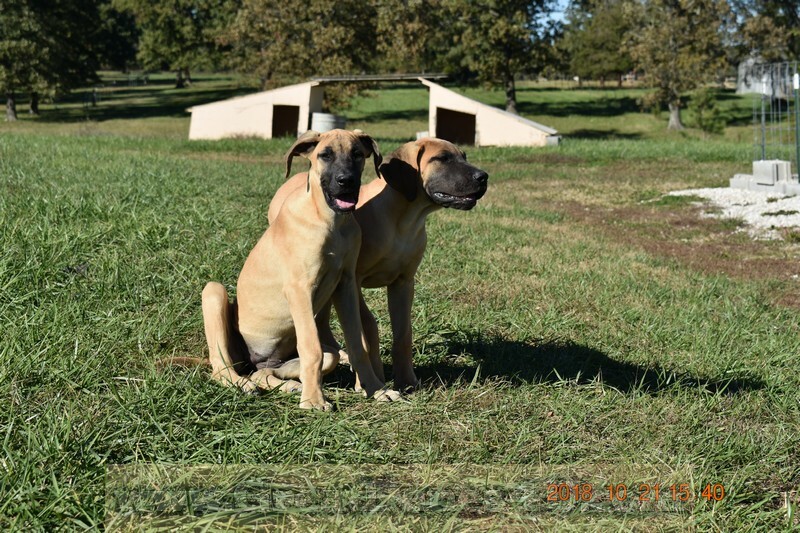 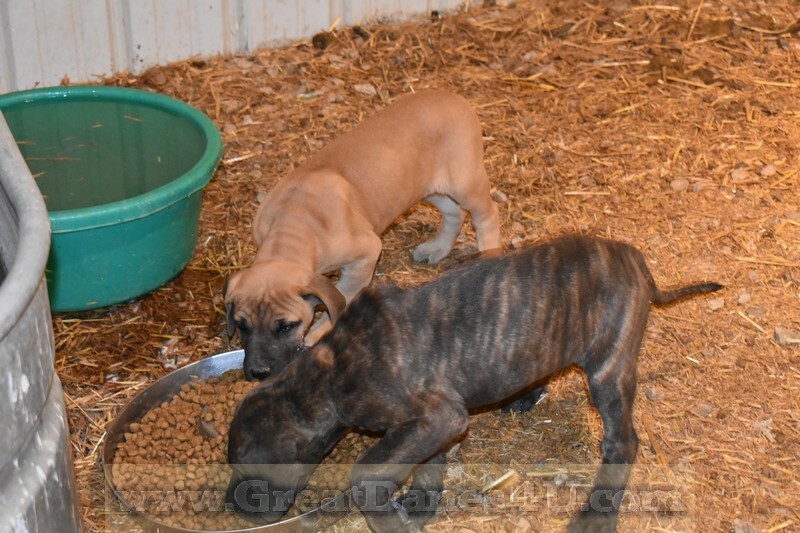 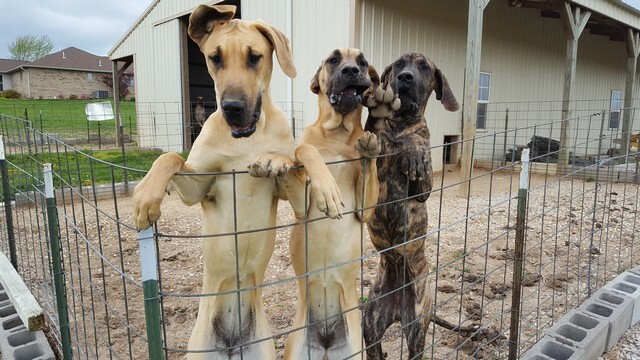 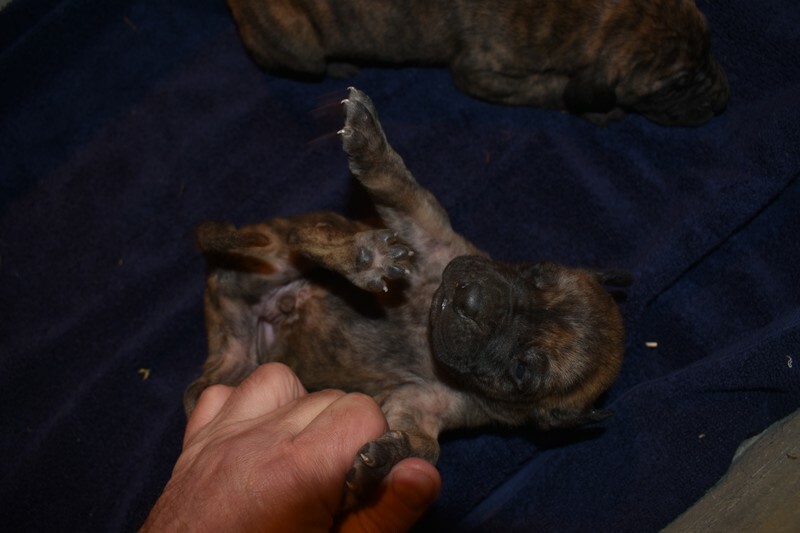 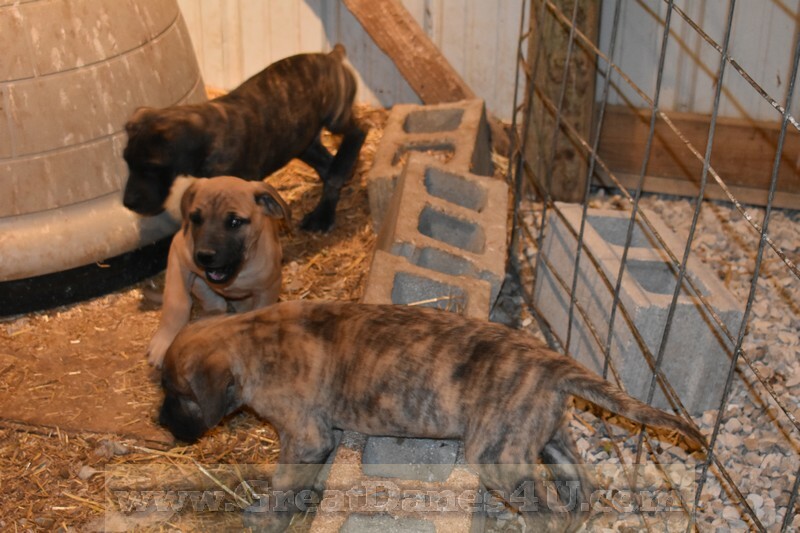 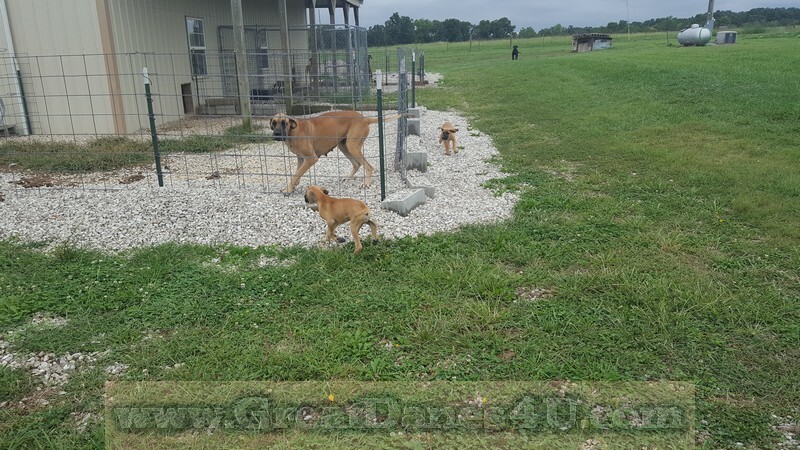 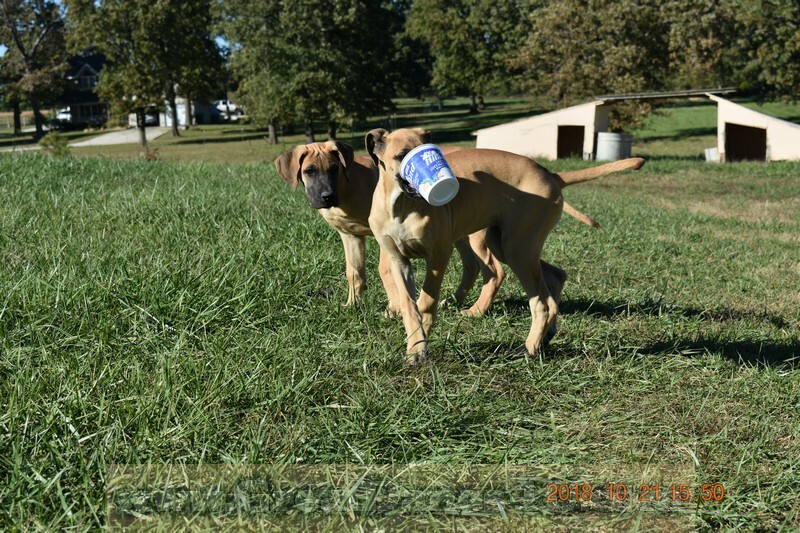 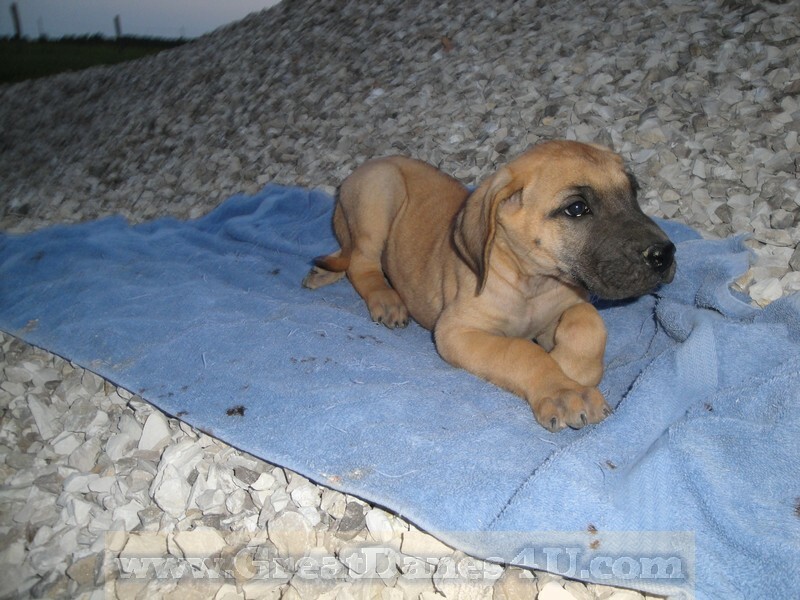 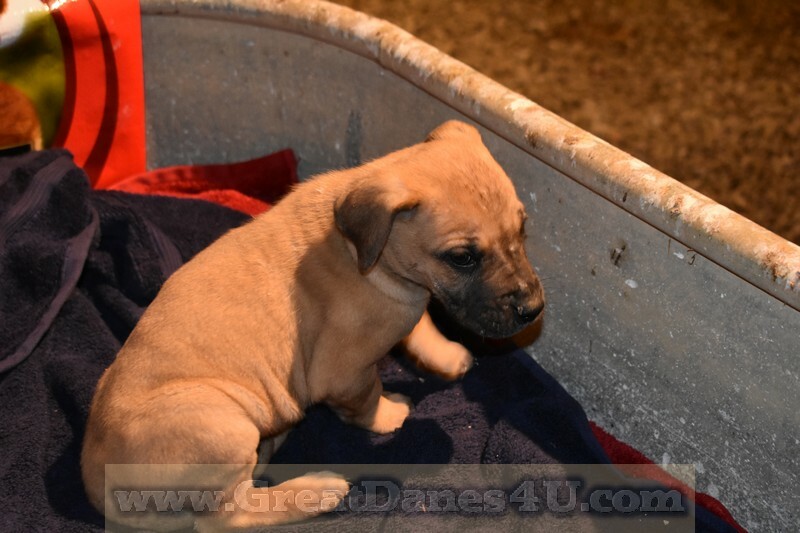 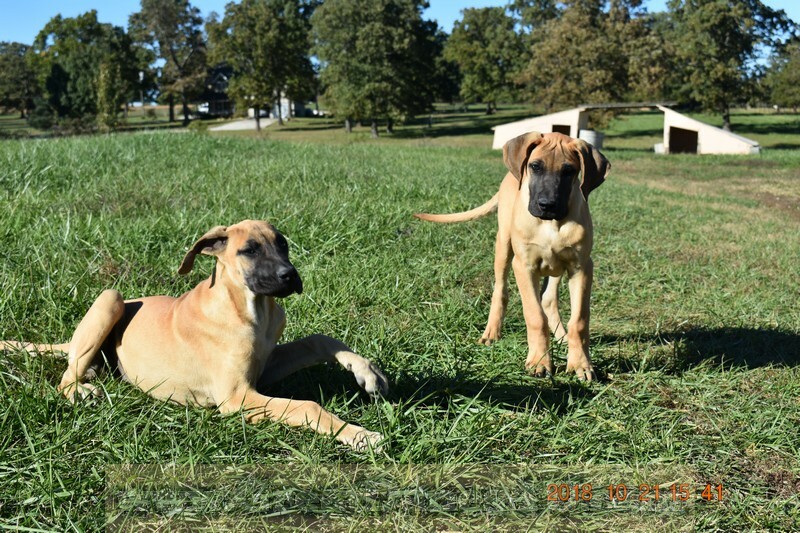 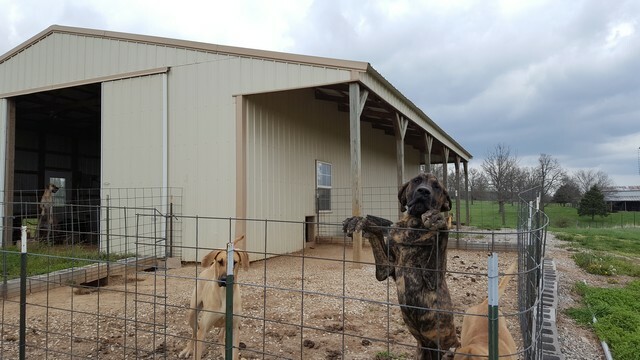 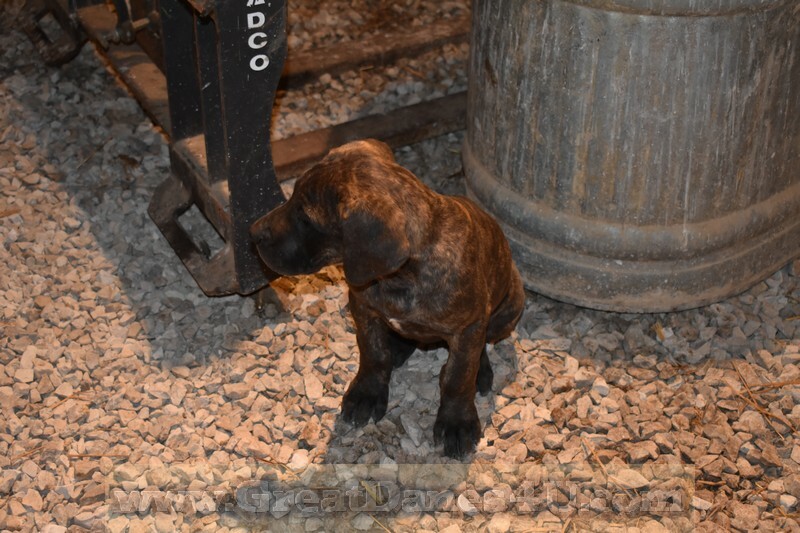 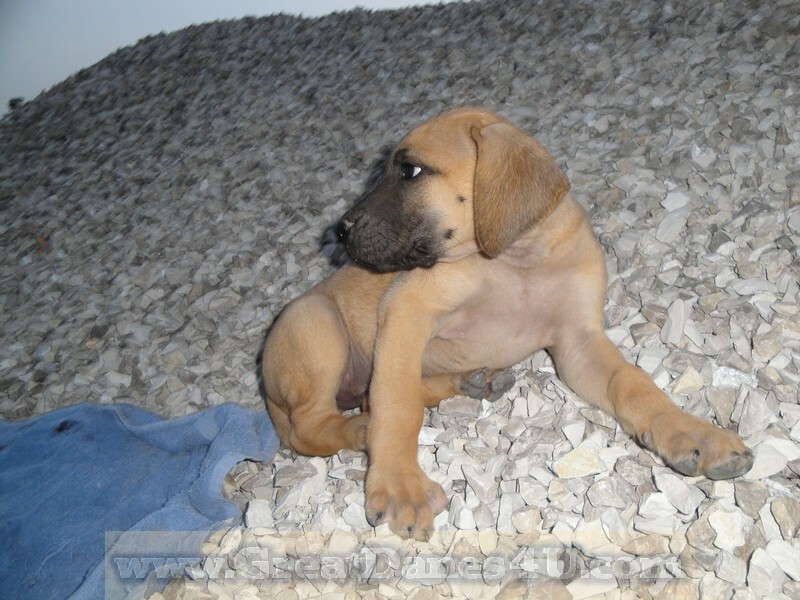 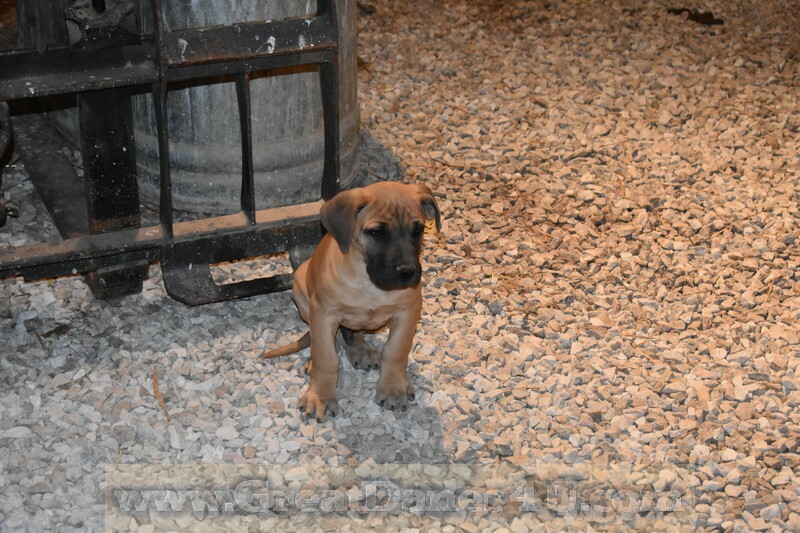 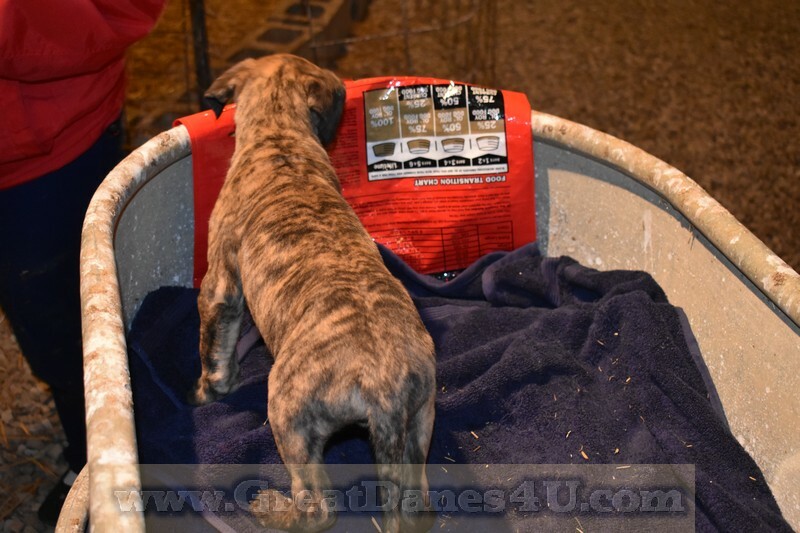 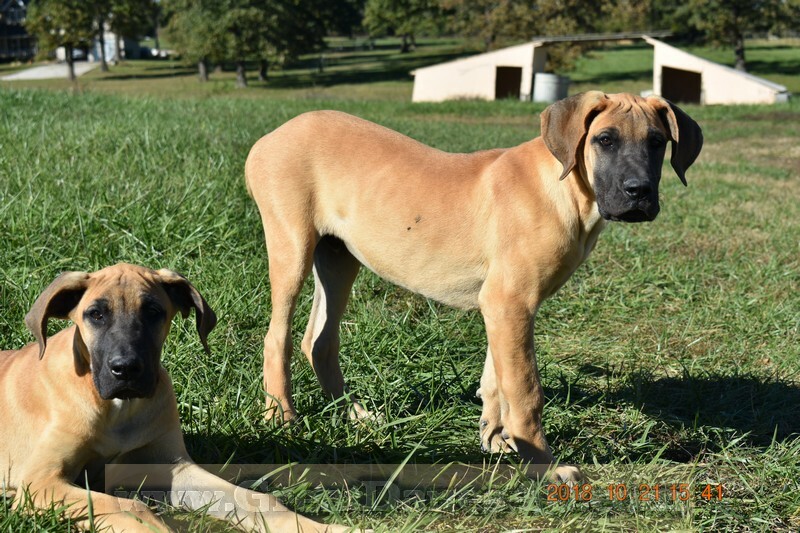 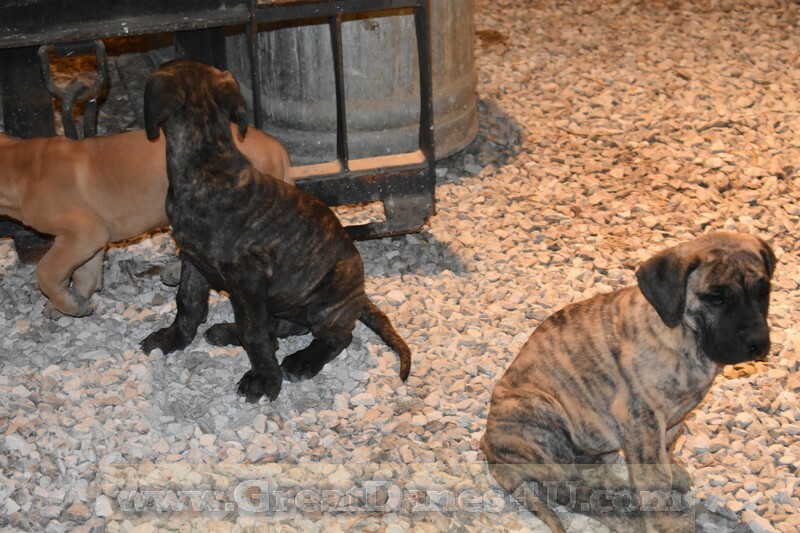 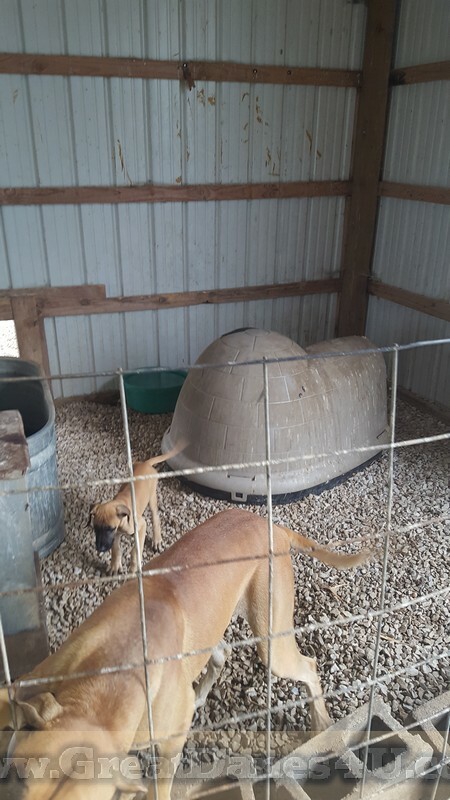 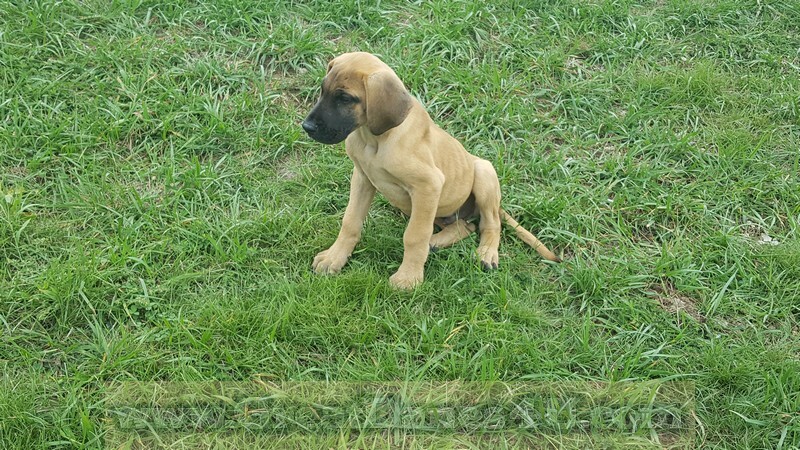 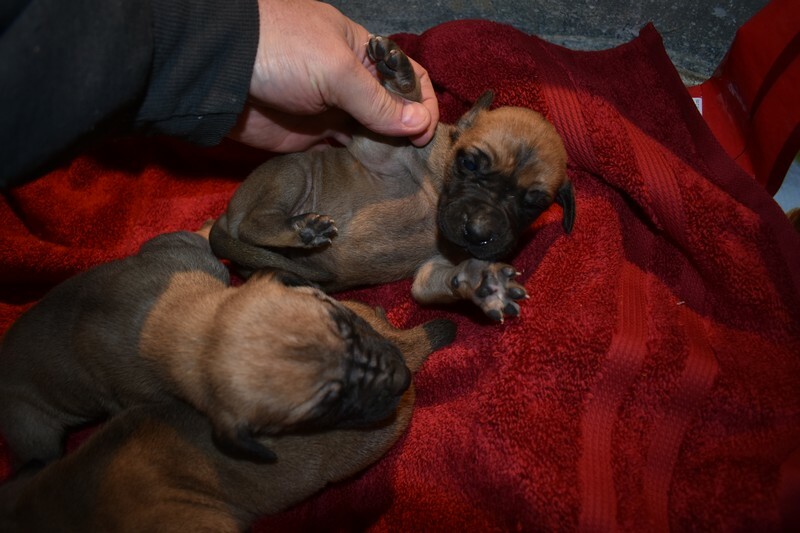 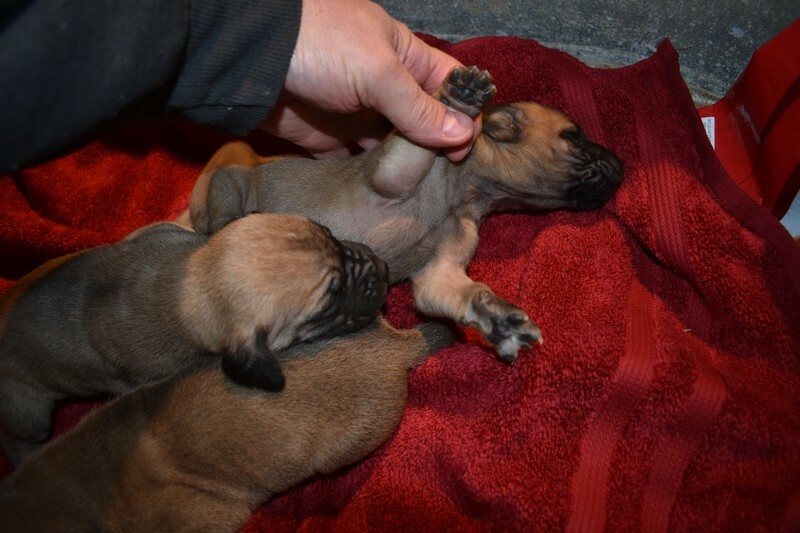 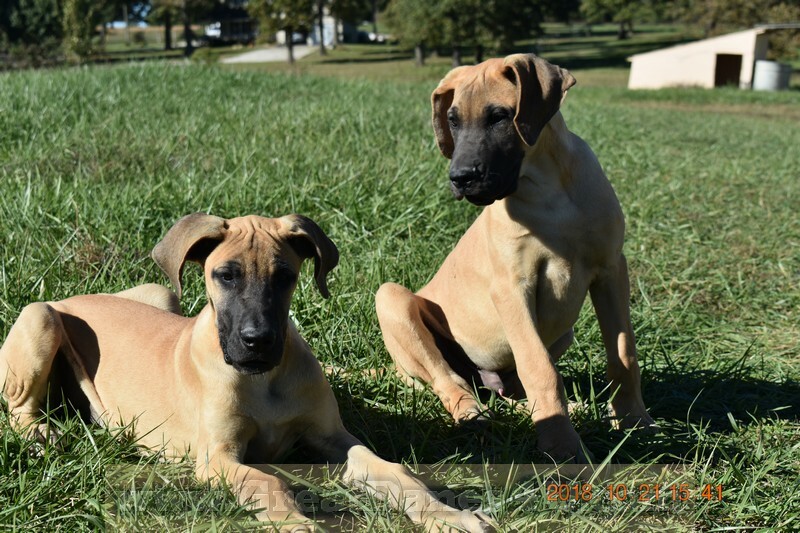 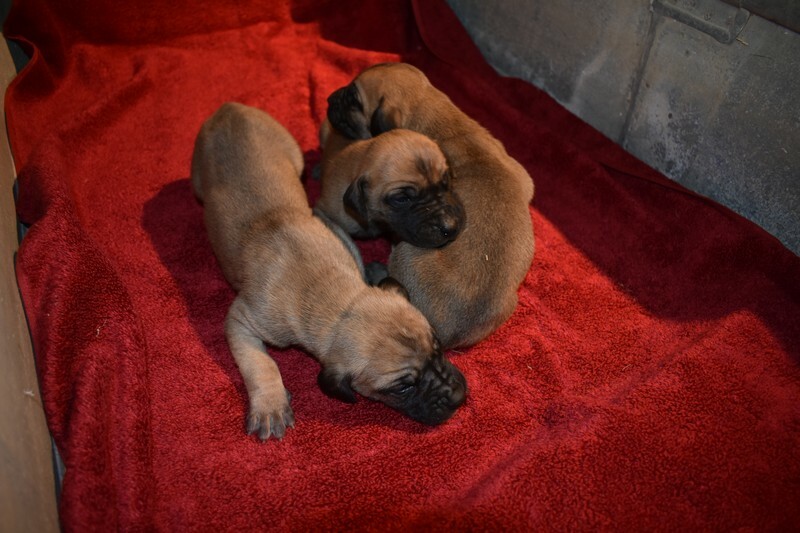 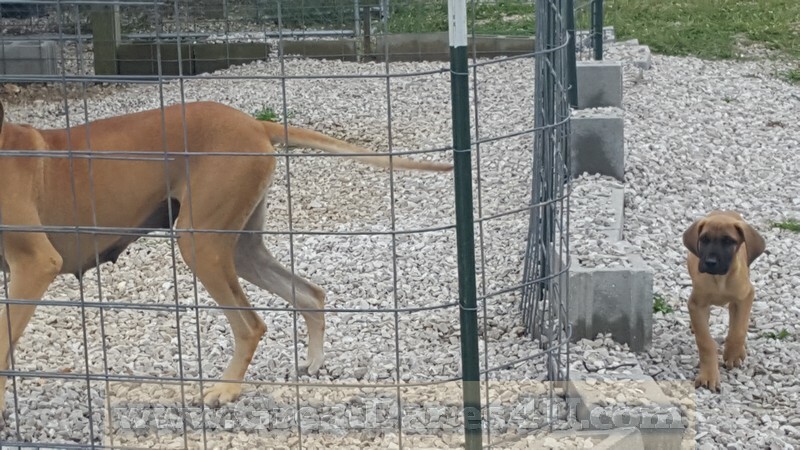 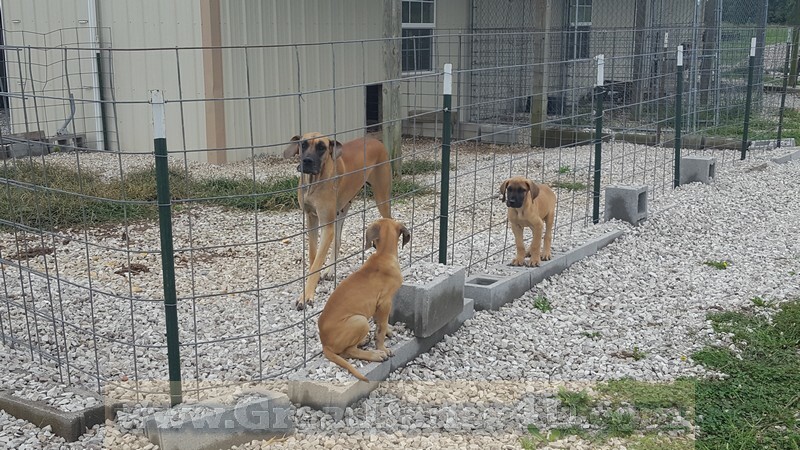 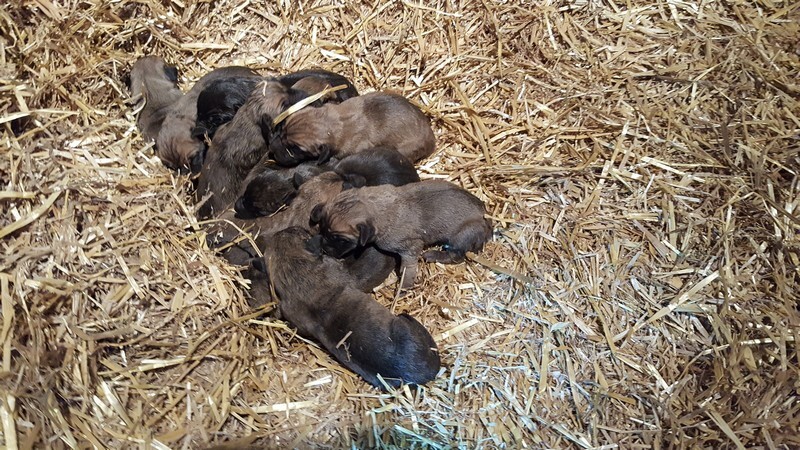 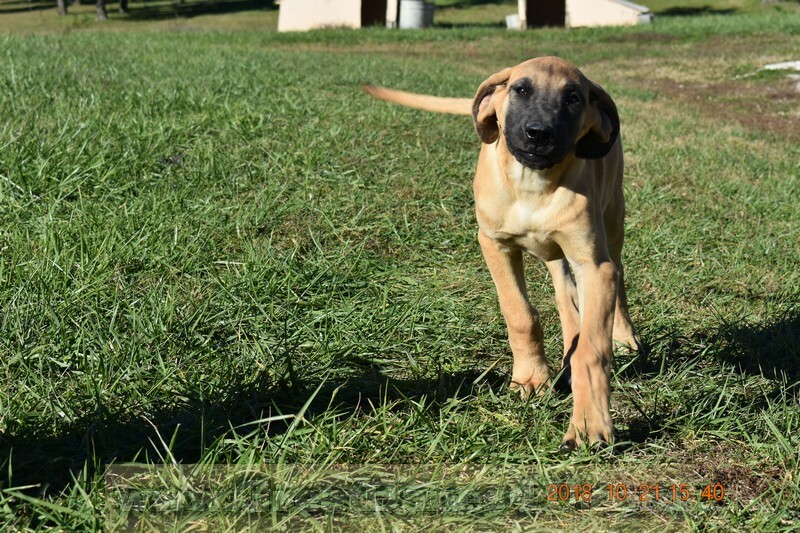 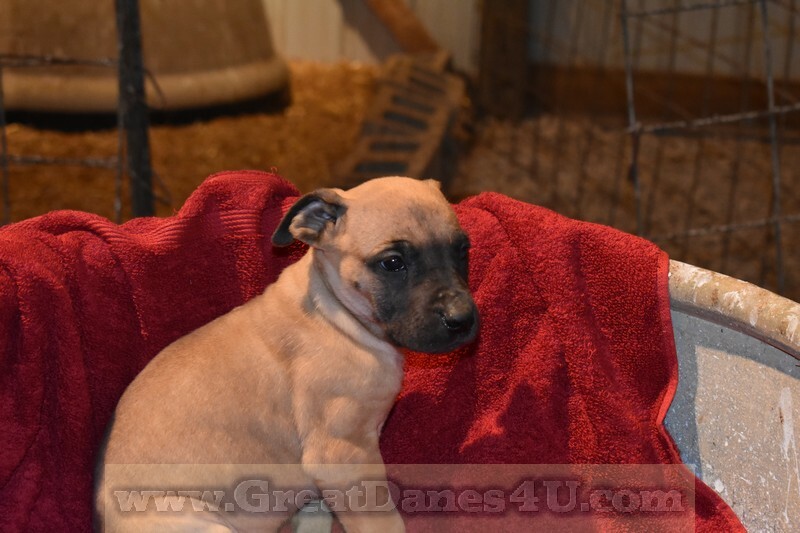 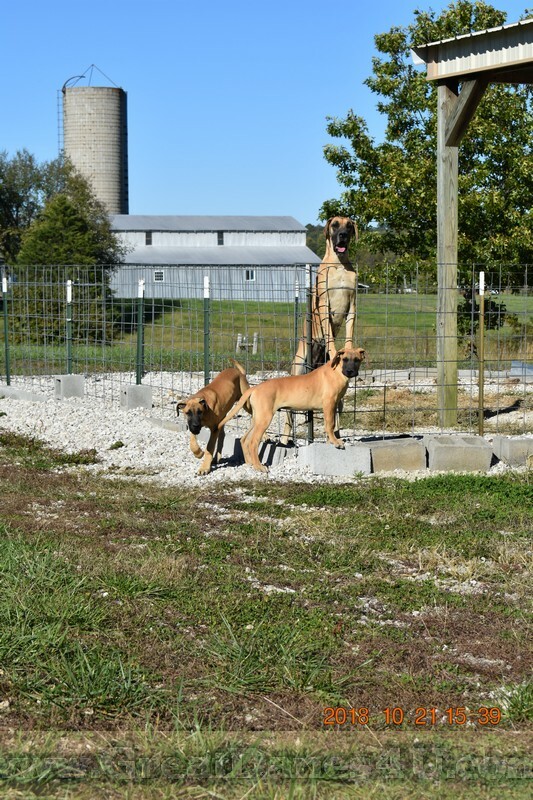 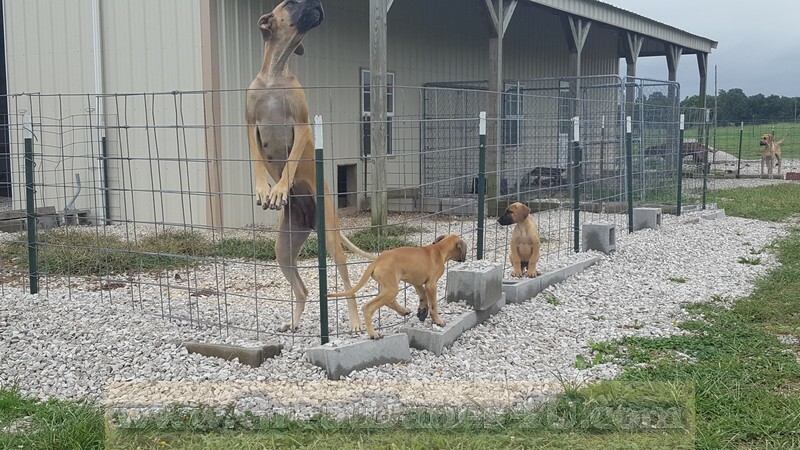 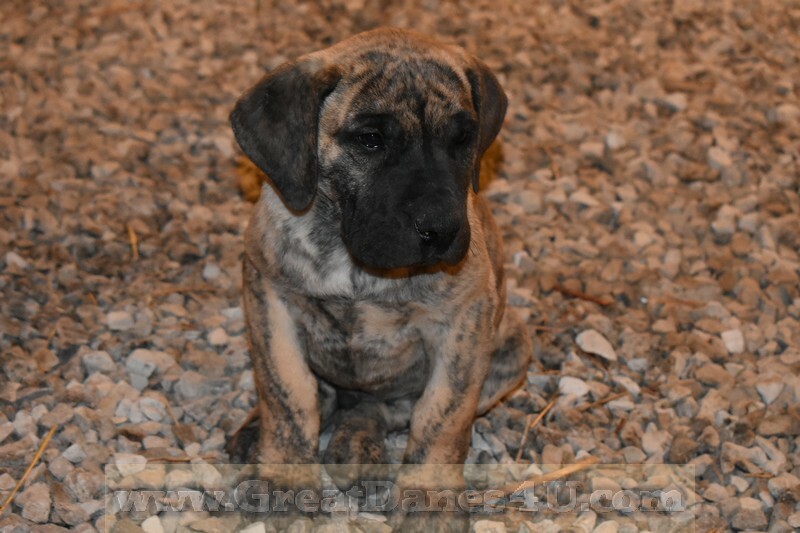 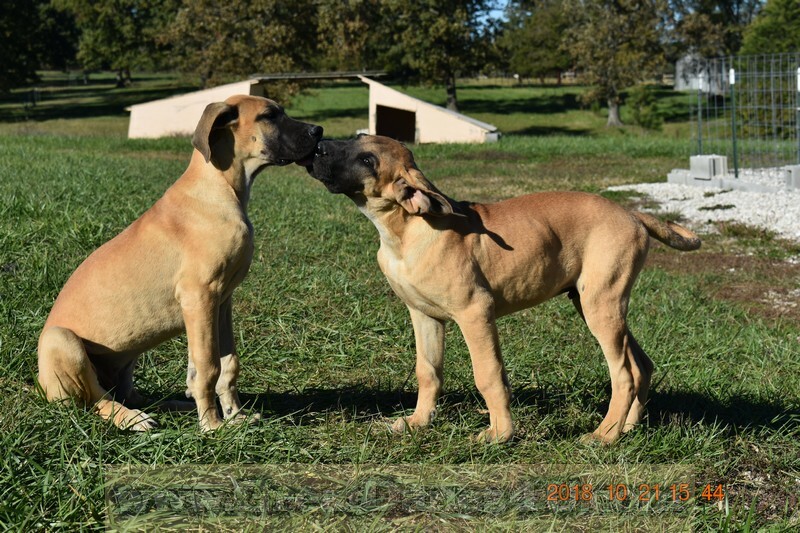 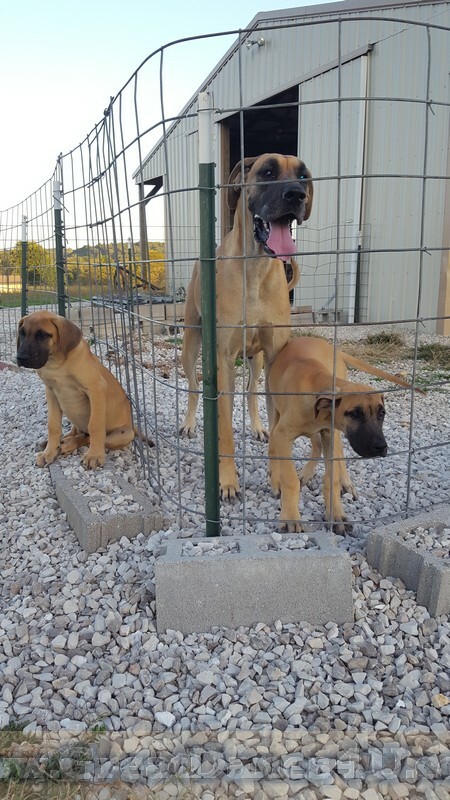 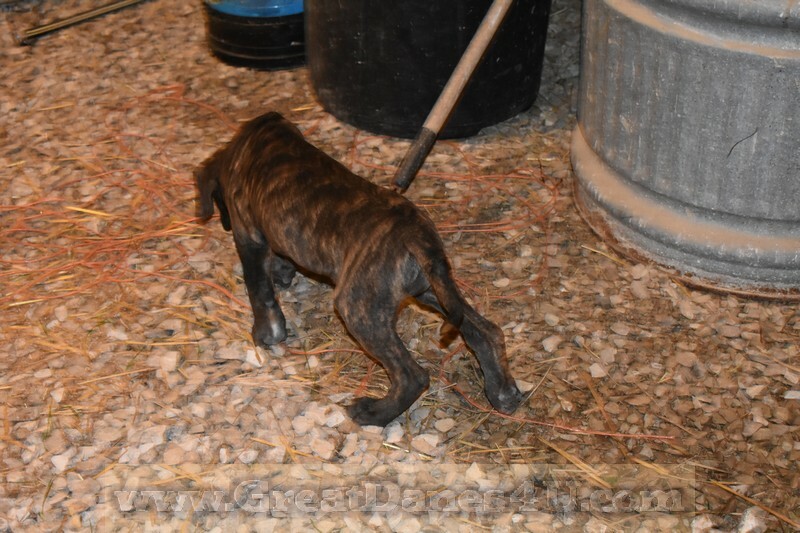 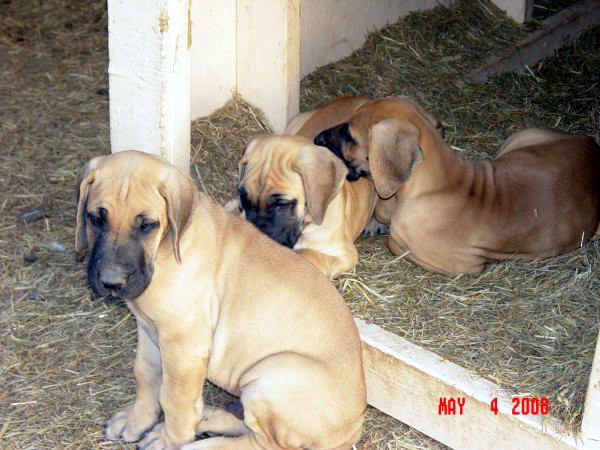 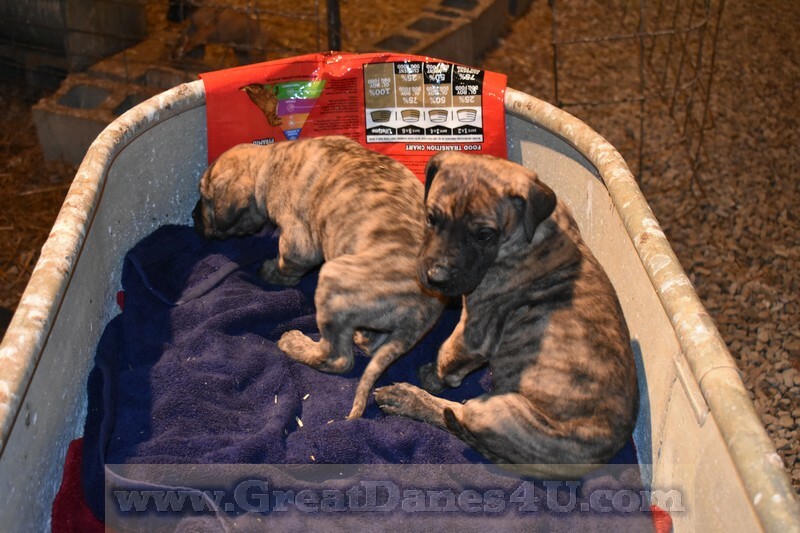 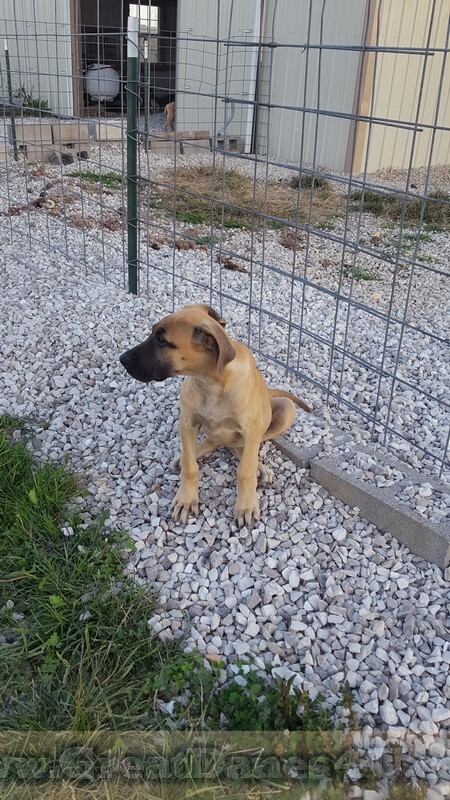 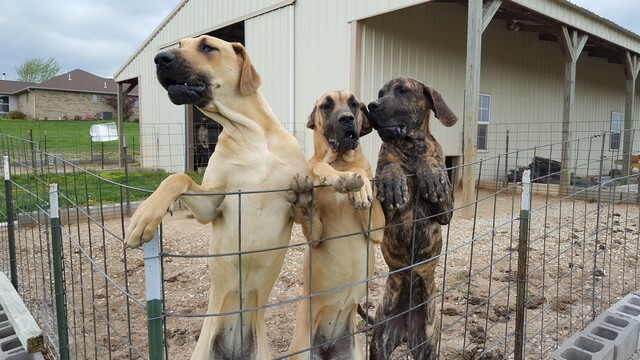 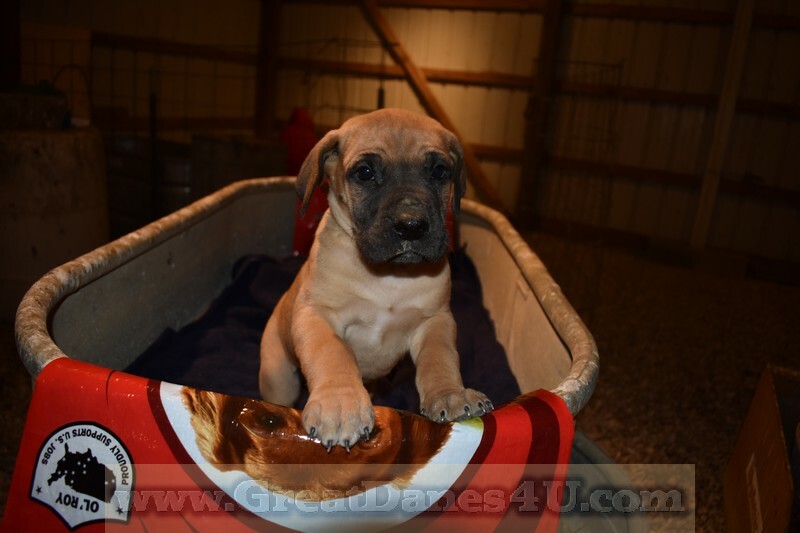 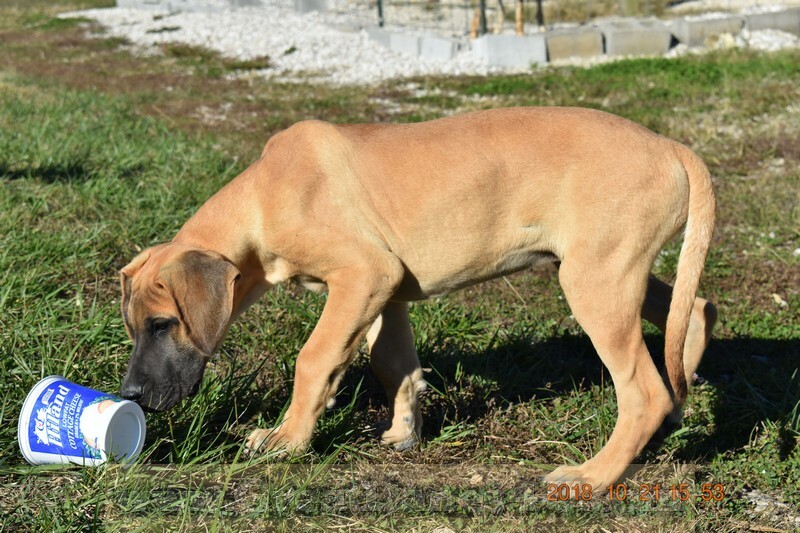 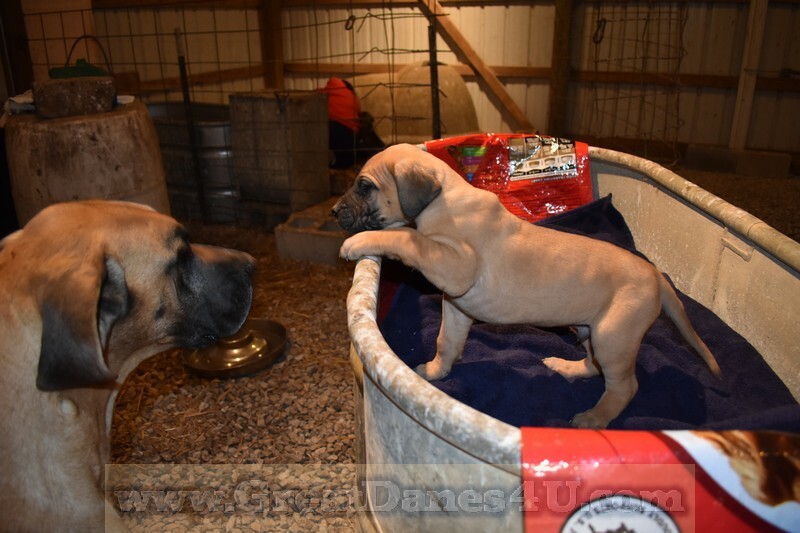 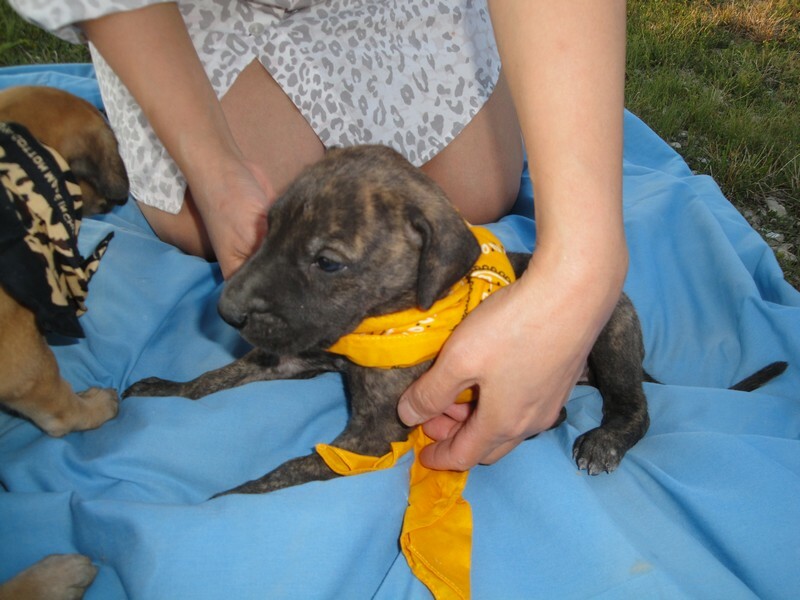 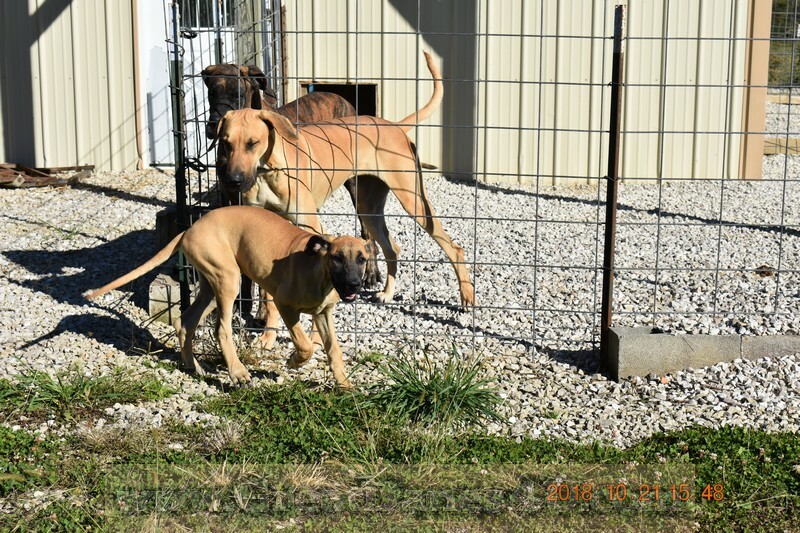 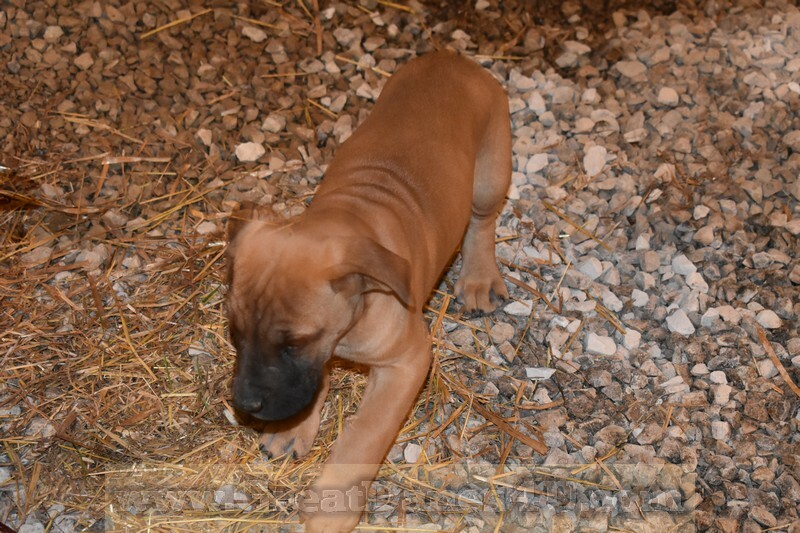 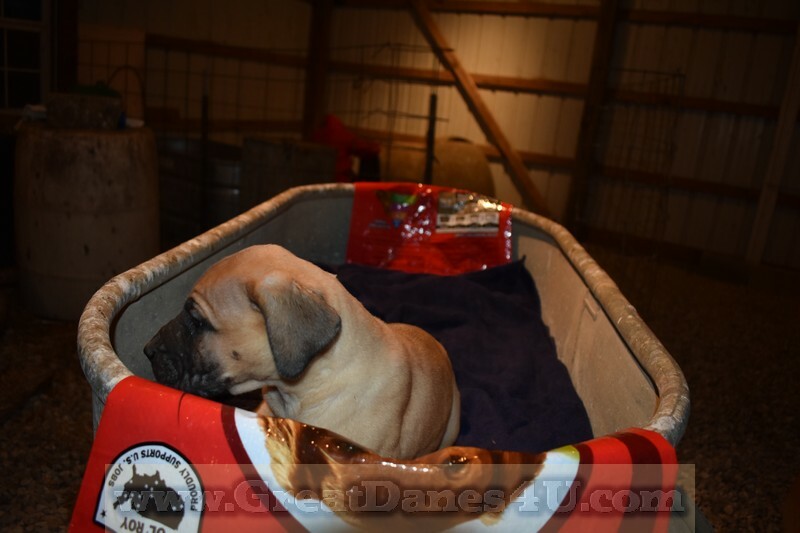 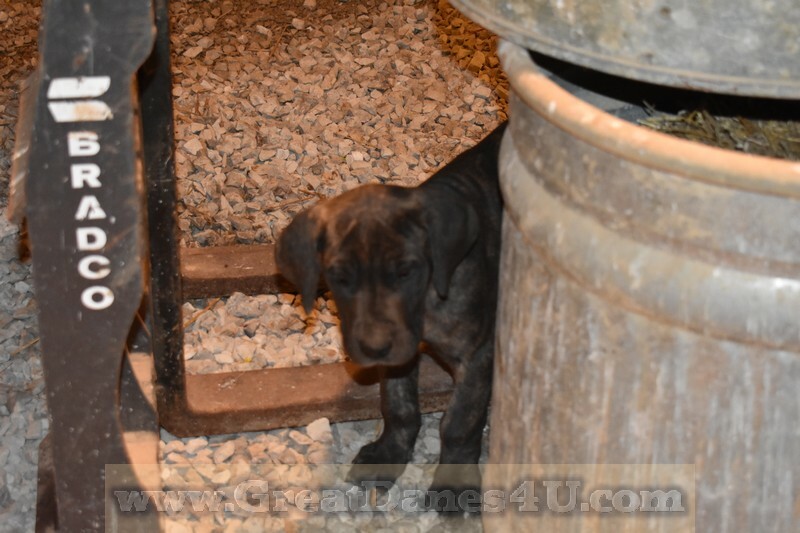 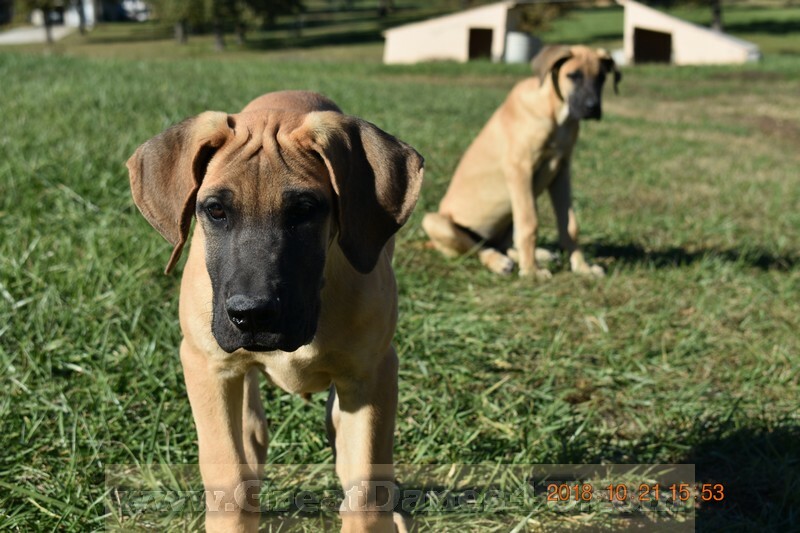 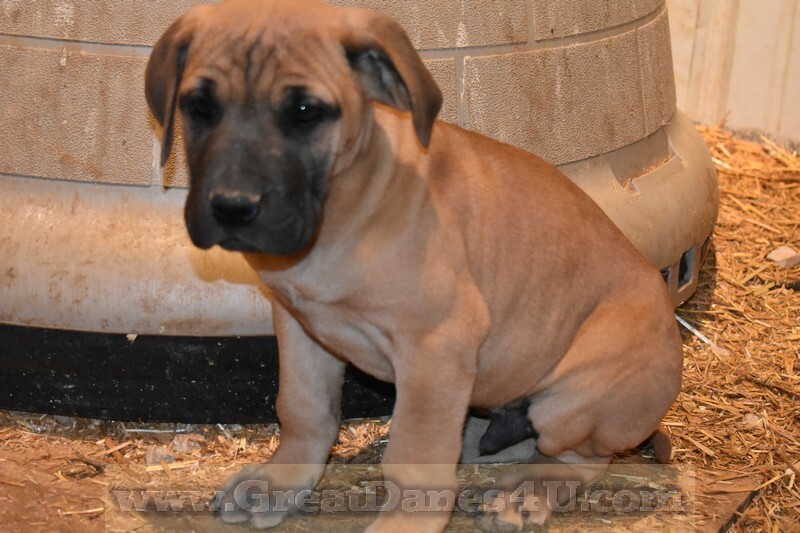 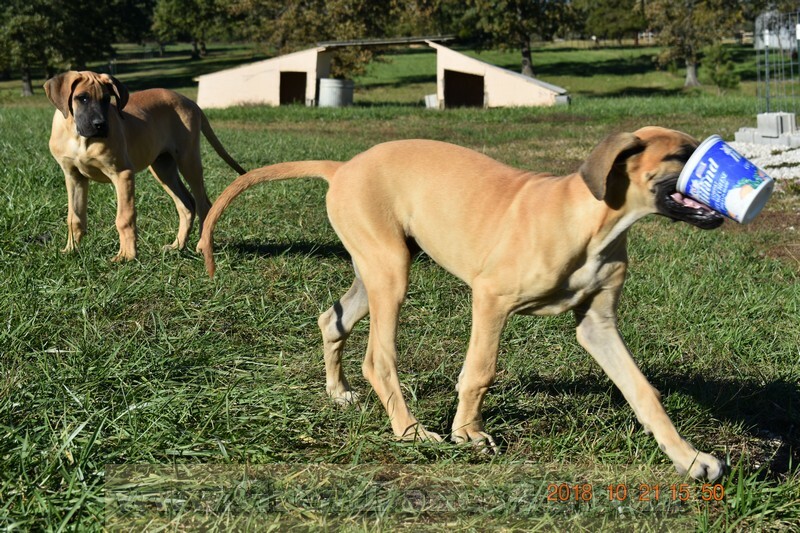 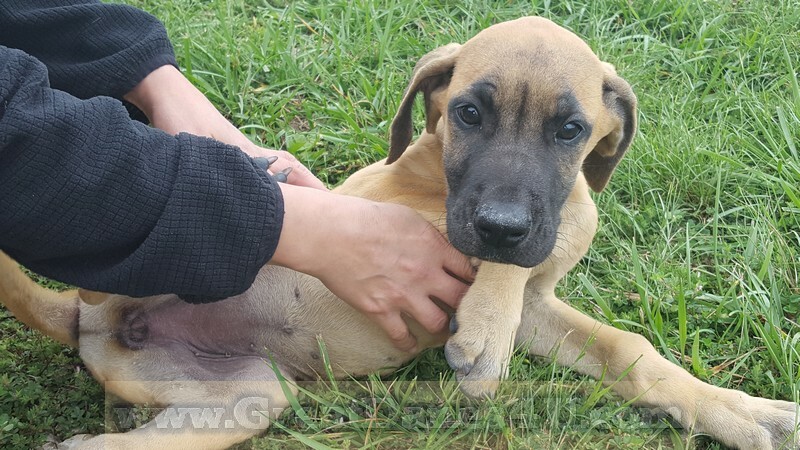 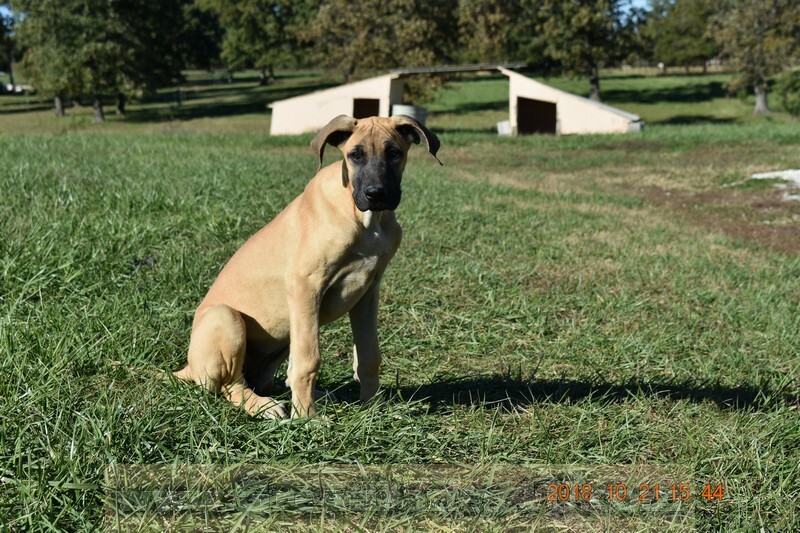 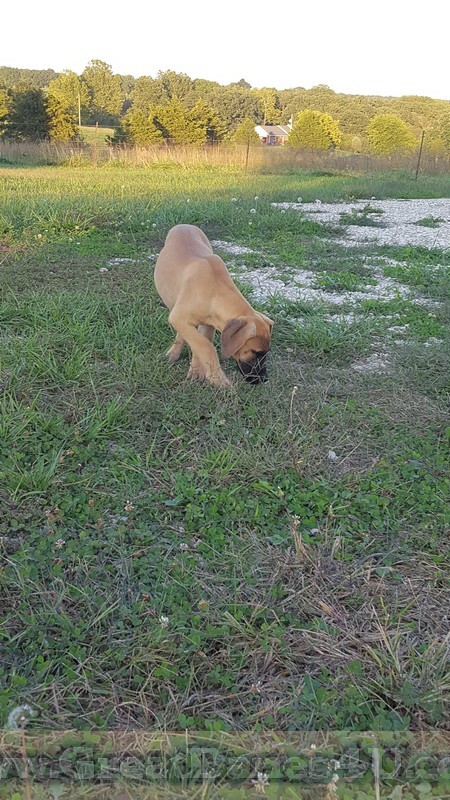 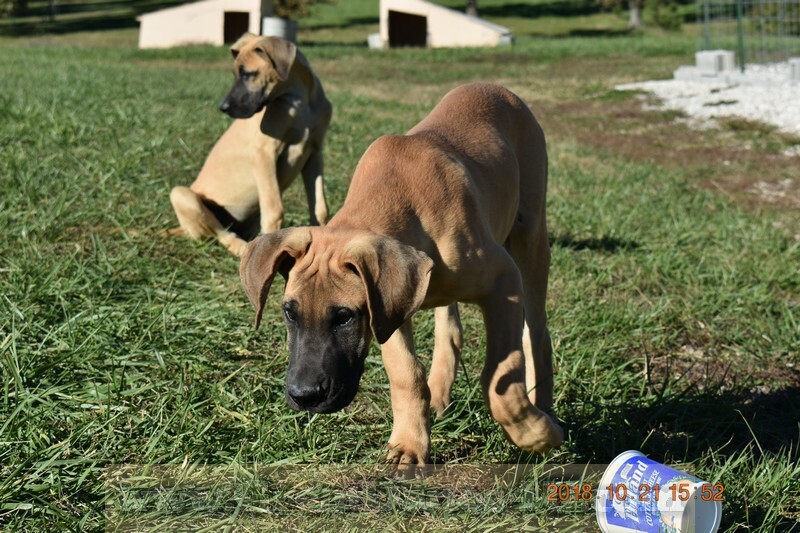 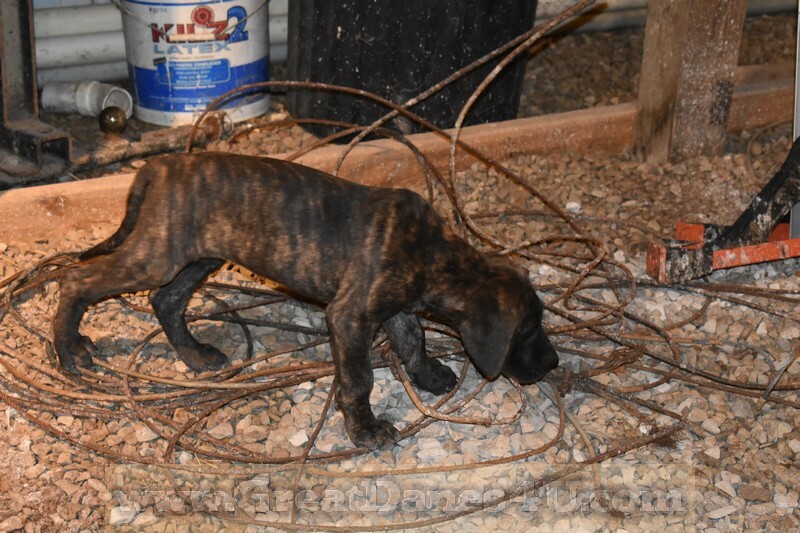 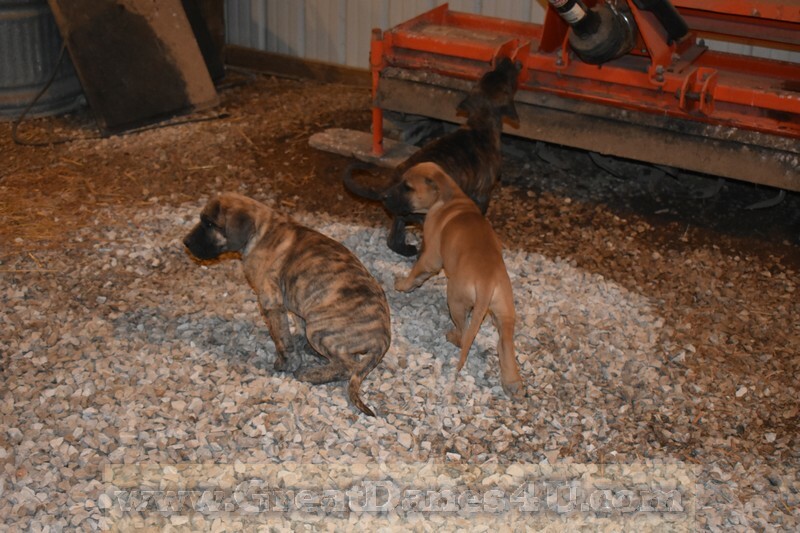 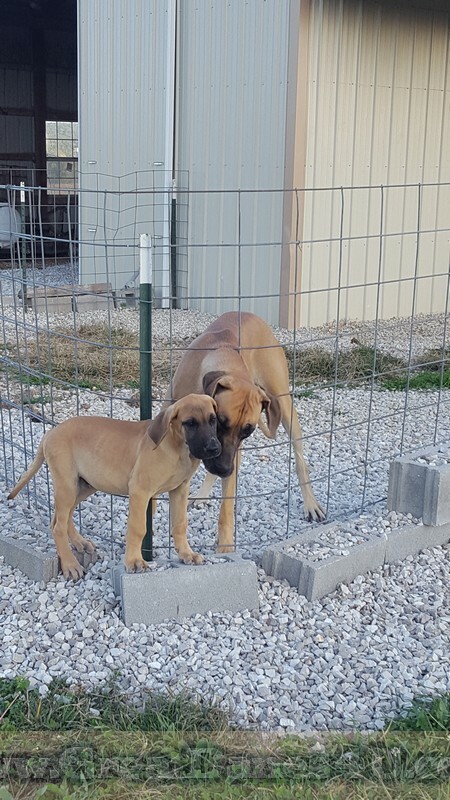 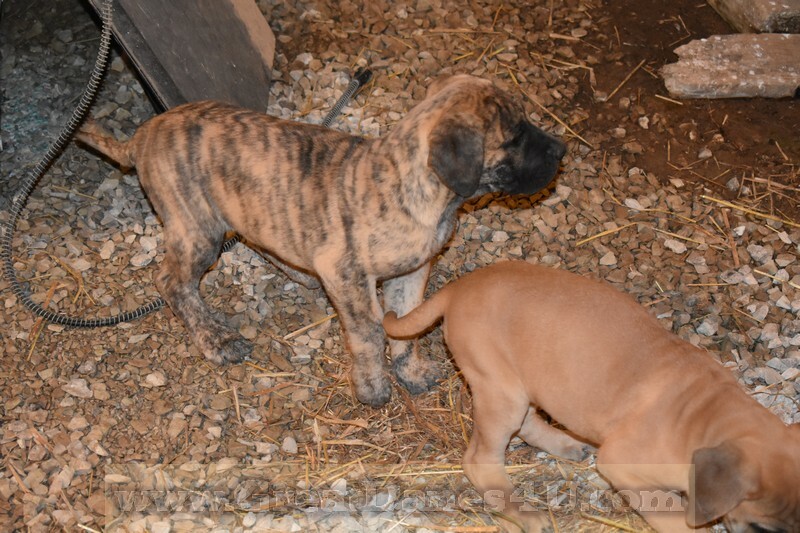 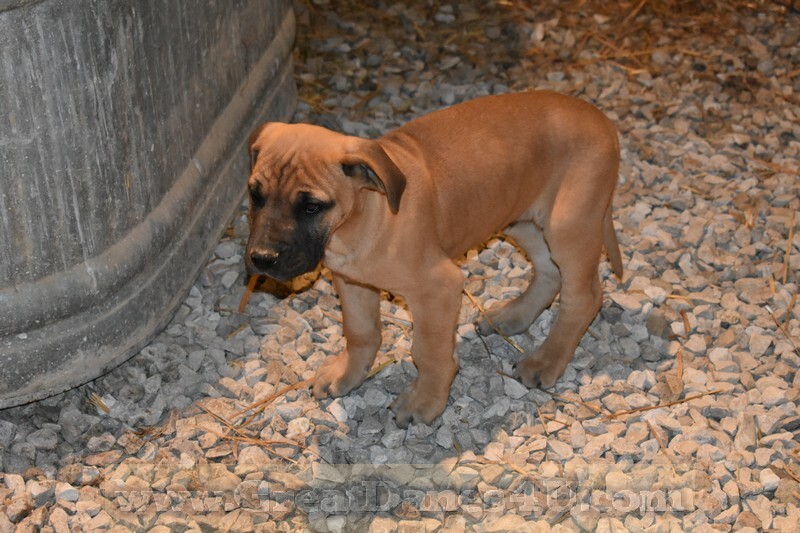 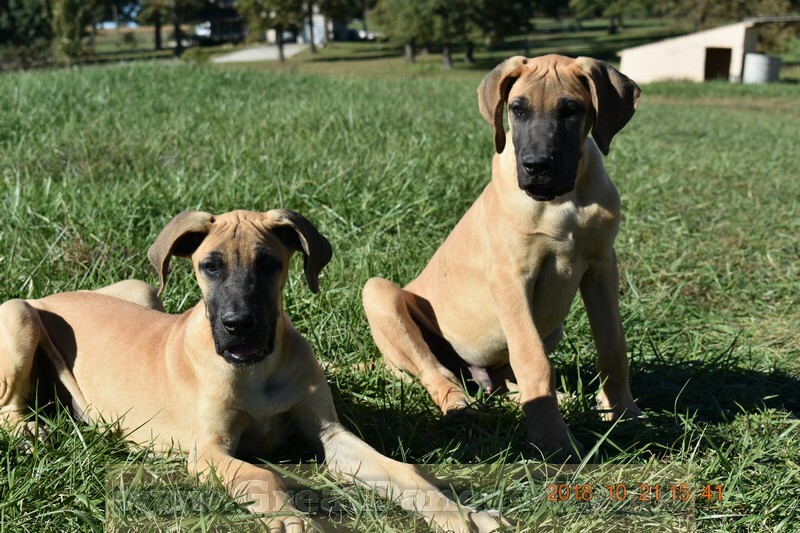 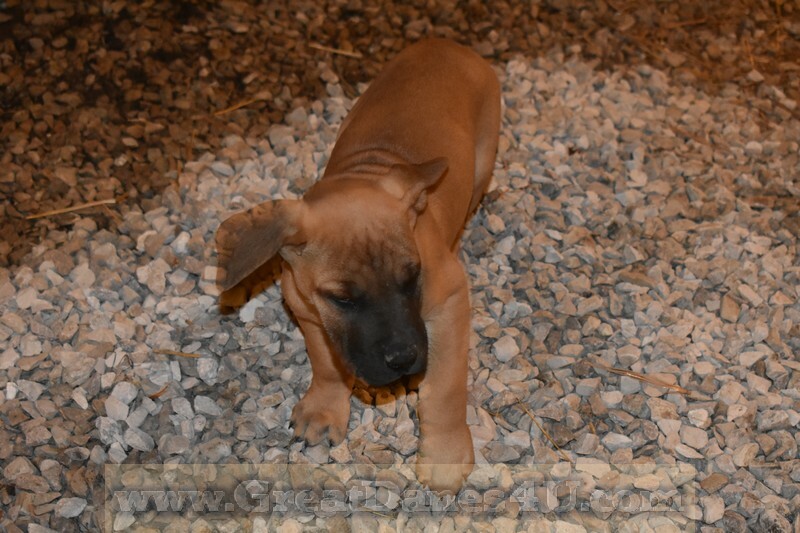 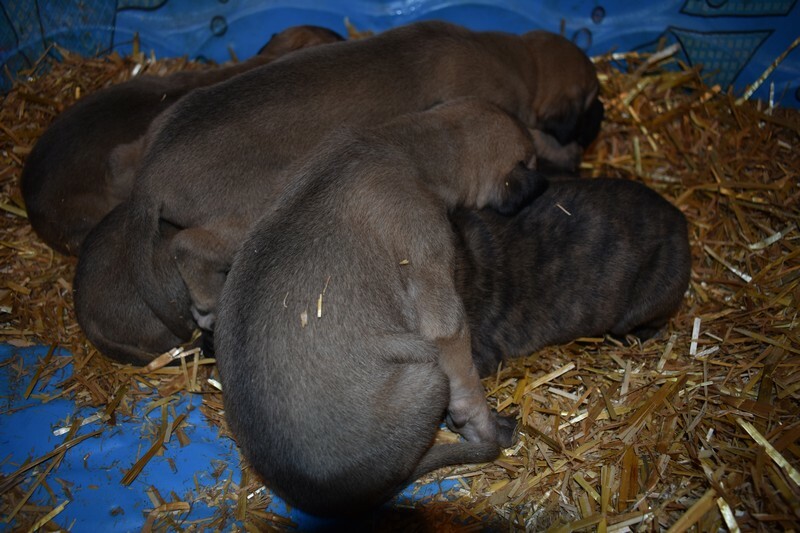 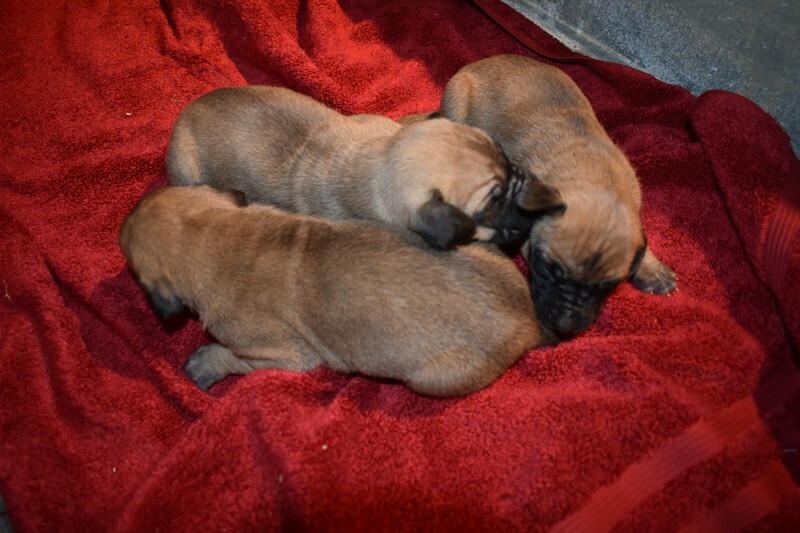 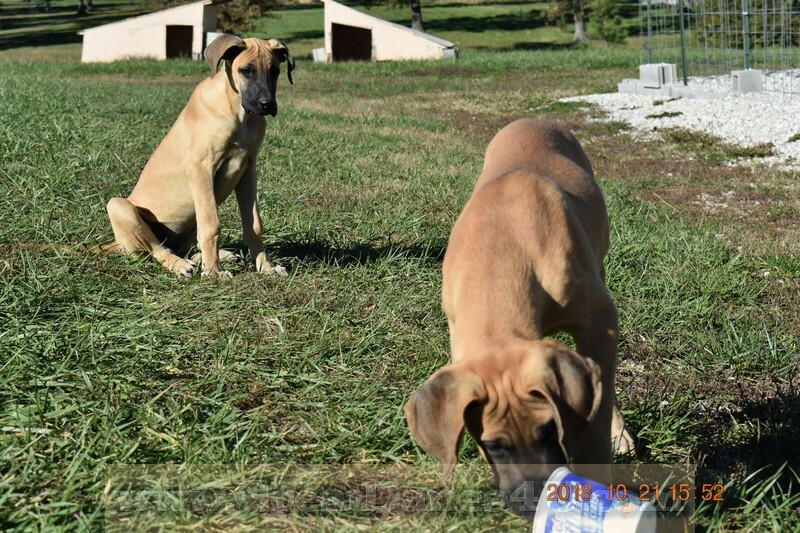 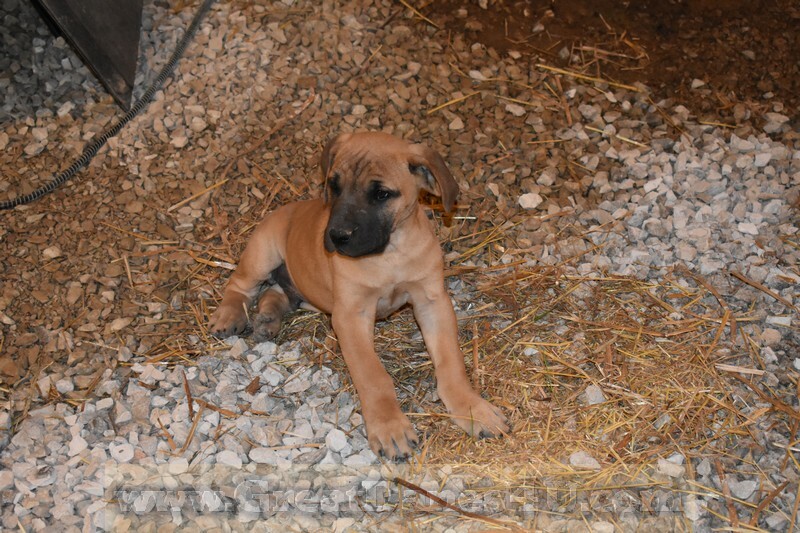 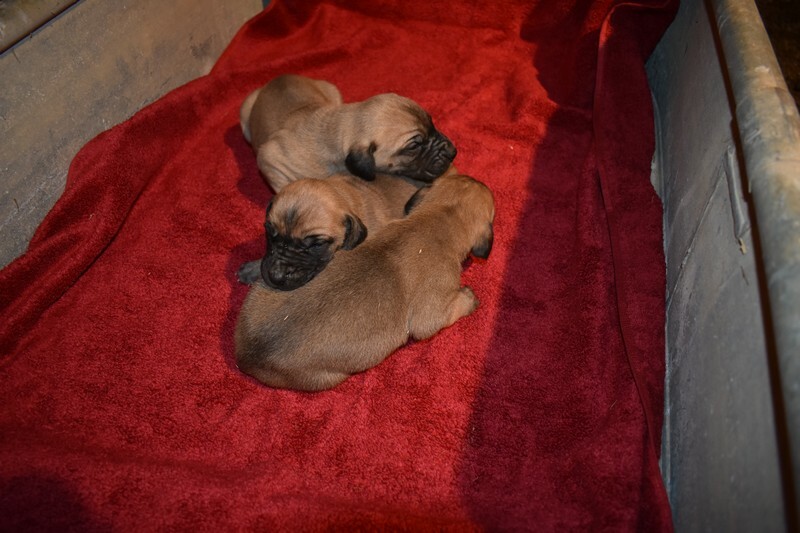 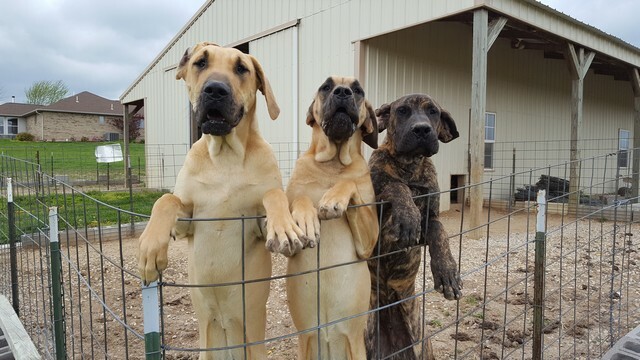 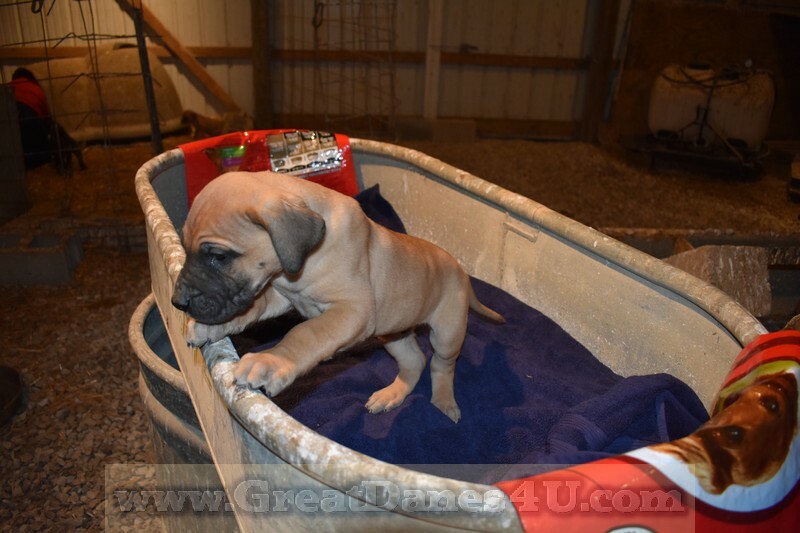 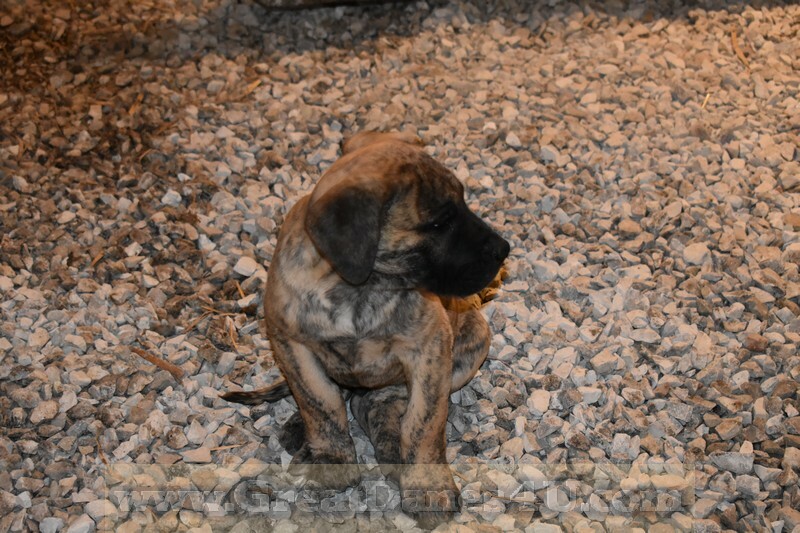 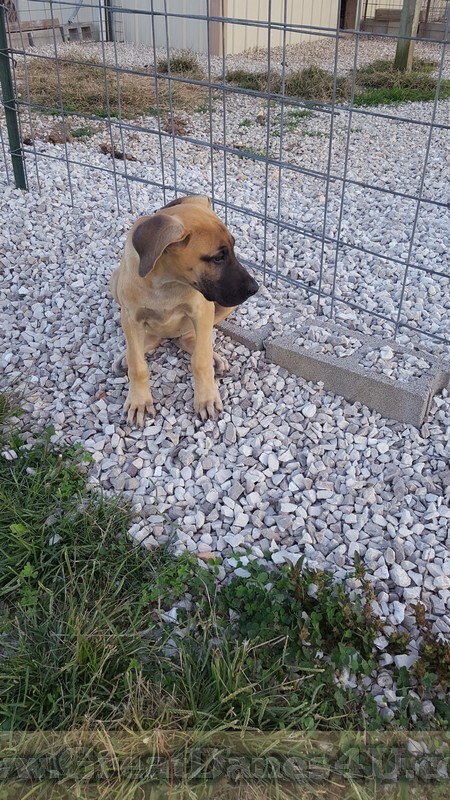 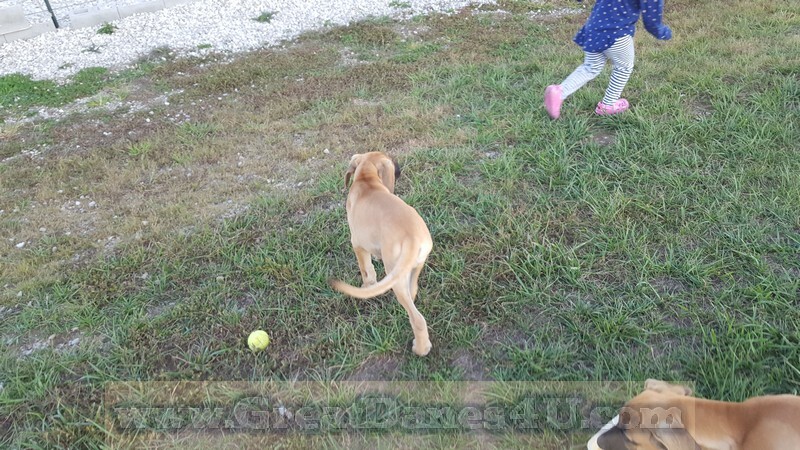 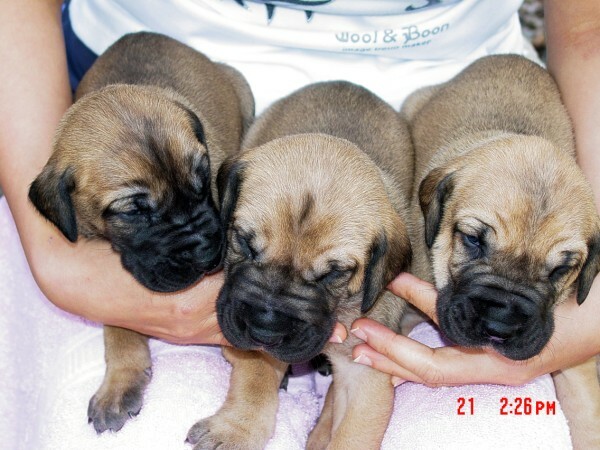 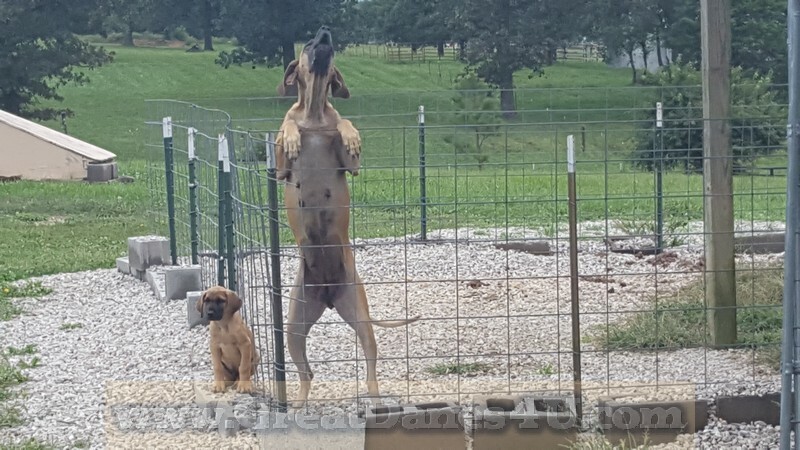 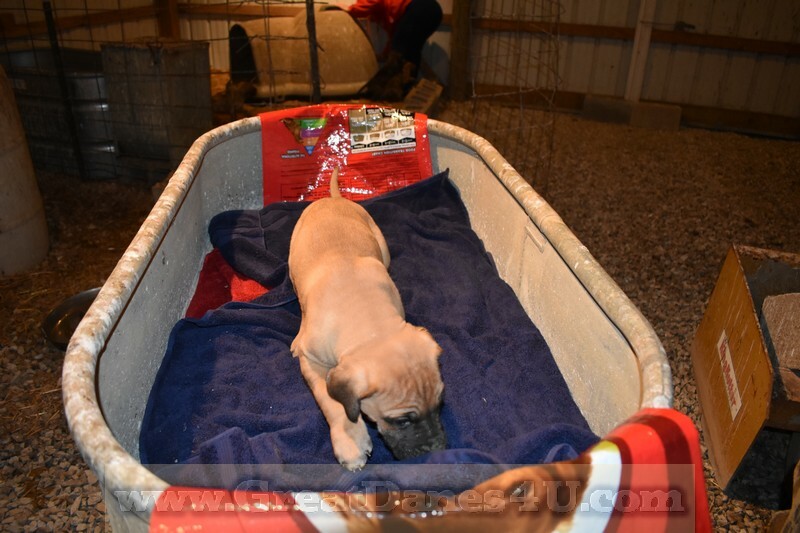 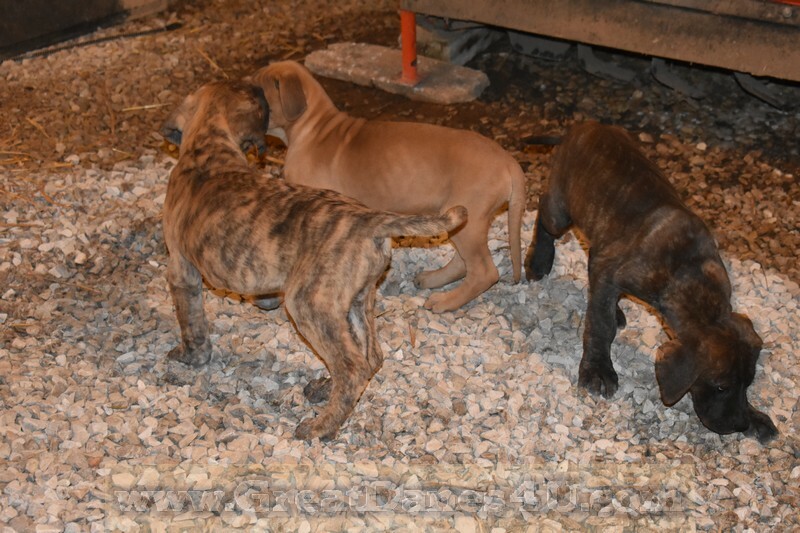 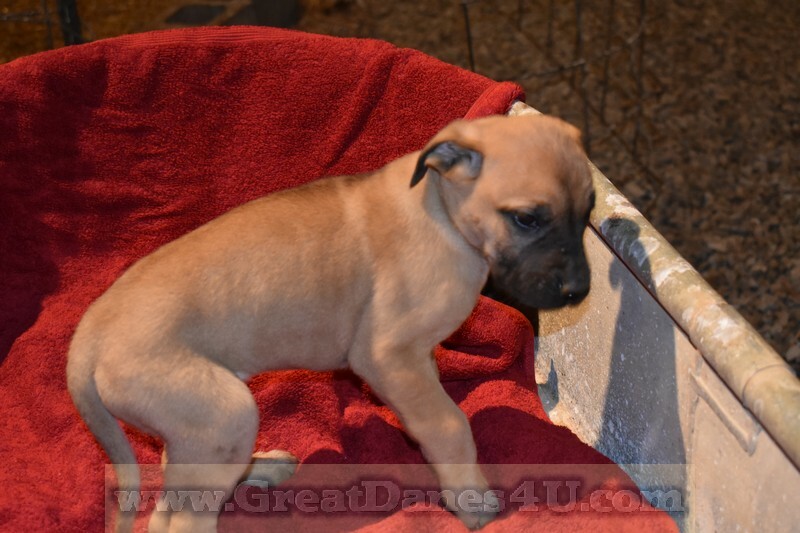 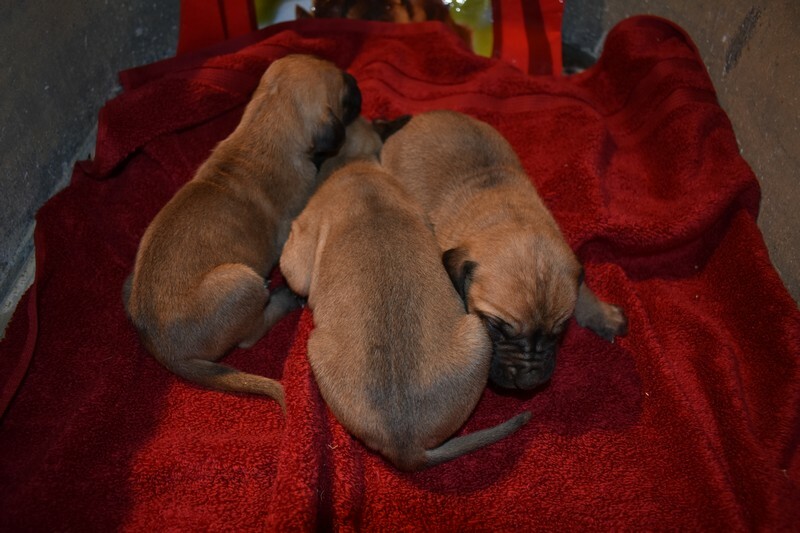 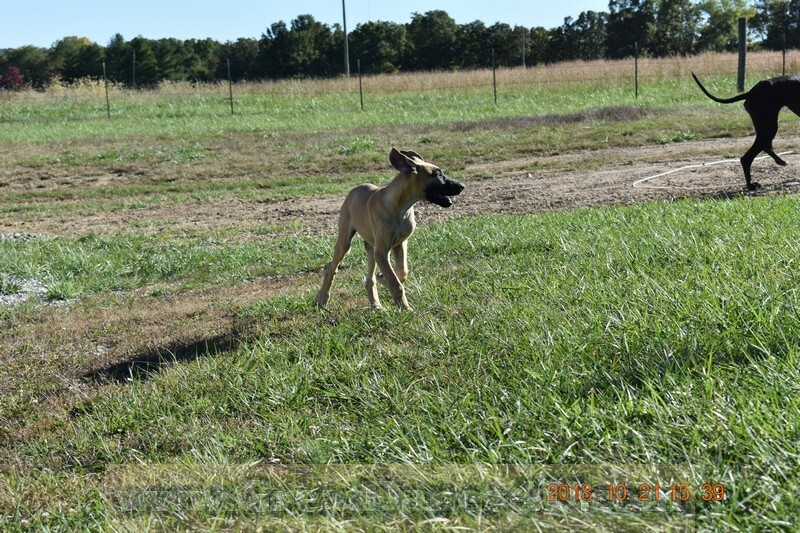 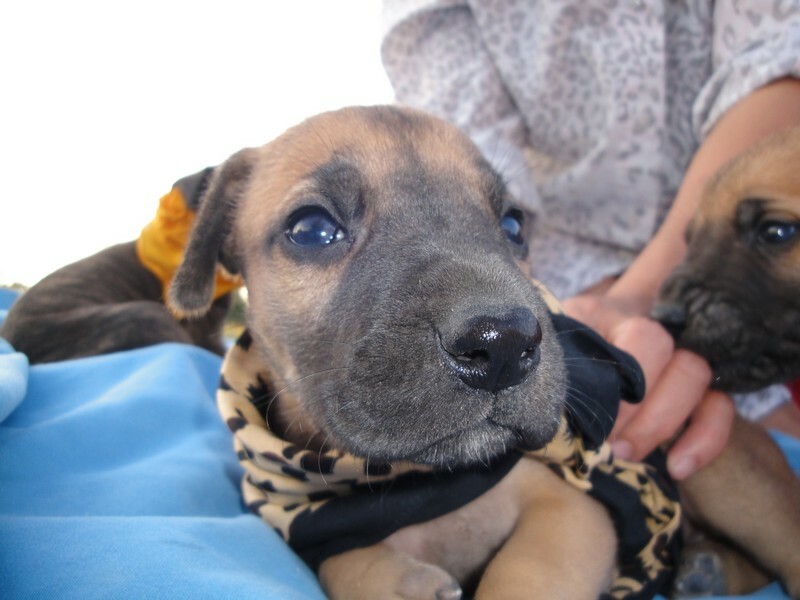 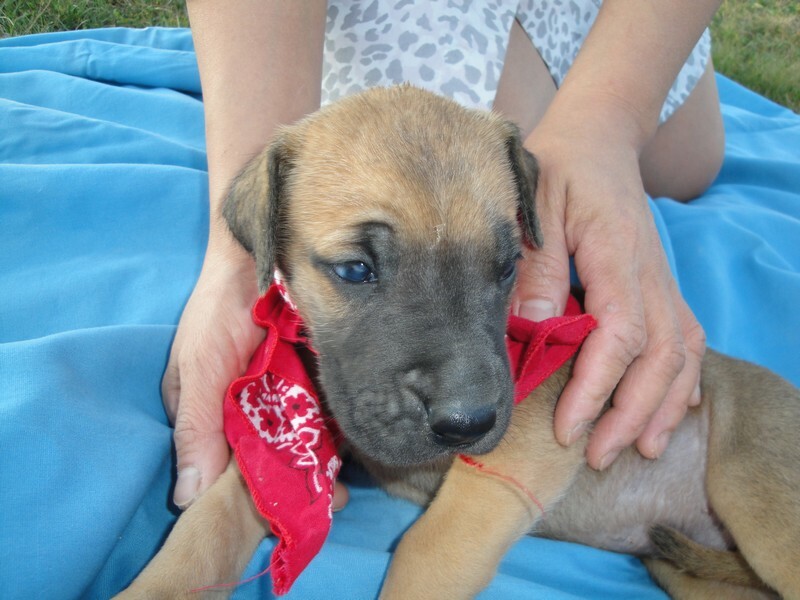 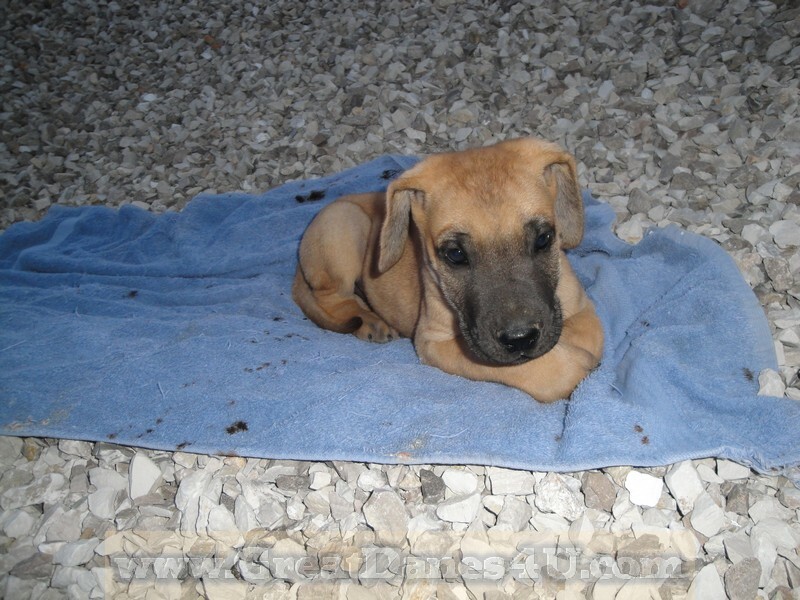 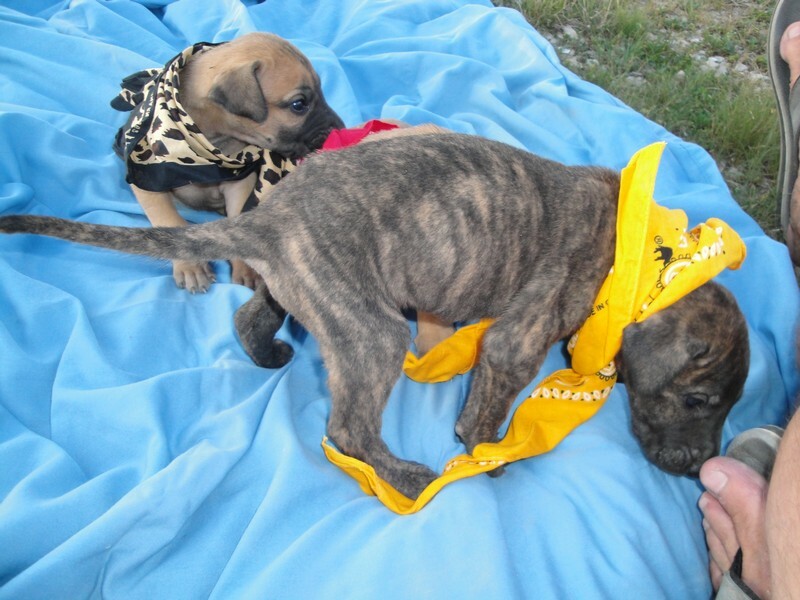 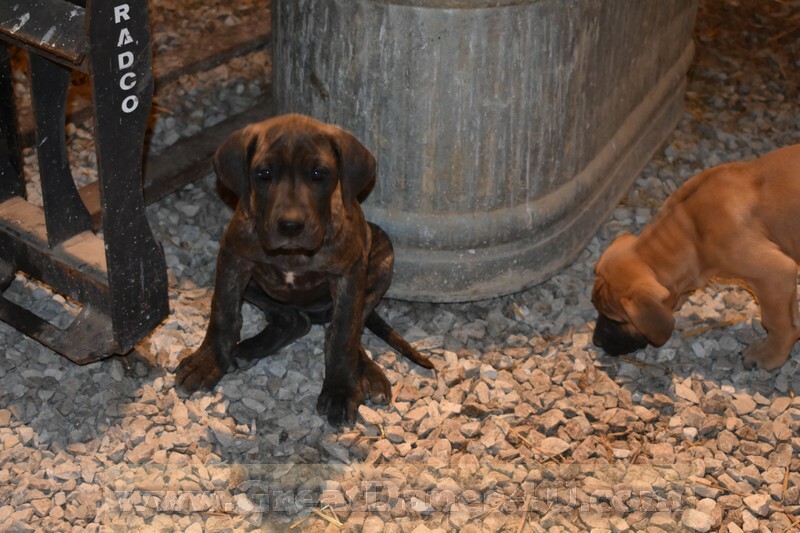 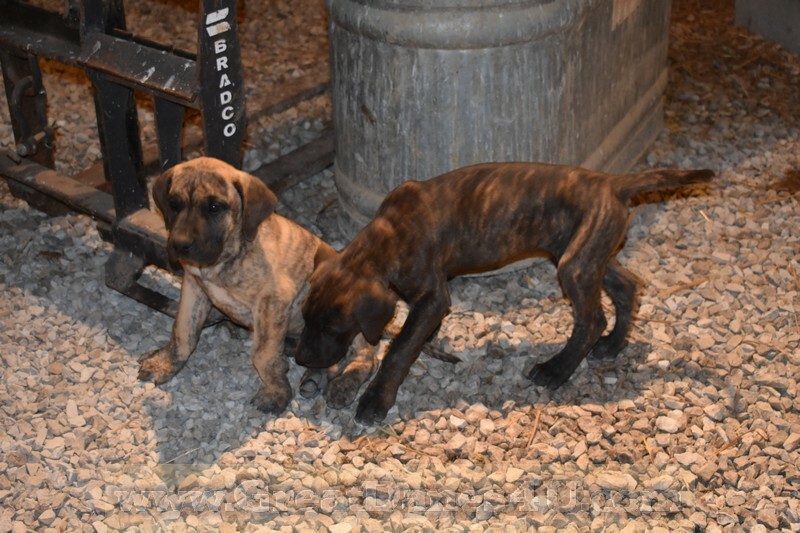 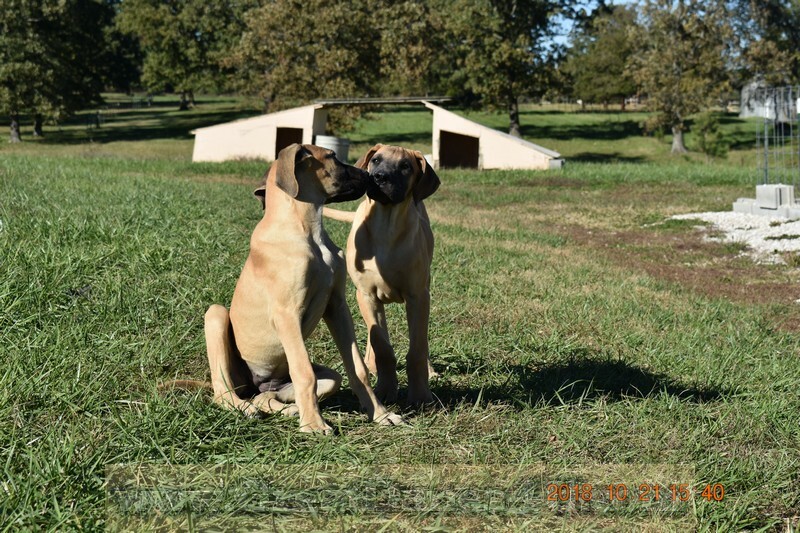 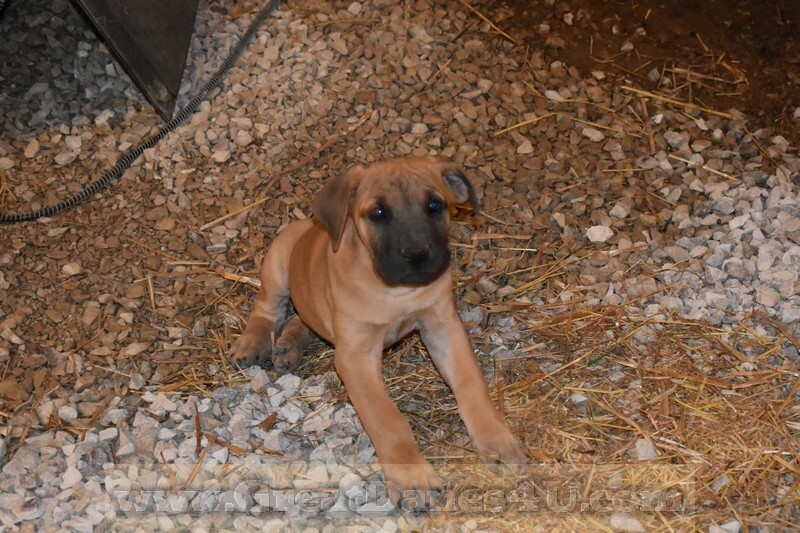 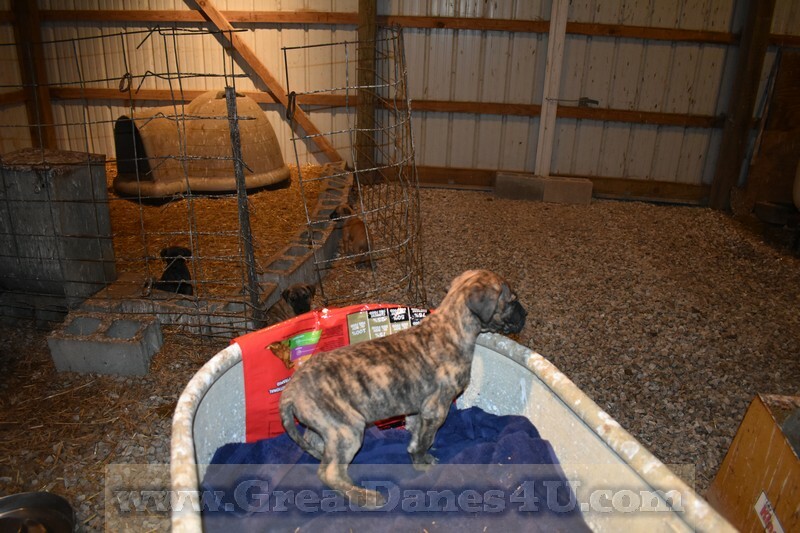 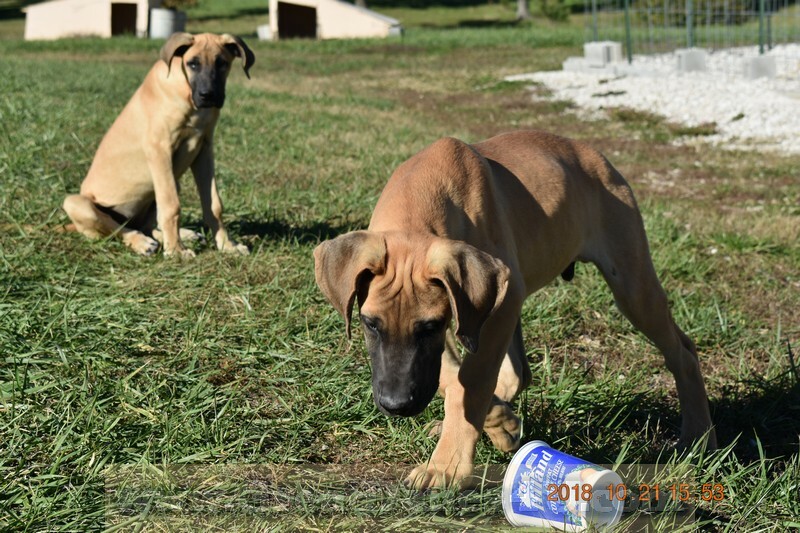 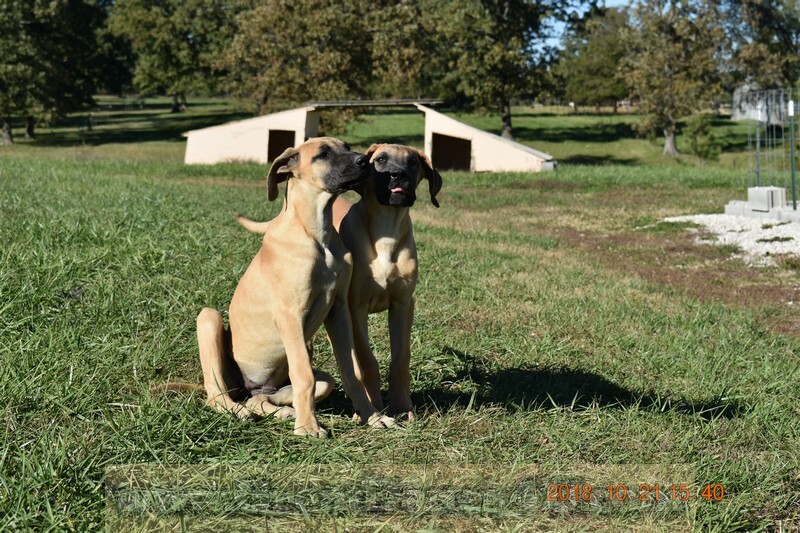 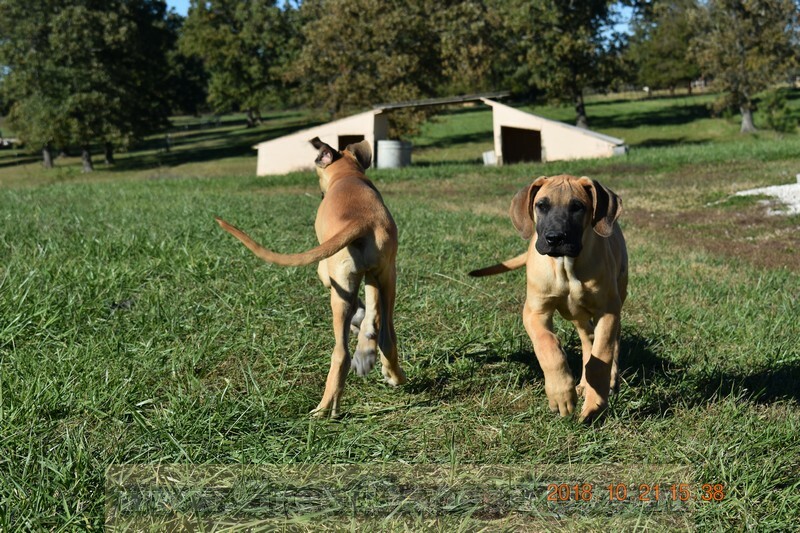 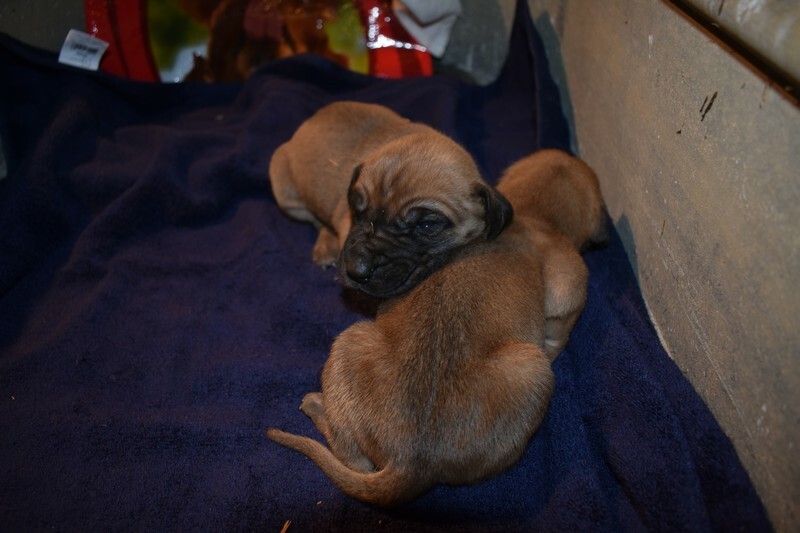 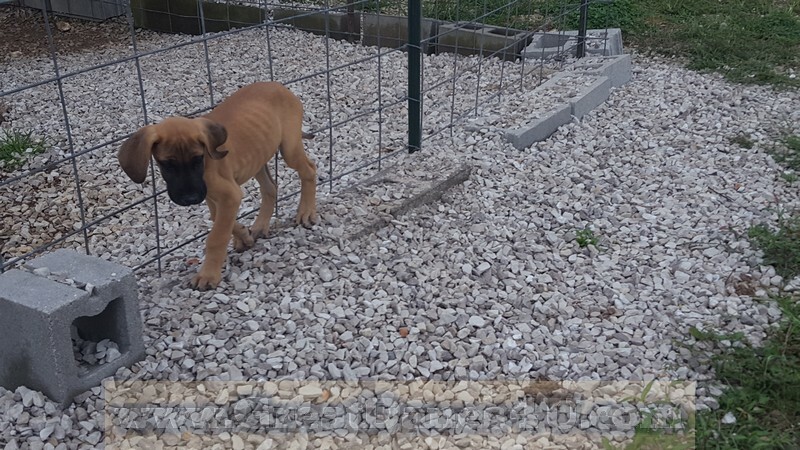 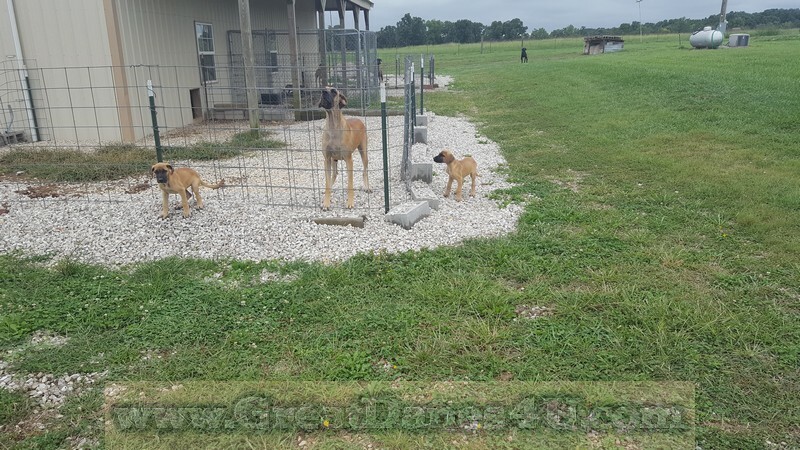 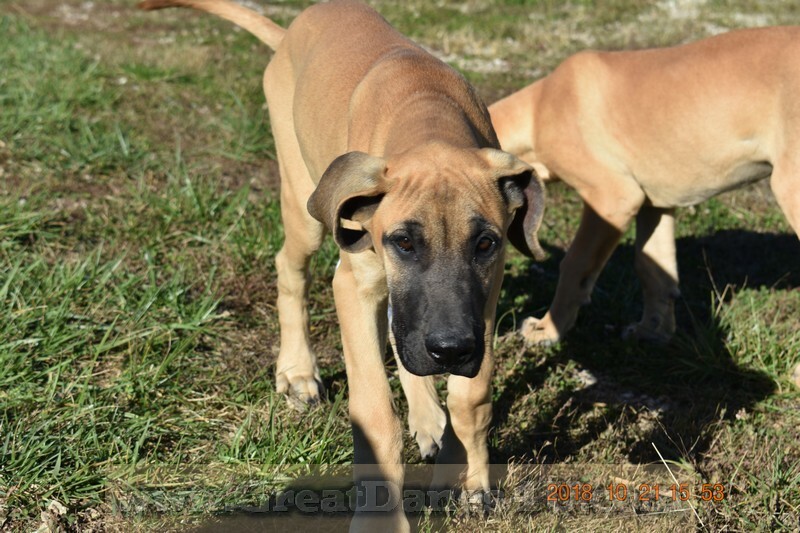 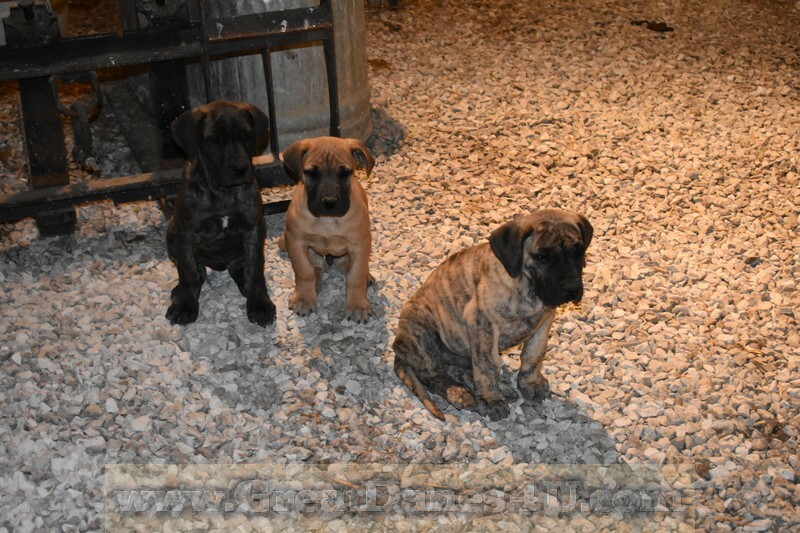 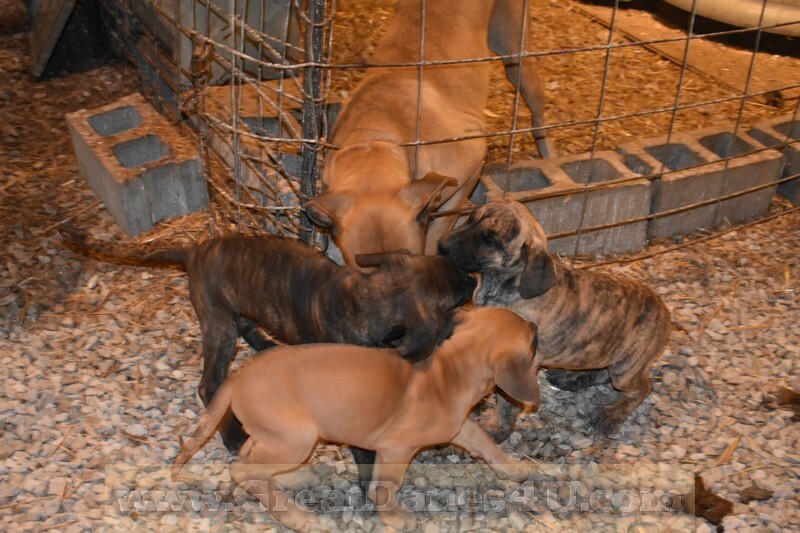 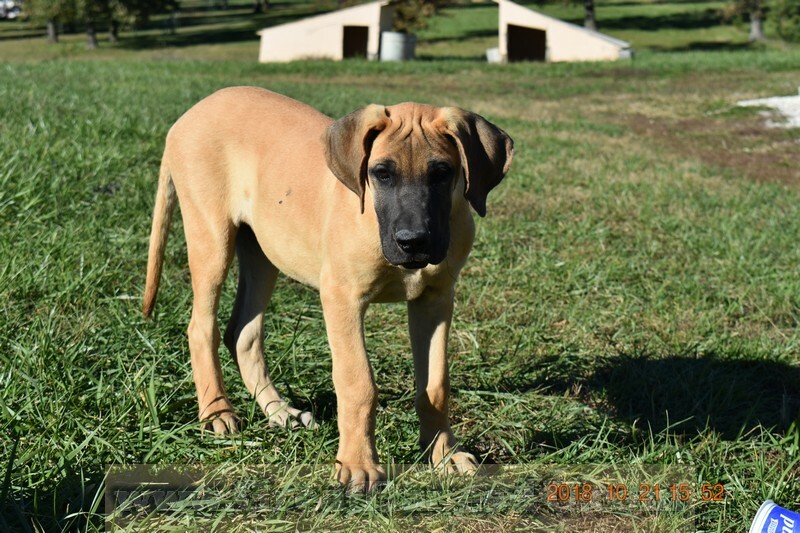 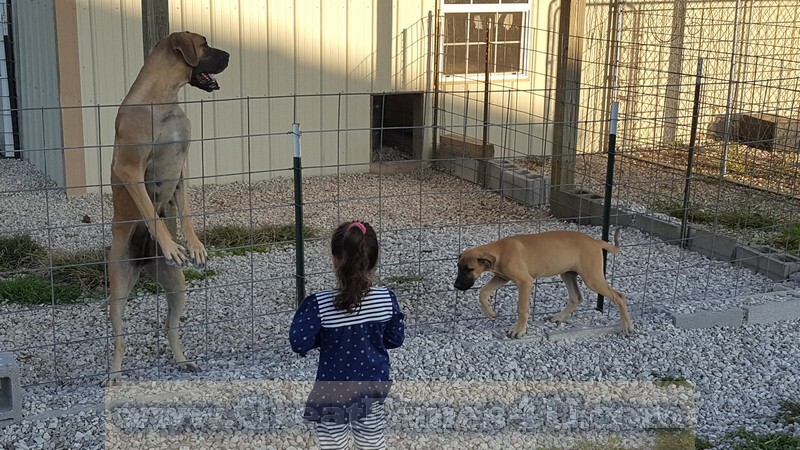 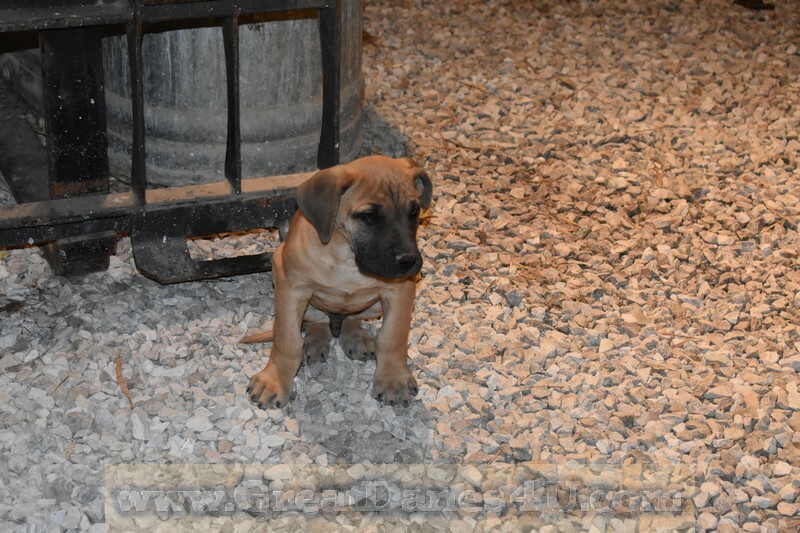 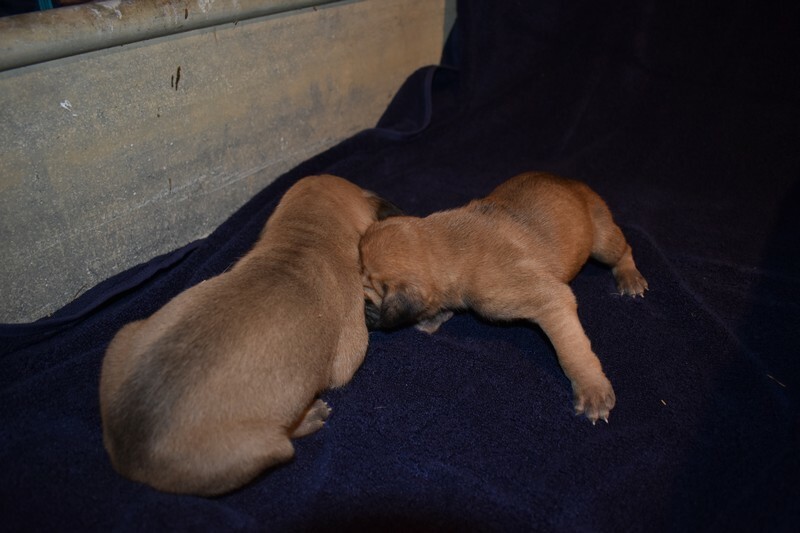 The puppies become acclimated to a variety of farm noises, and situations as well as animals that include horses, wild birds, and other AKC Great Danes. 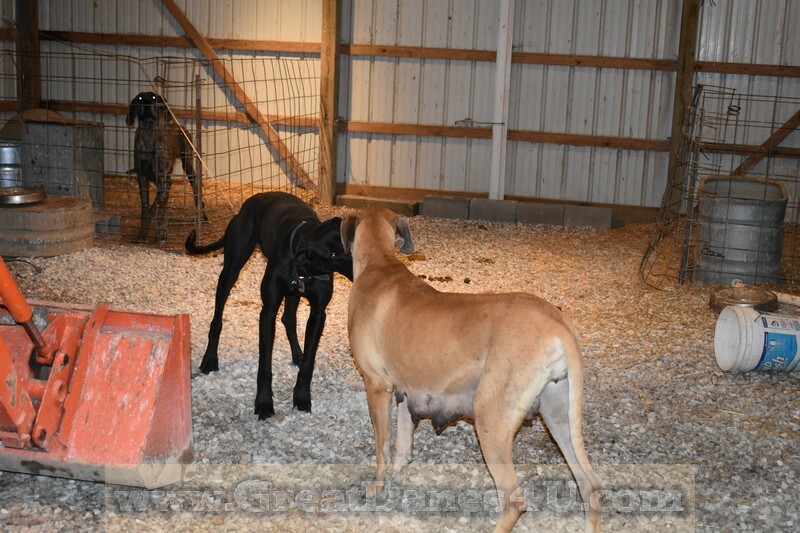 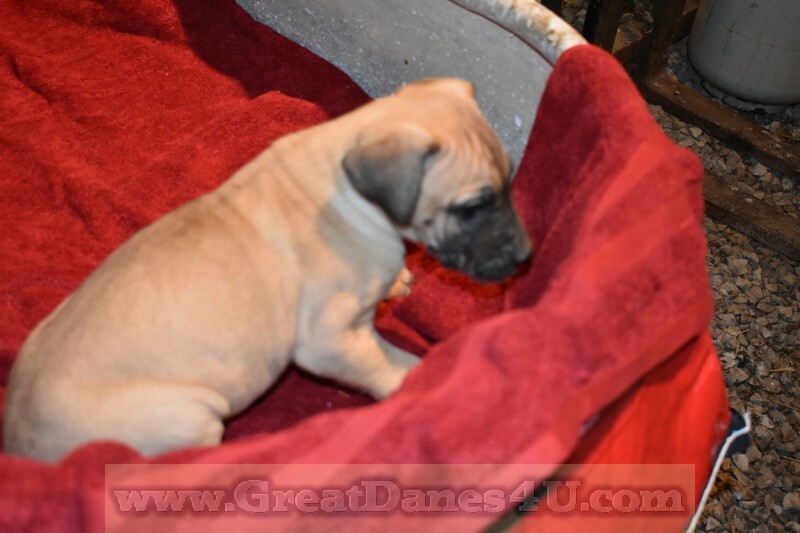 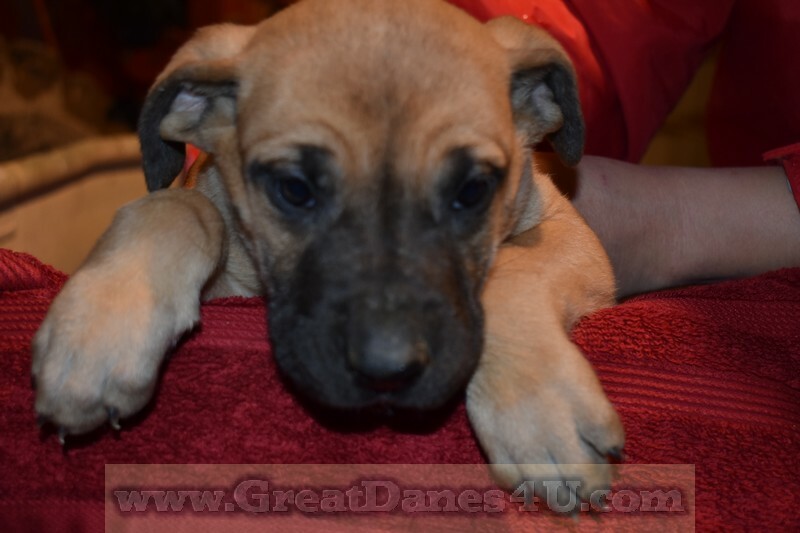 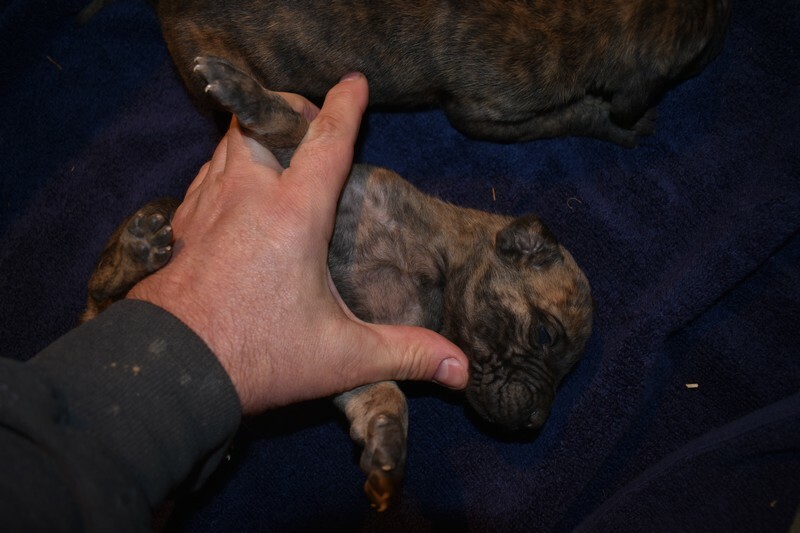 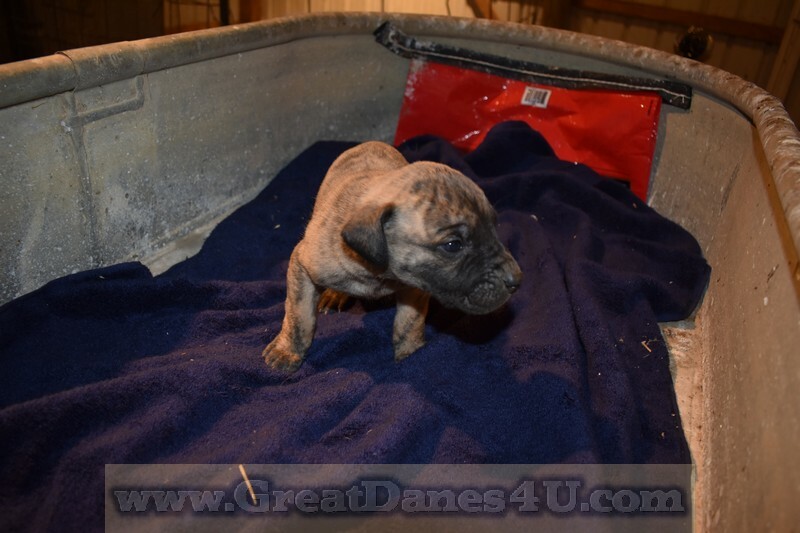 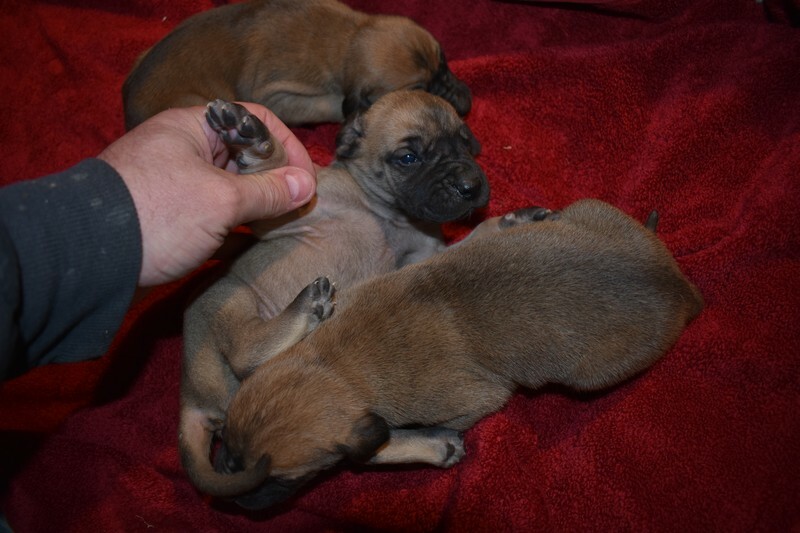 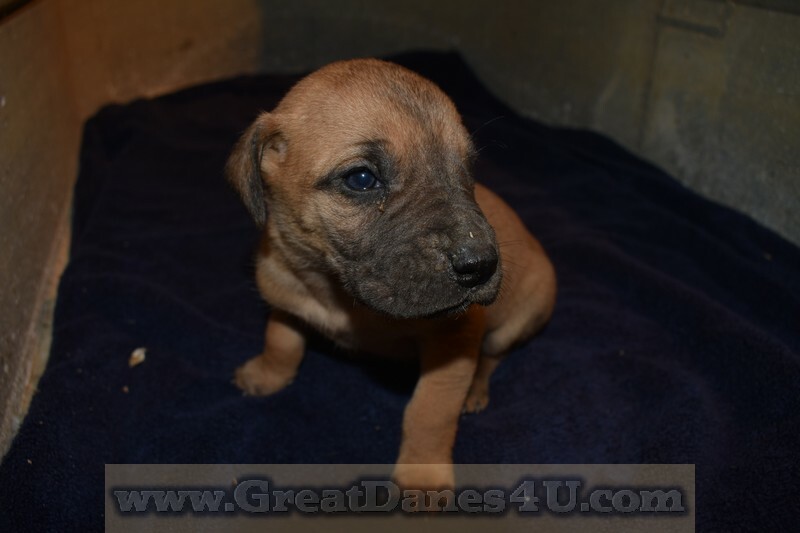 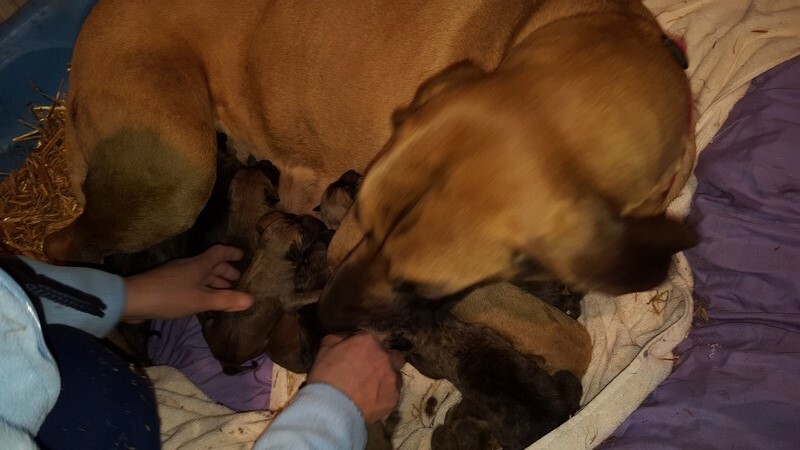 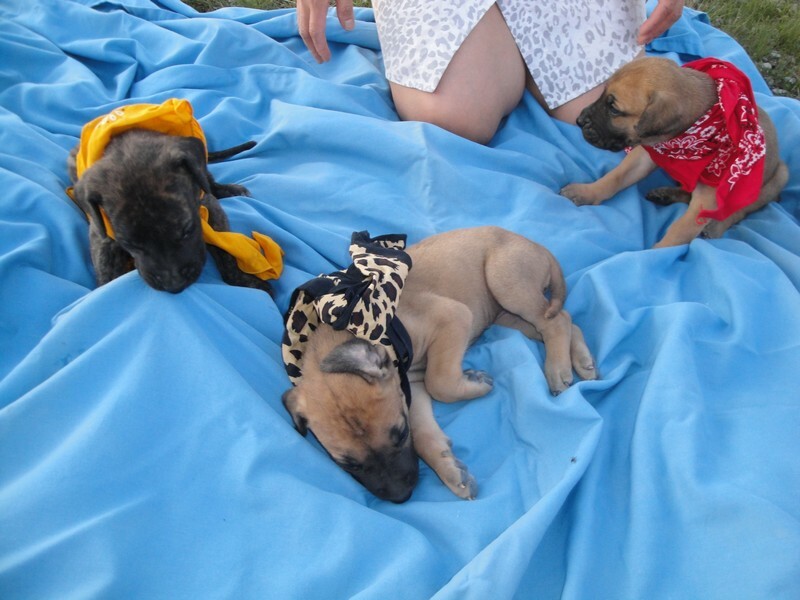 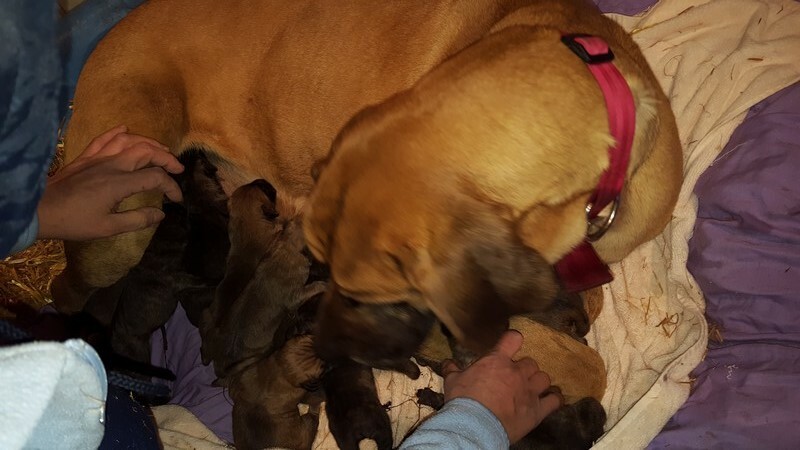 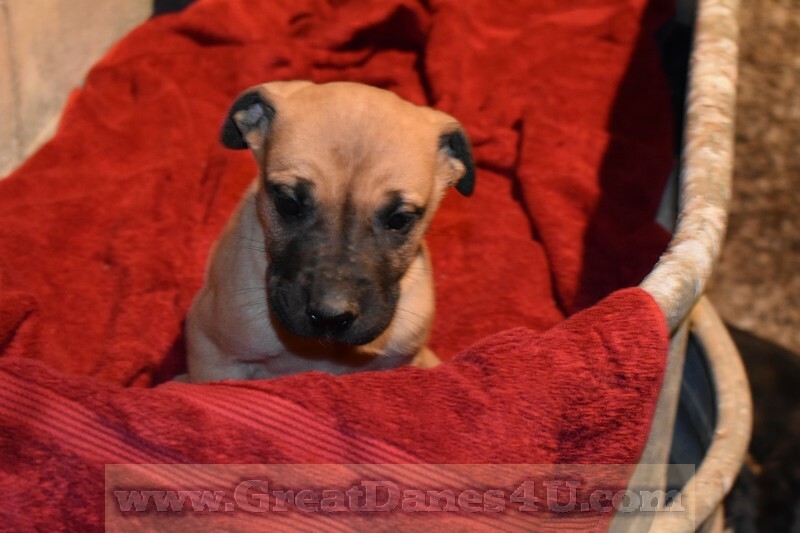 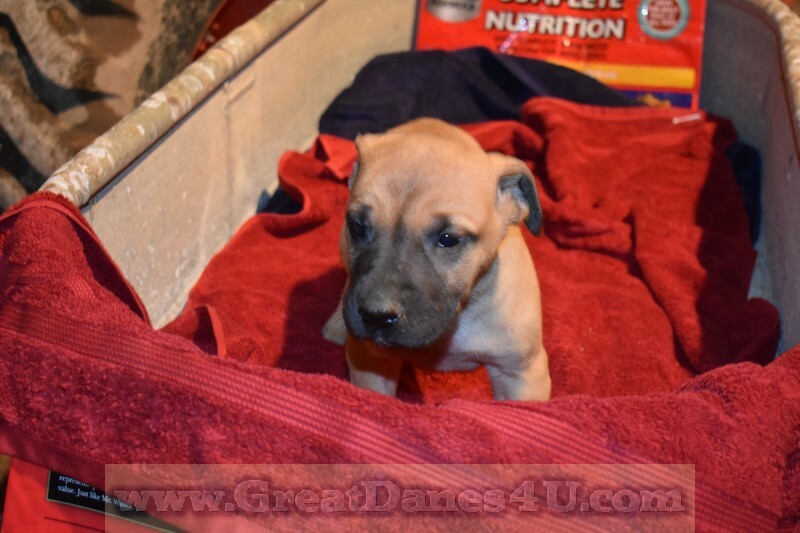 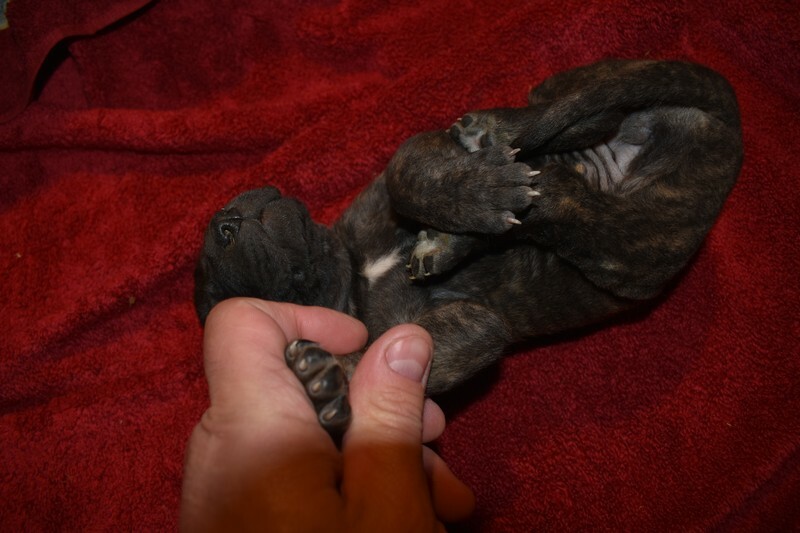 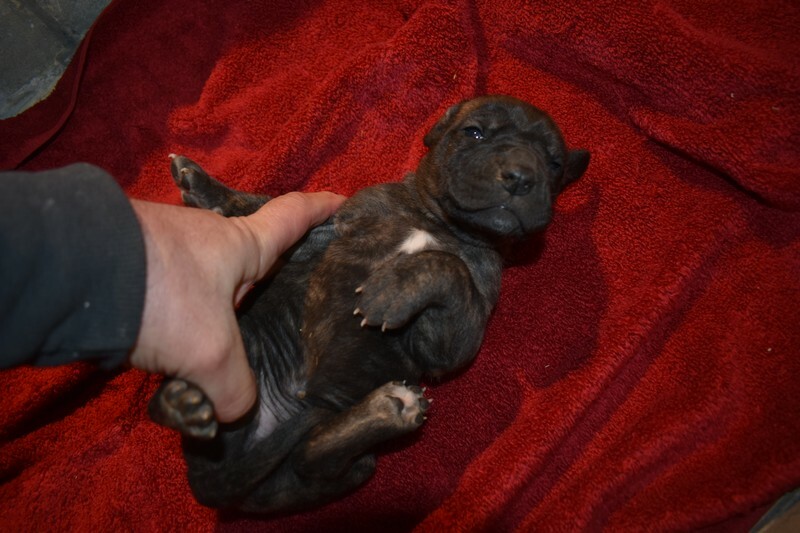 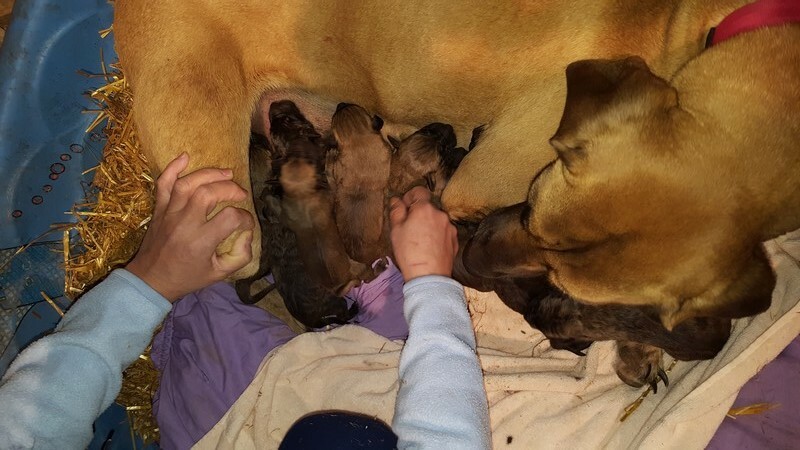 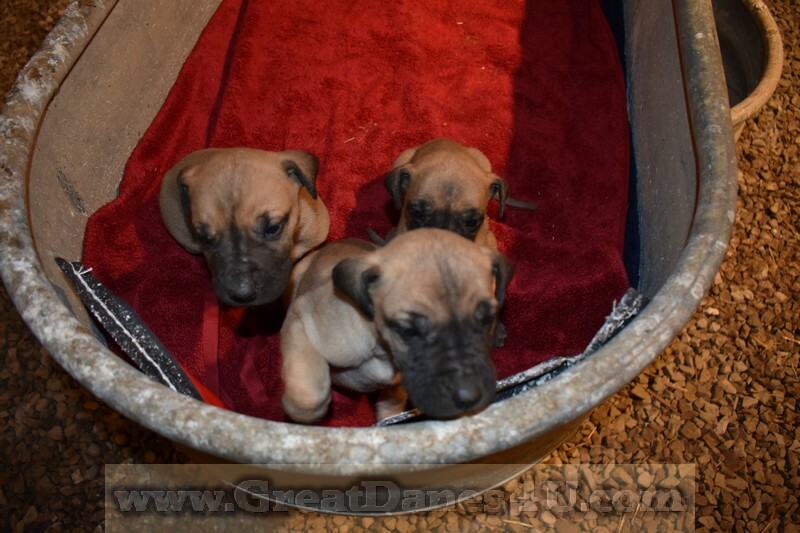 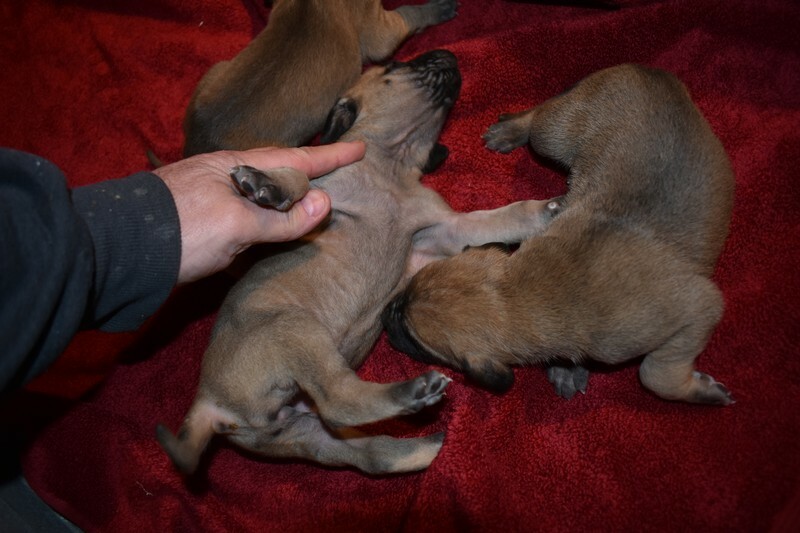 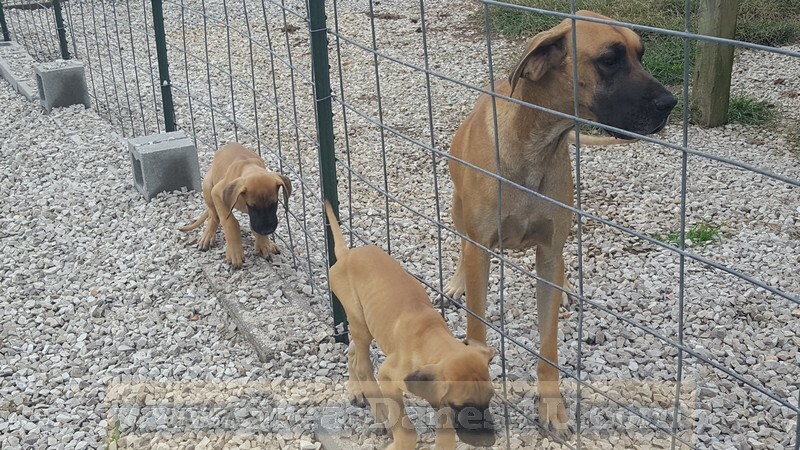 As good pack animals, the numerous adults instill proper behavior in the new litter of Great Dane puppies along with constant supervision from us. 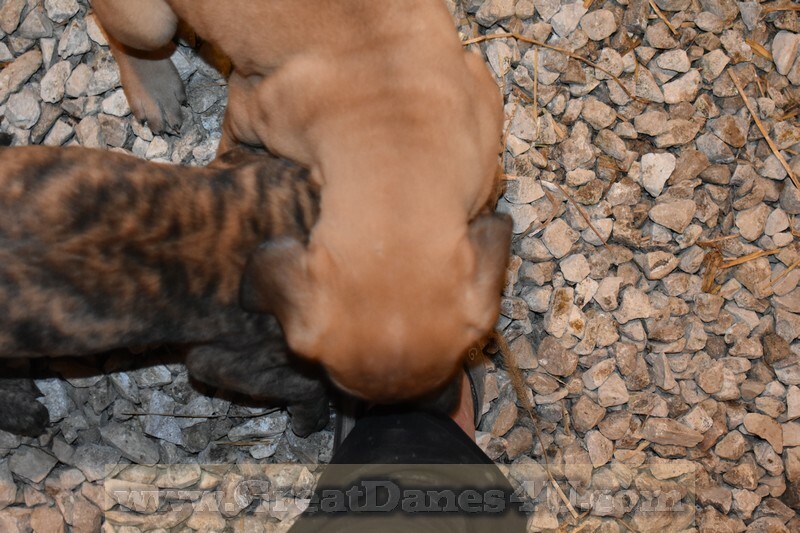 I am on the premises a good portion of a 24-hour day, 7-days a week where I can coach the adults Great Danes as well as puppies on proper behavior making many of your training jobs easier! 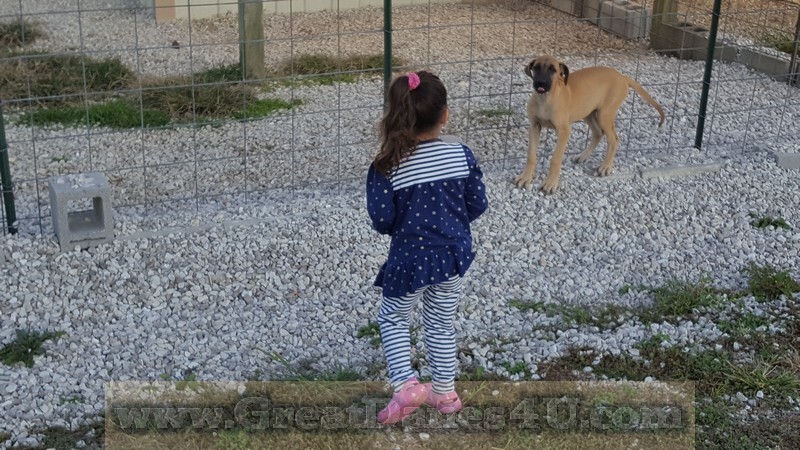 Our, (kids included), interaction with our puppies improves socialization over the caged animals that are on the market! 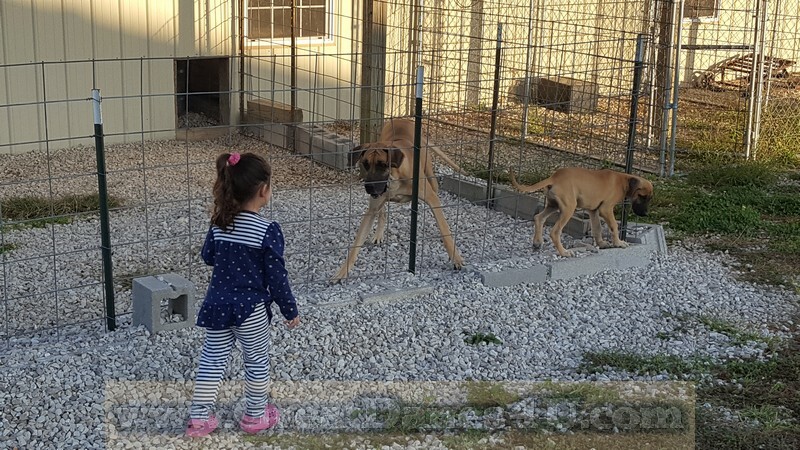 While some kennels might be able to provide some of these skills they usually have far too many animals and lack of space to match our level of involvement and commitment that we provide to our babies! 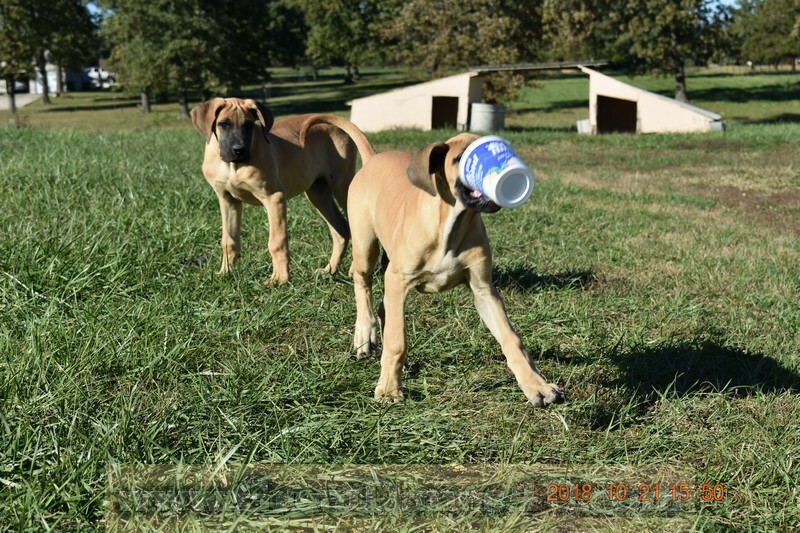 While everybody wants up to date pictures these are usually the newest ones we have. 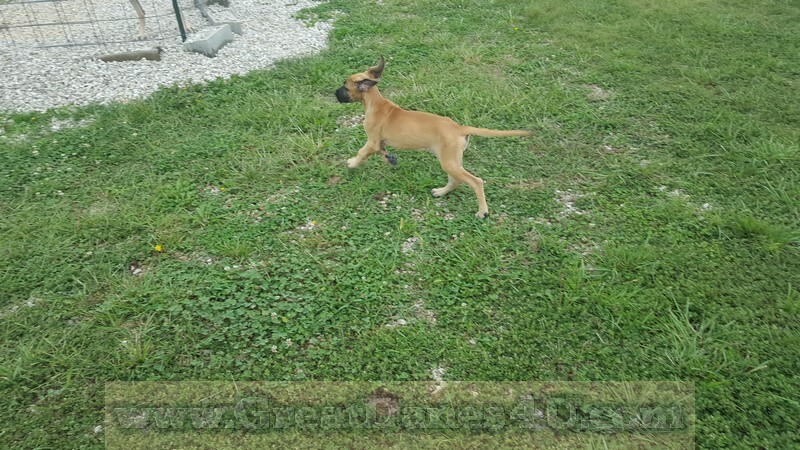 If you want newer, I would recommend you download Yahoo messenger so you can receive LIVE WEB CAM Images! 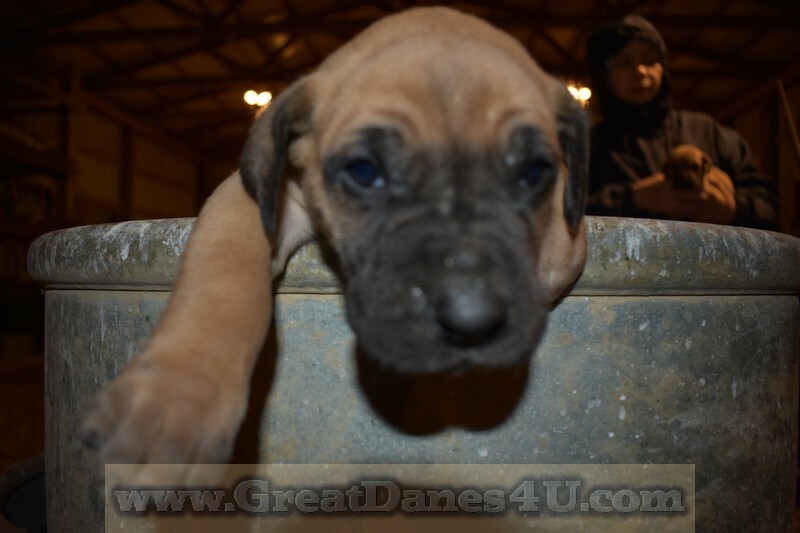 Live Web Cam is always better than a picture as a picture is old! 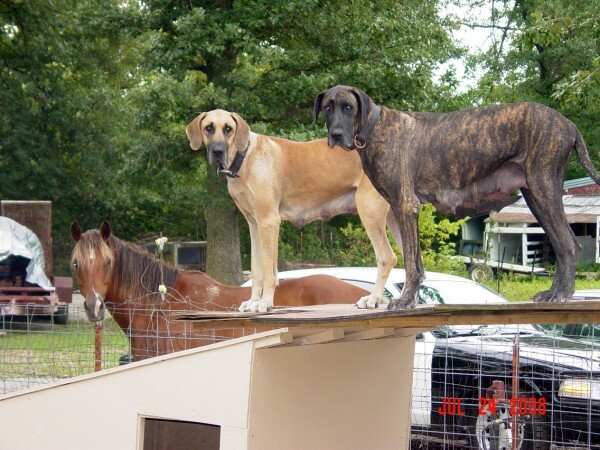 How old is relative, or merely a question of degree, where as live is - well LIVE! 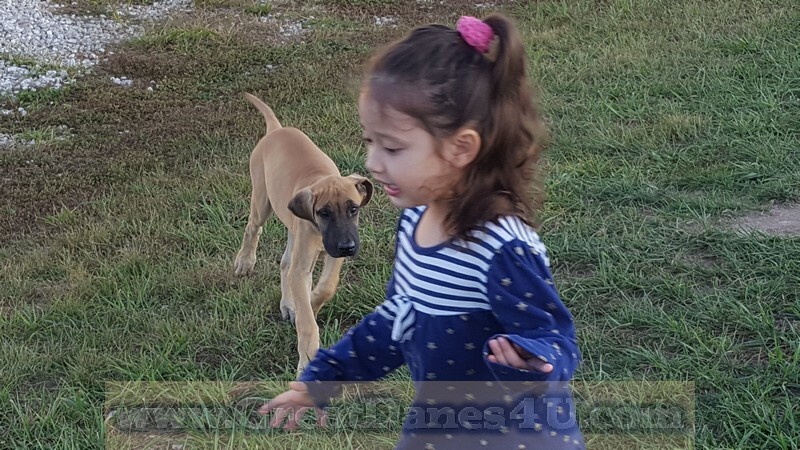 Puppies Priced for usual clients in Happy Homes as Pets; Shipping Expenses, Breeding and Show Rights as well as Extended Warranties are additional. 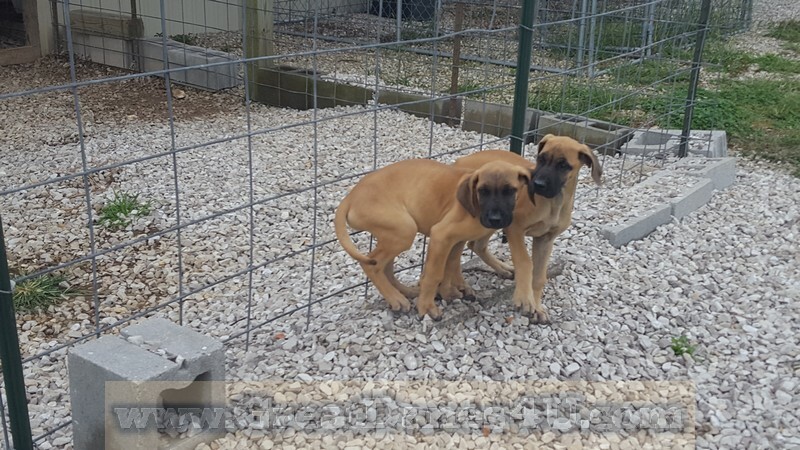 Priced to keep costs down for the majority that wants a quality pet at a Reasonable price! 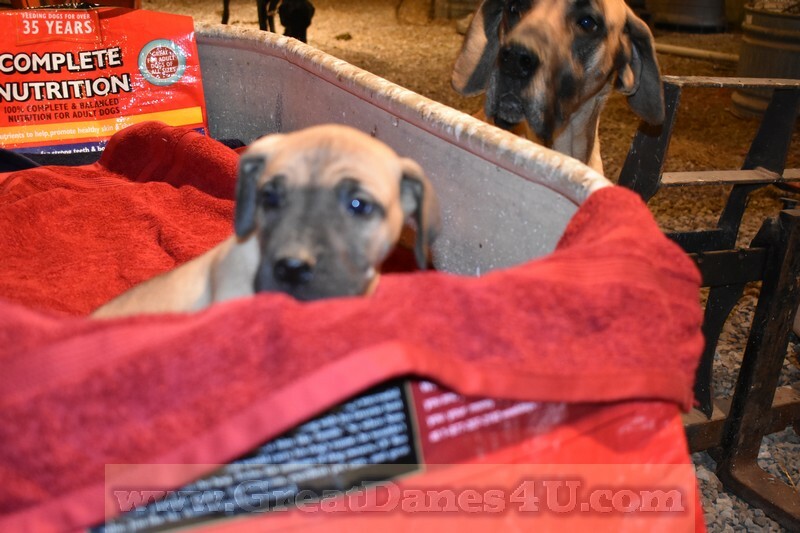 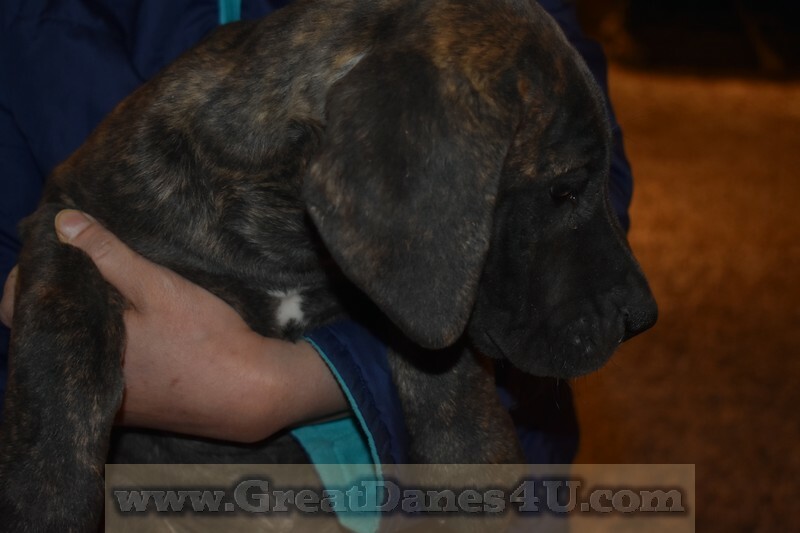 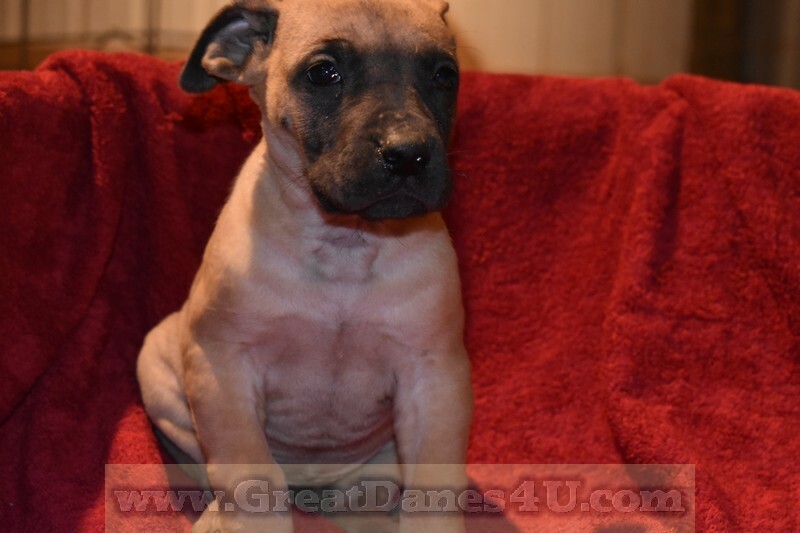 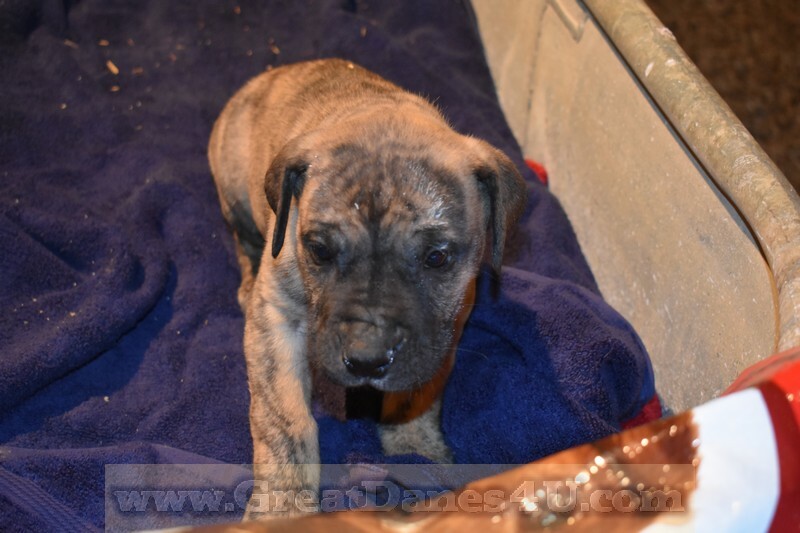 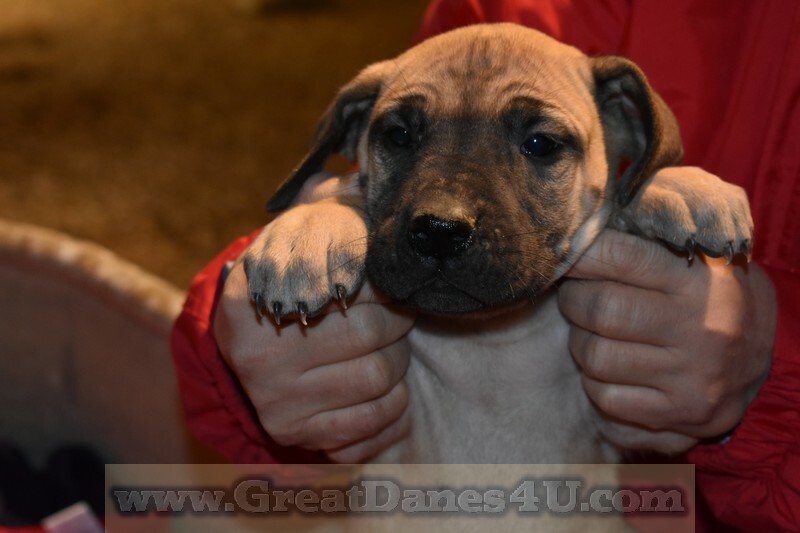 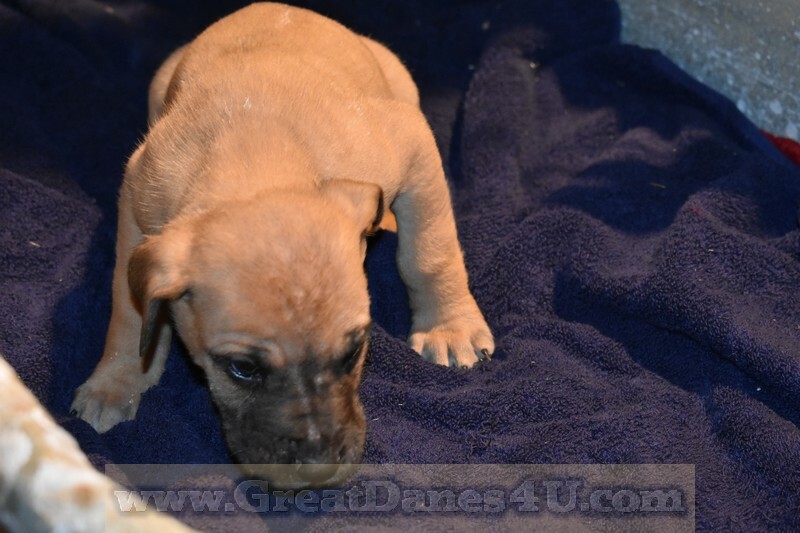 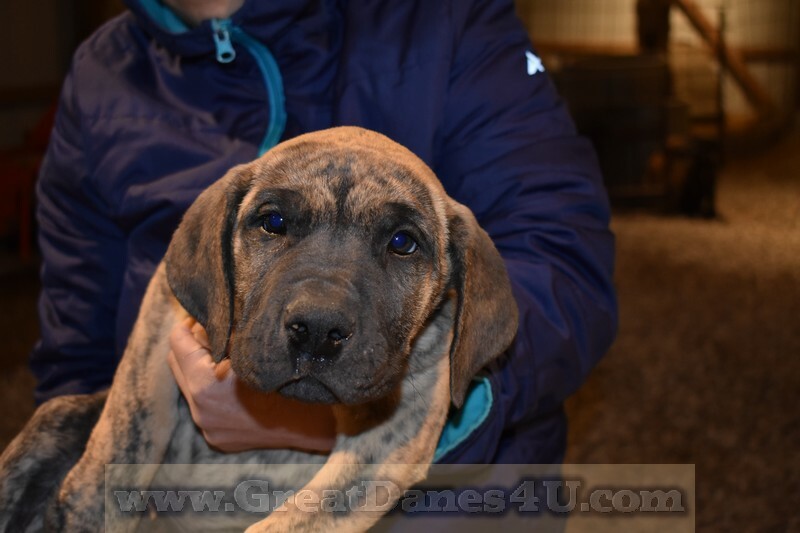 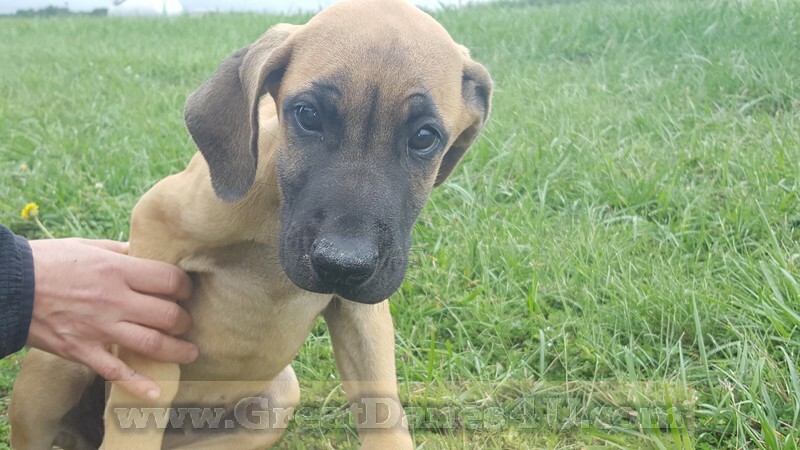 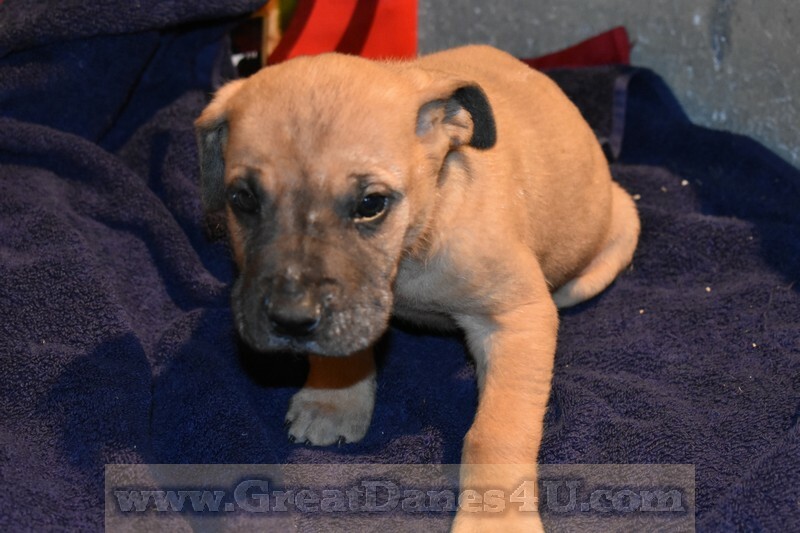 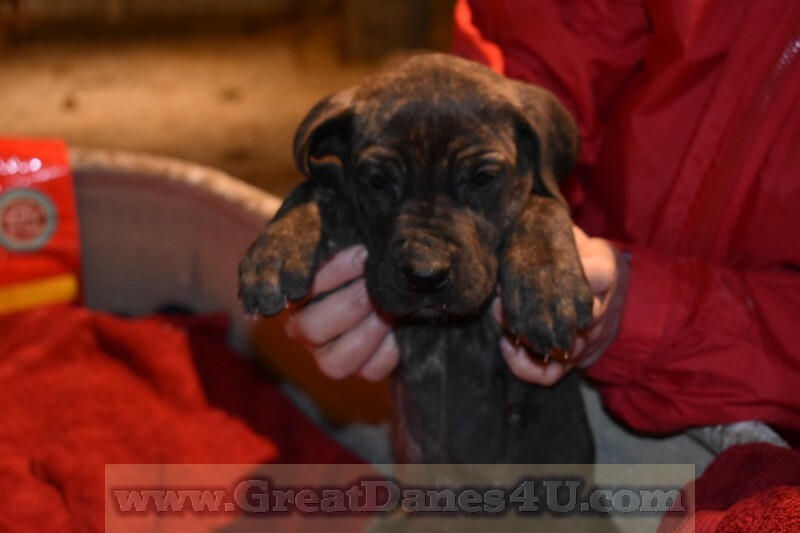 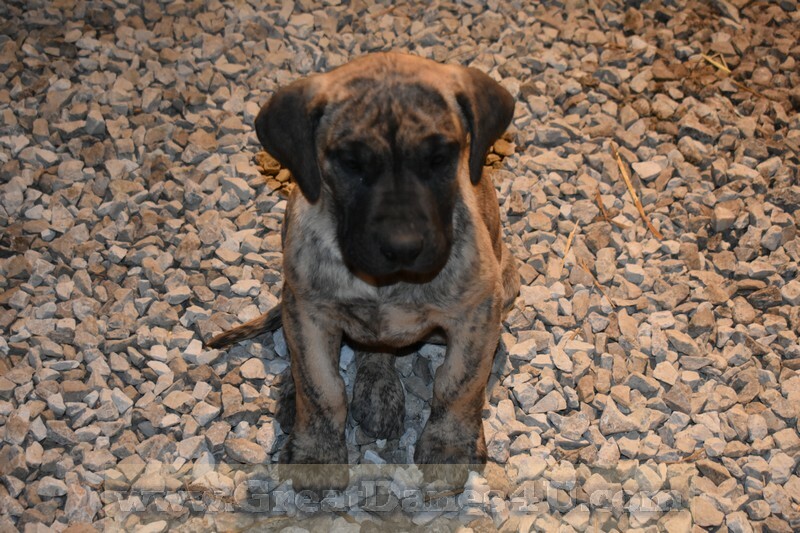 Please review the Puppy Sales Contract and Warranty information at: http://www.GreatDanes4U.com/Health.asp offering our standard 1-year warranty, Extended warranties are optional. 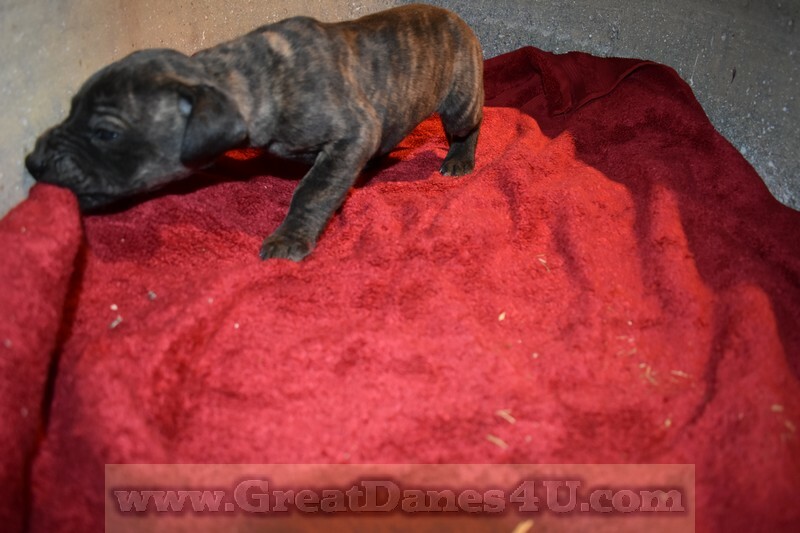 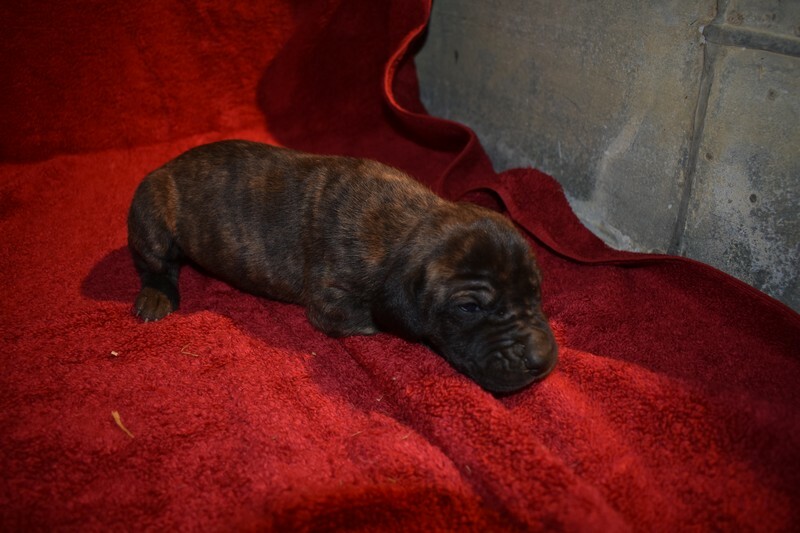 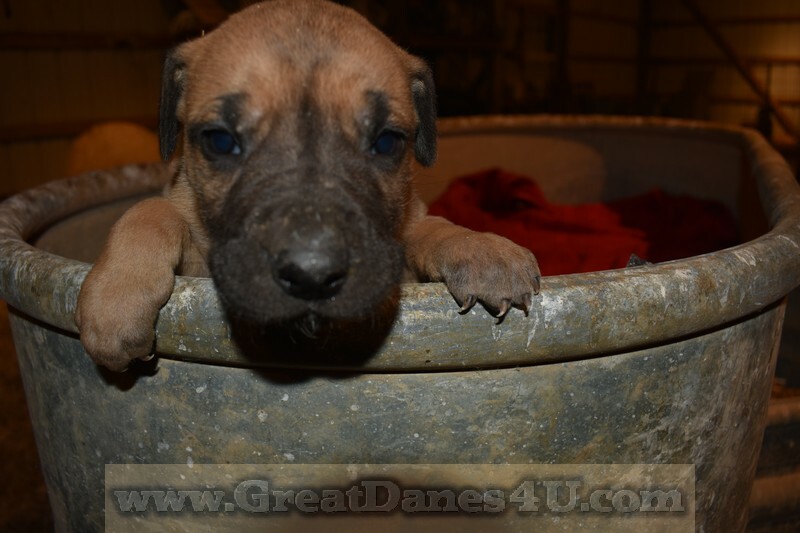 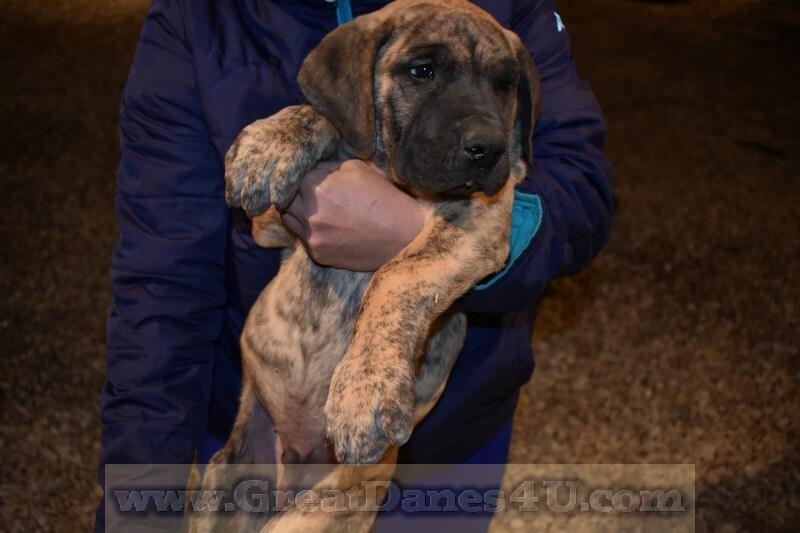 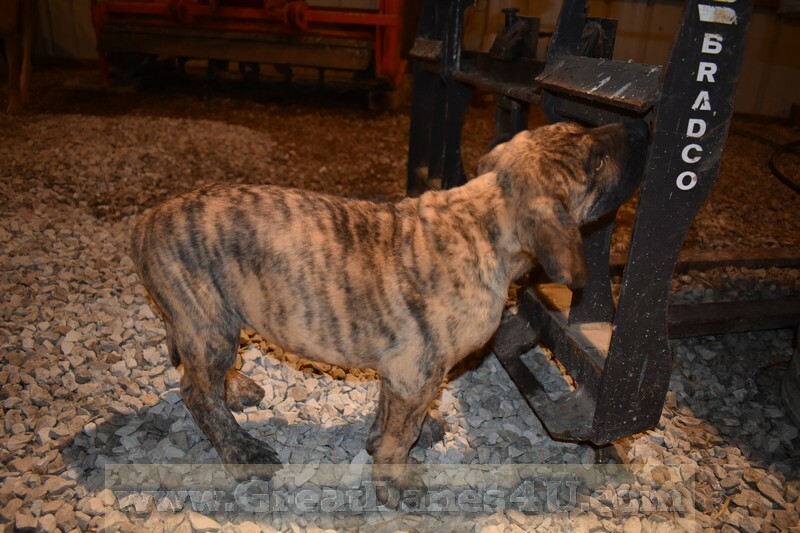 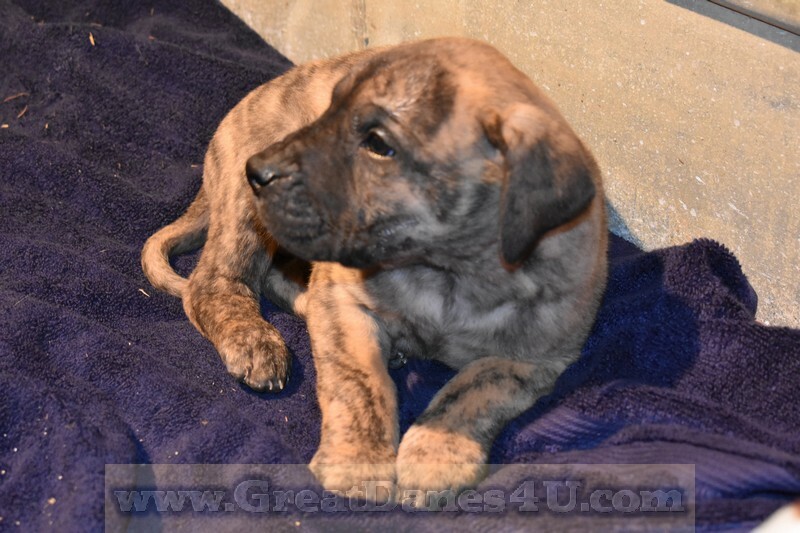 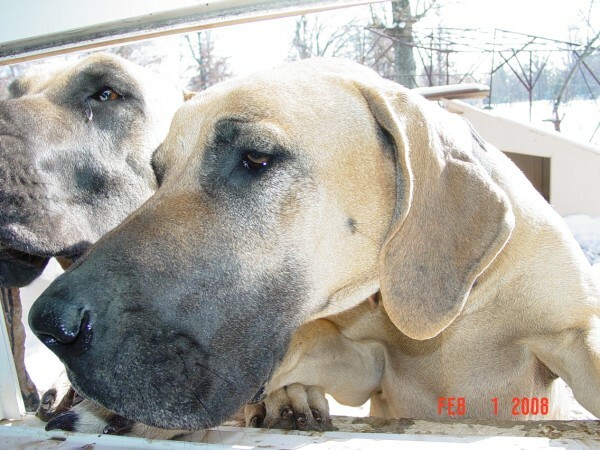 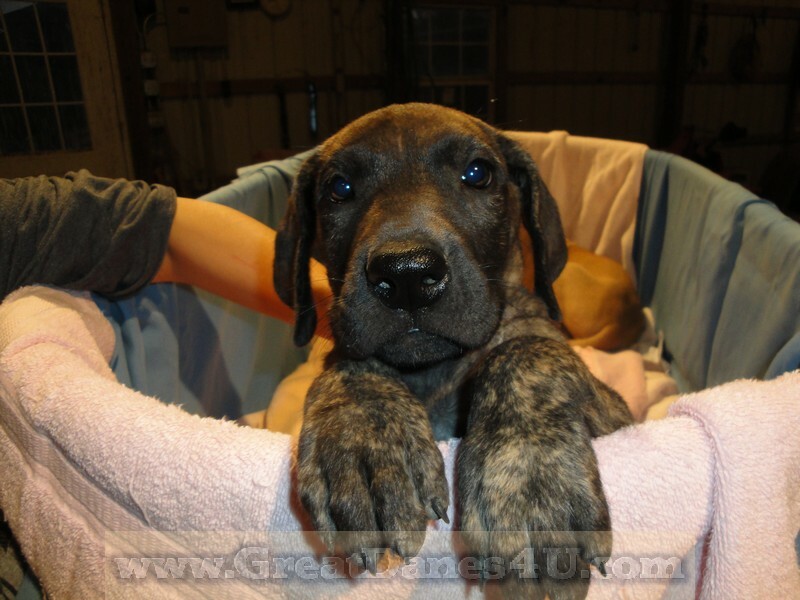 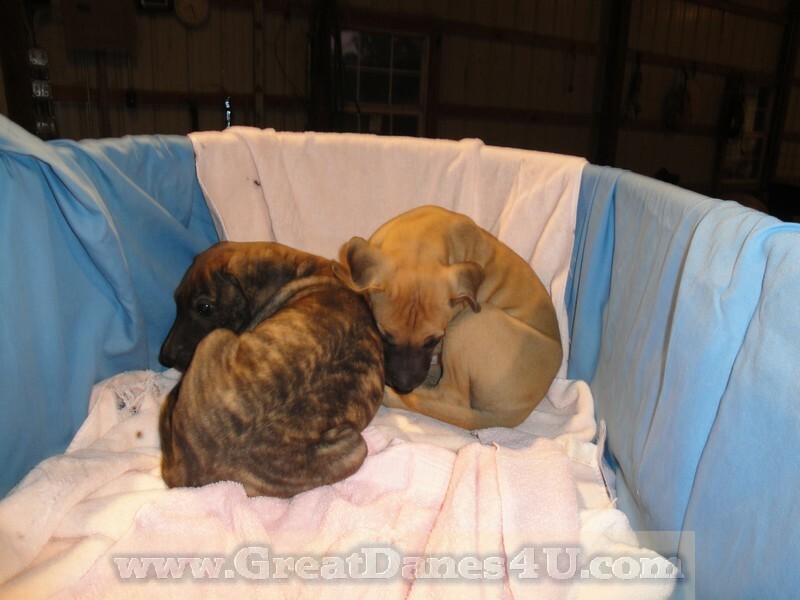 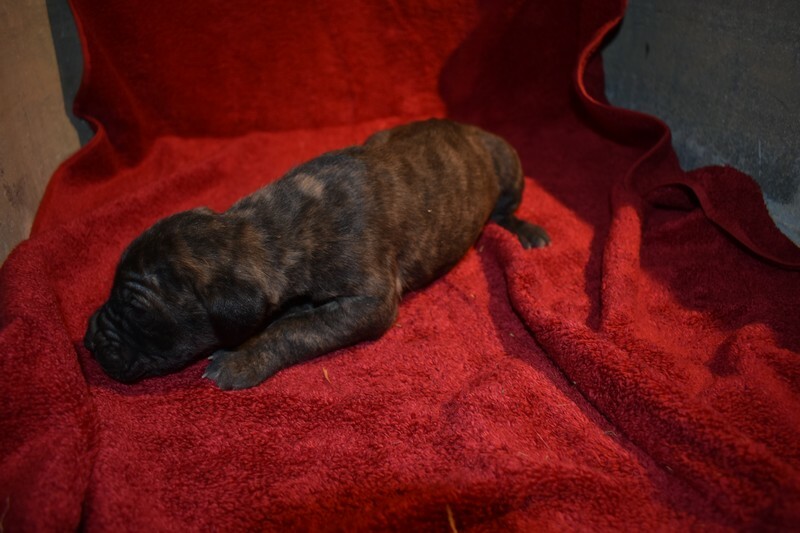 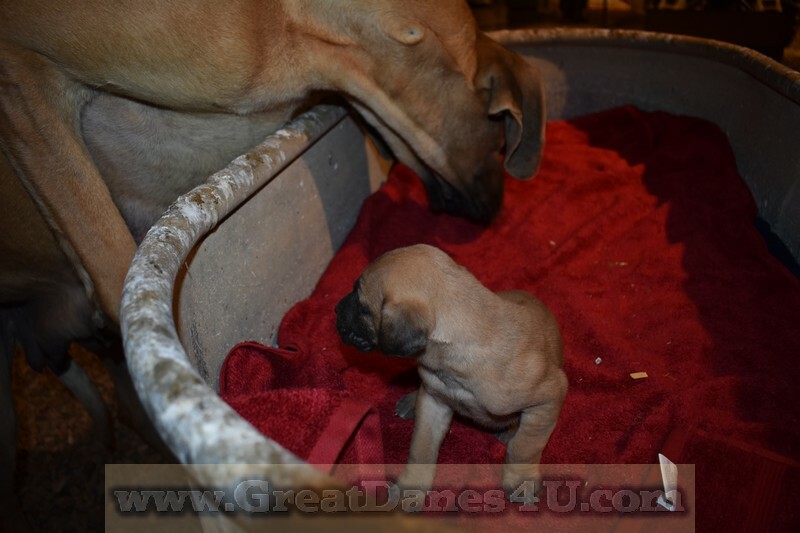 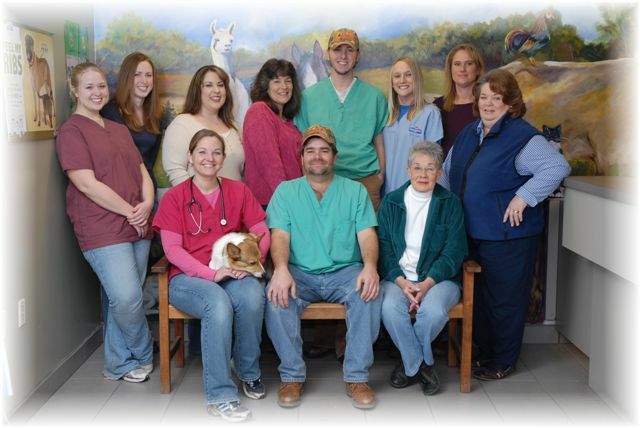 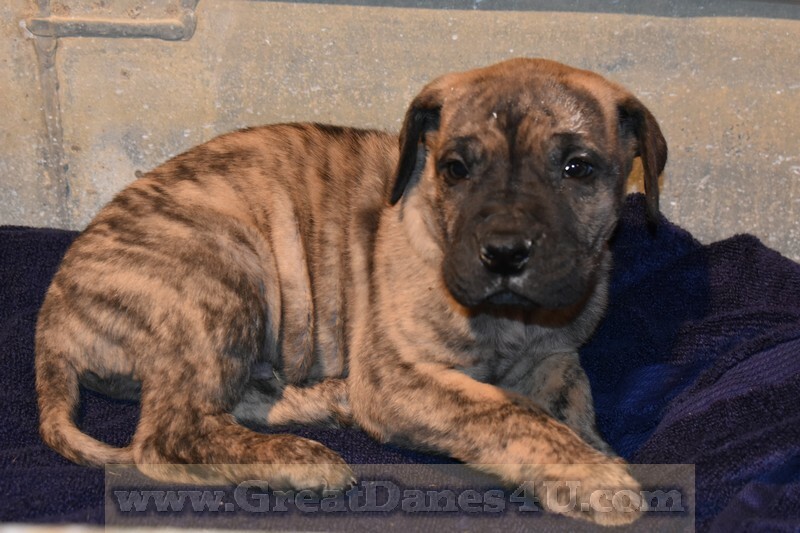 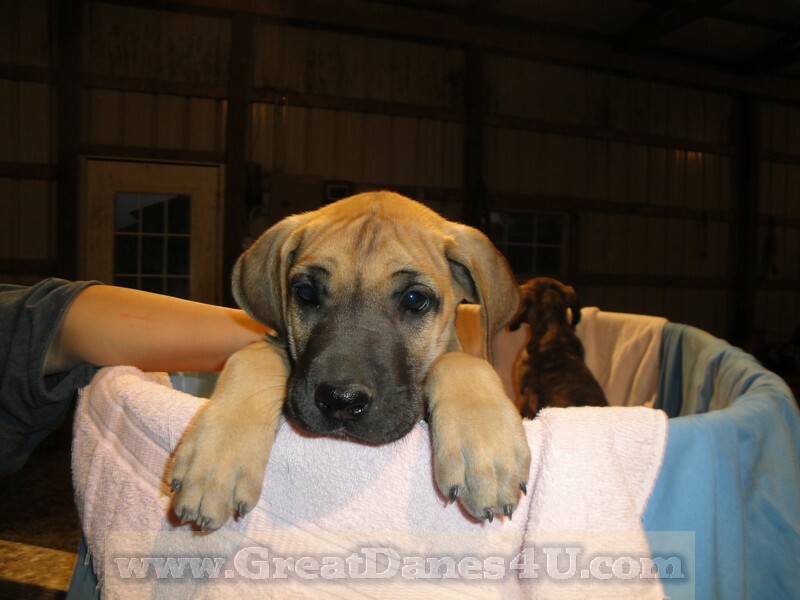 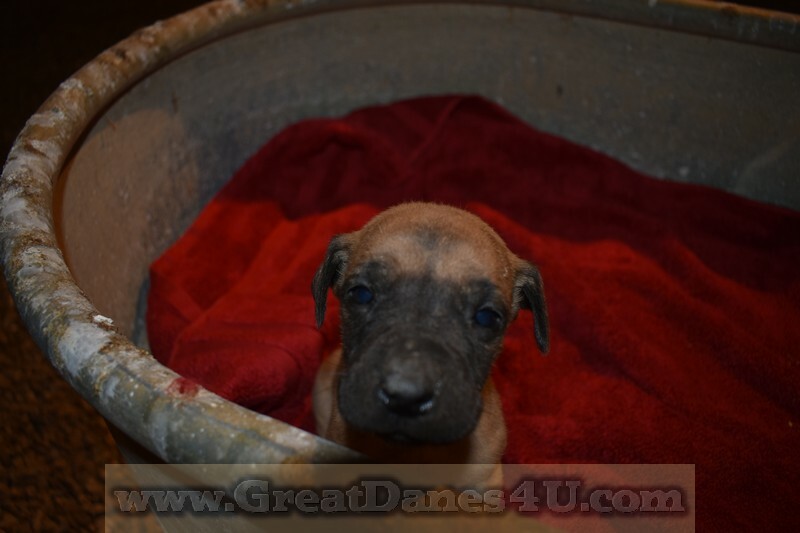 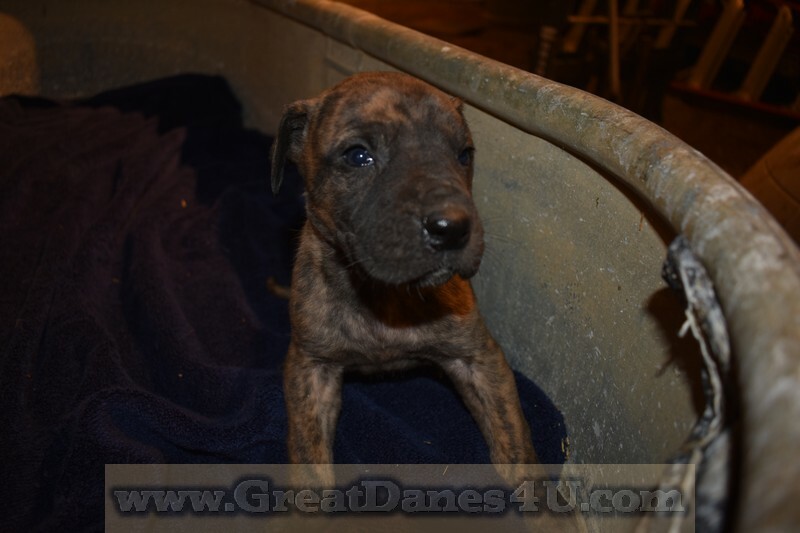 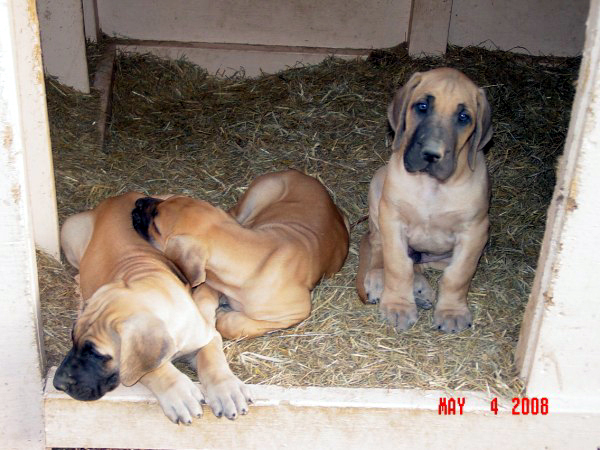 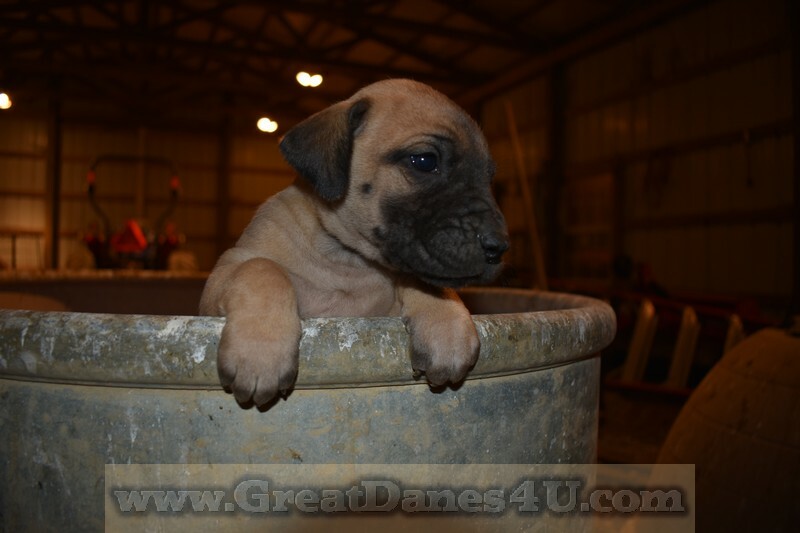 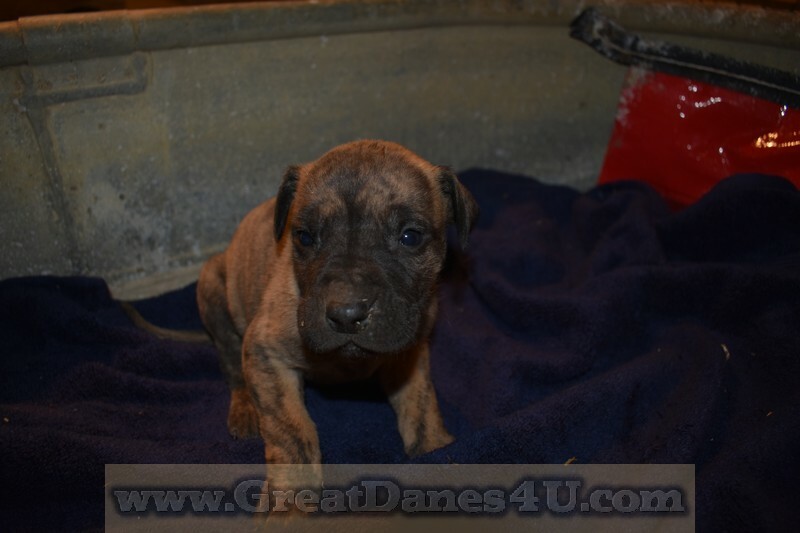 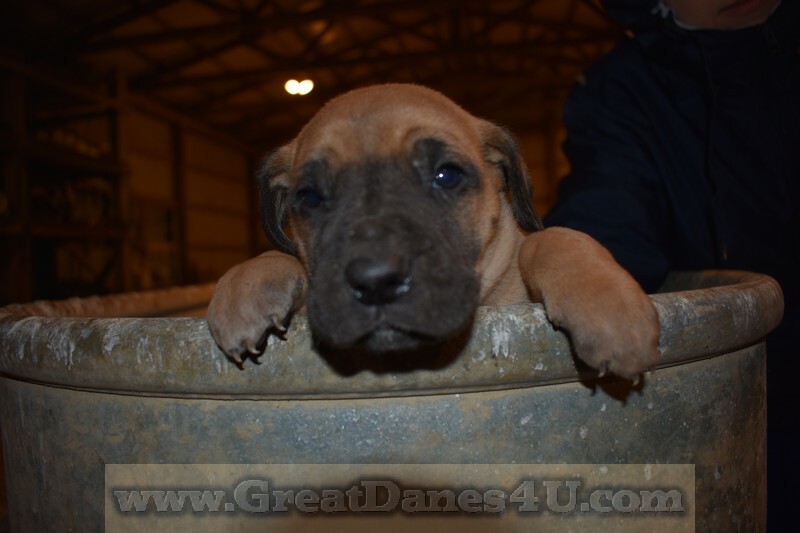 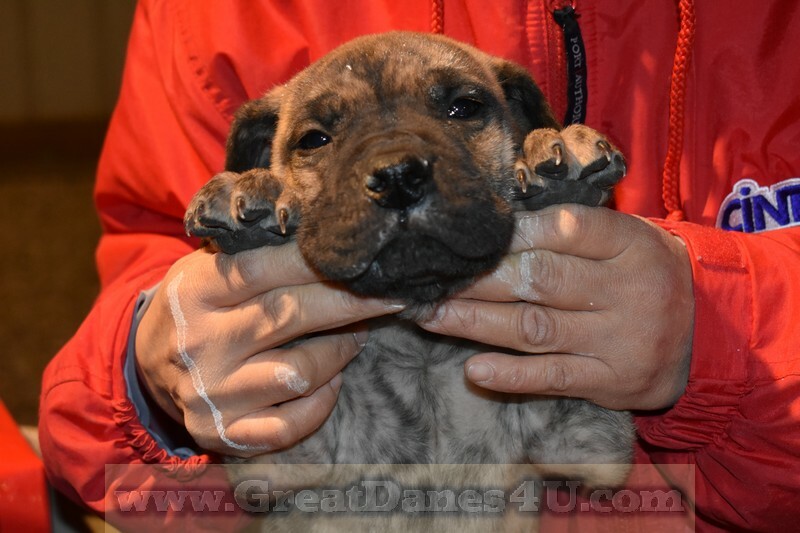 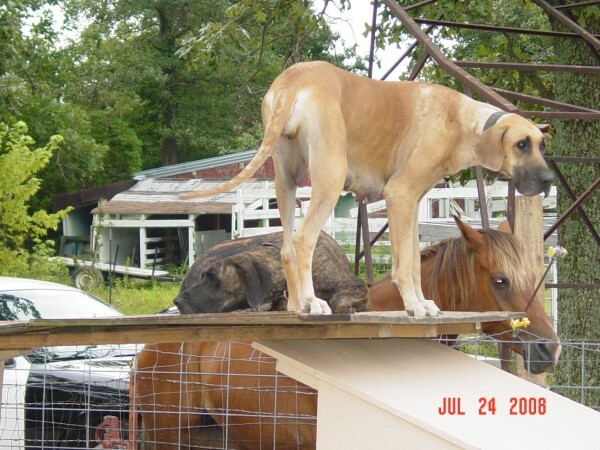 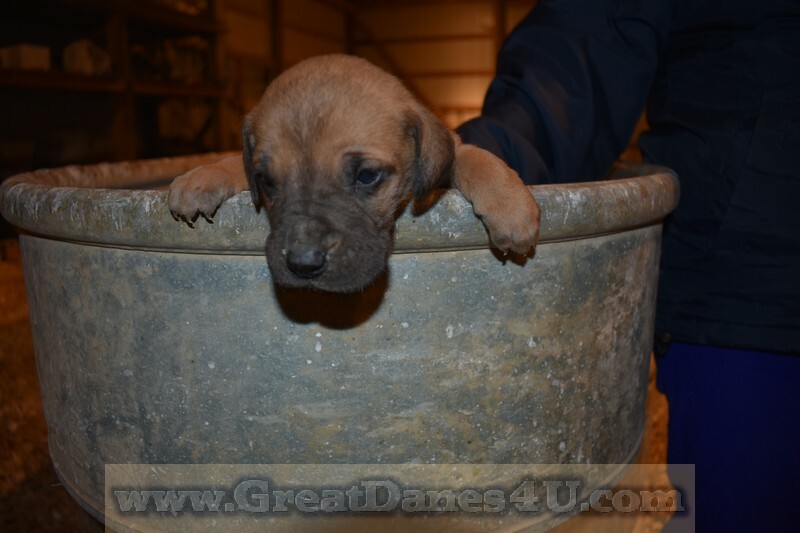 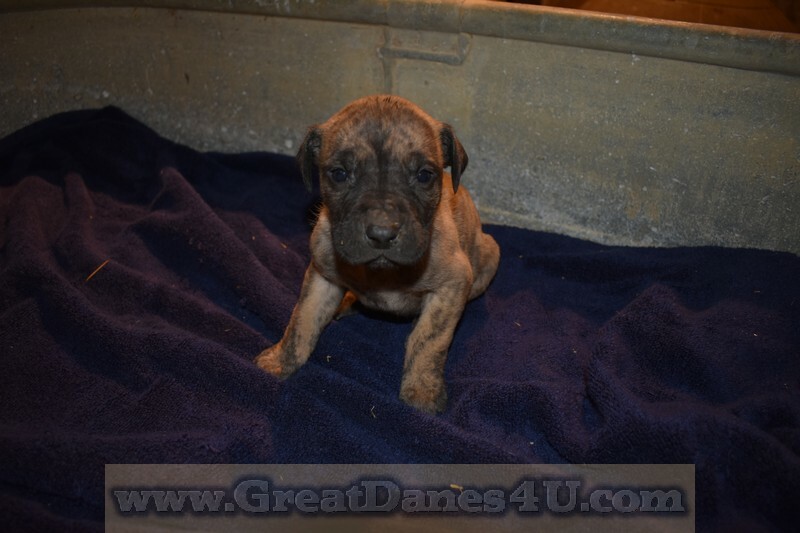 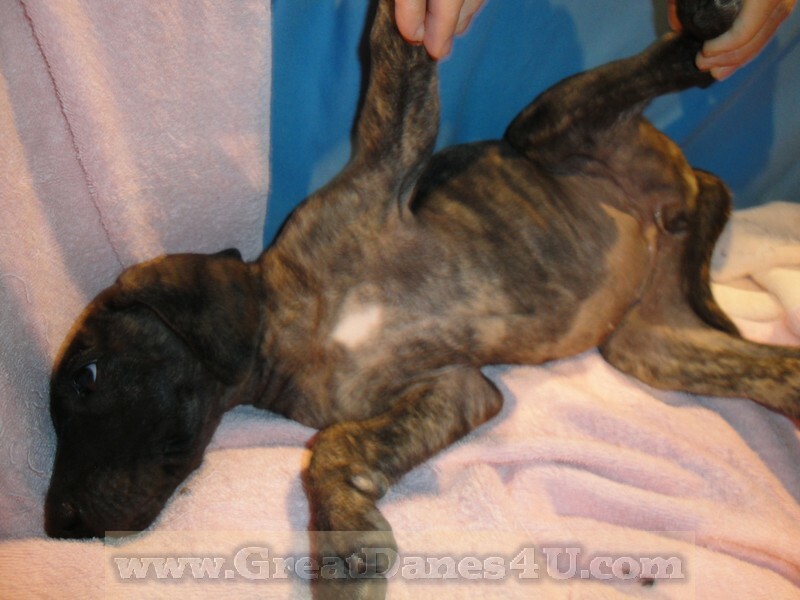 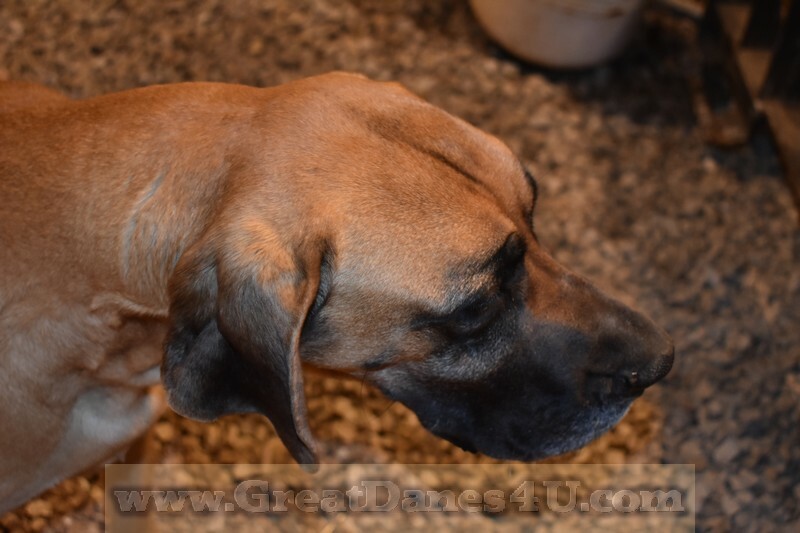 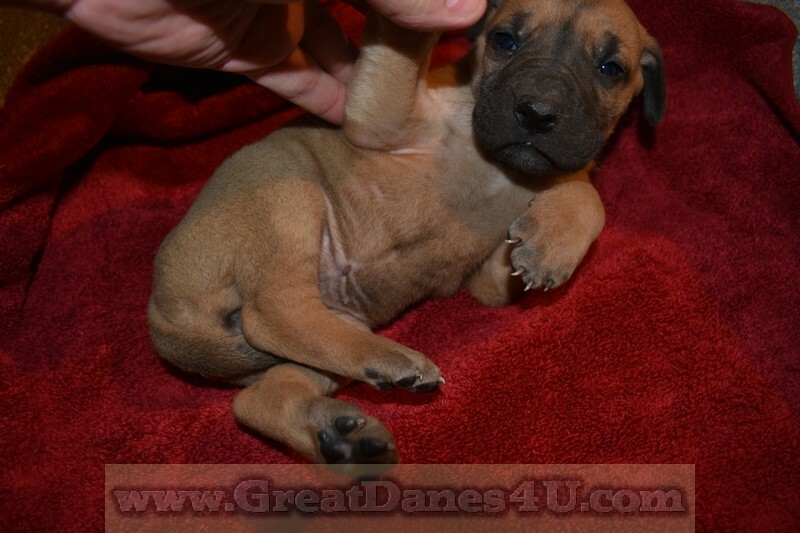 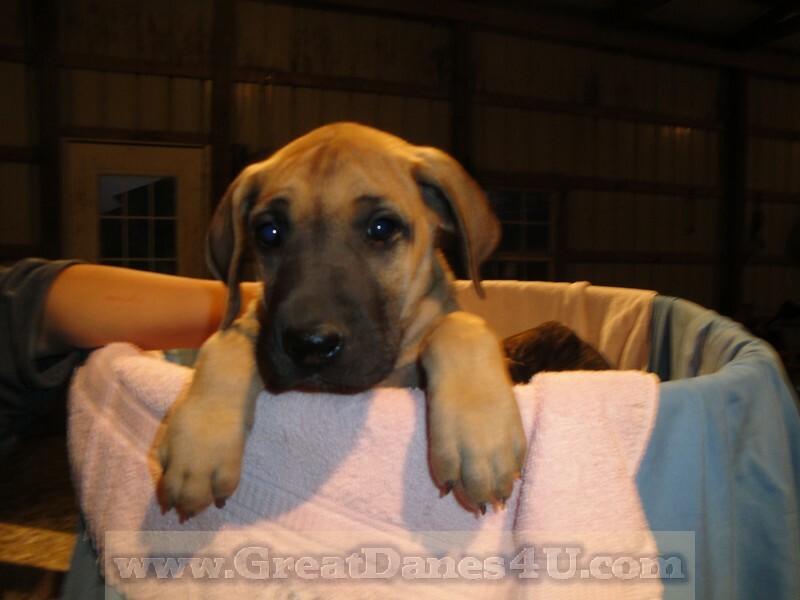 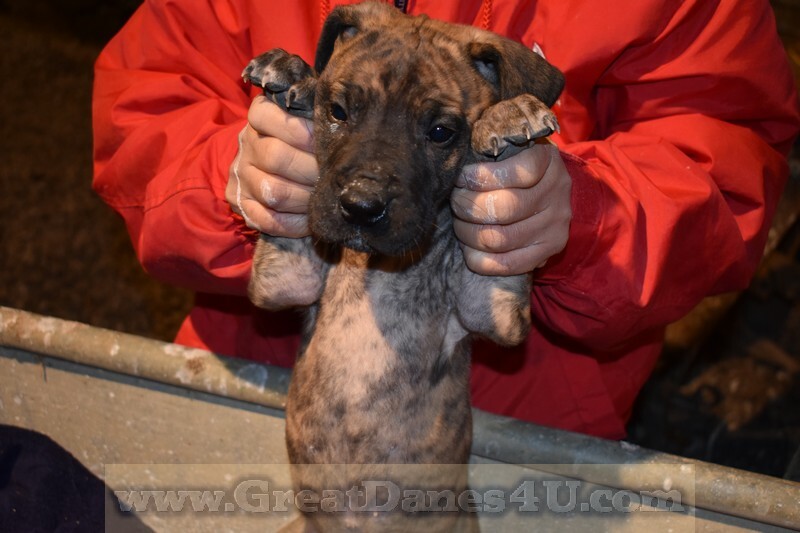 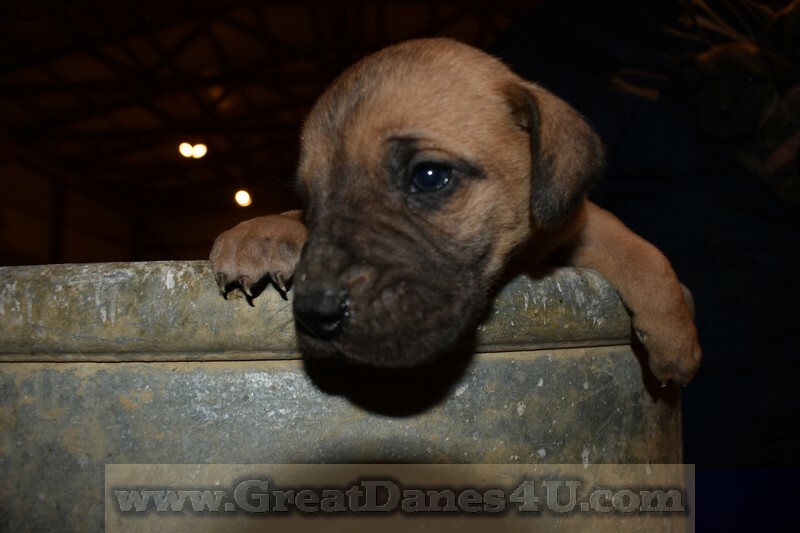 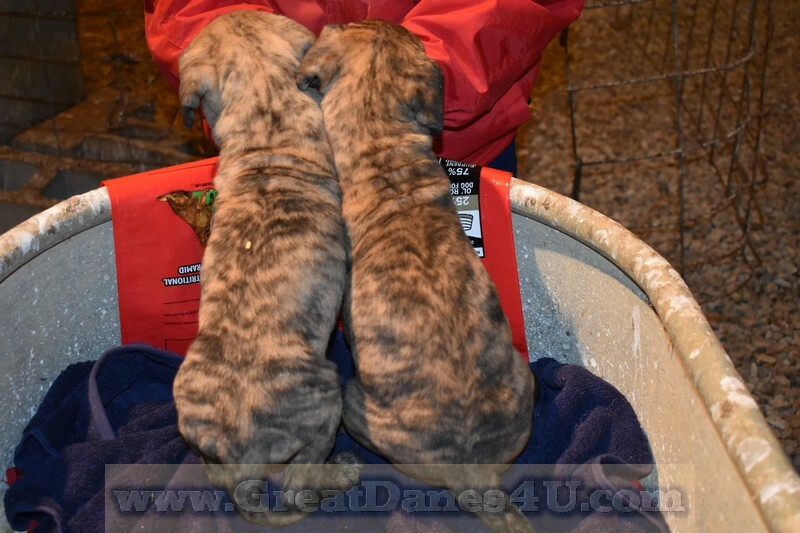 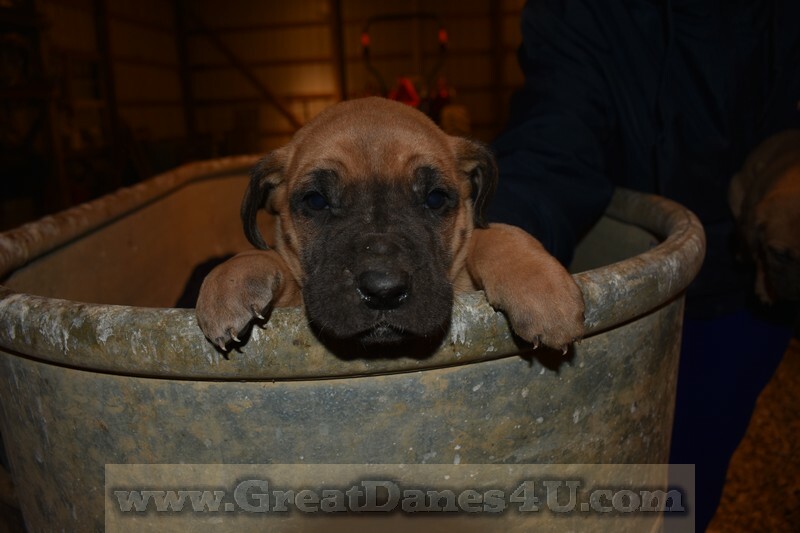 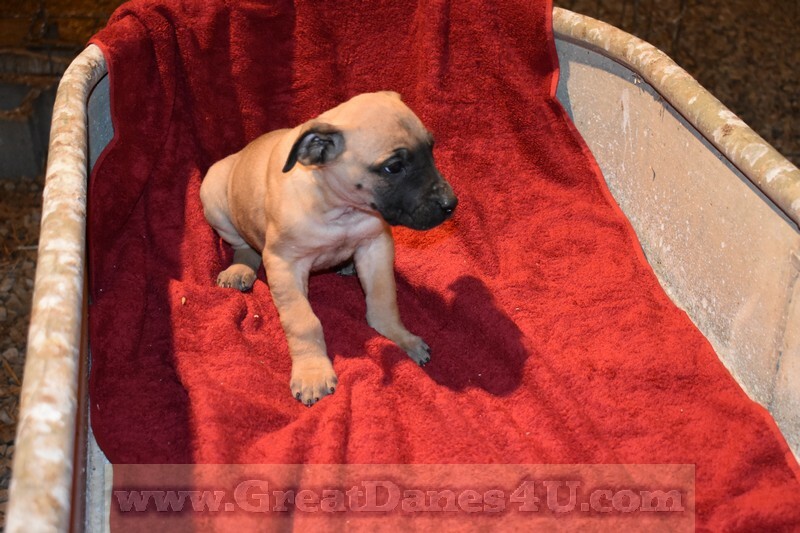 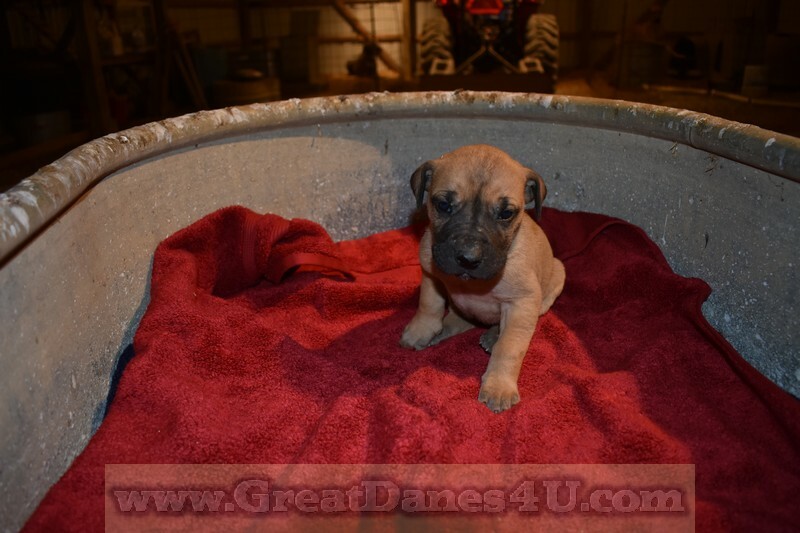 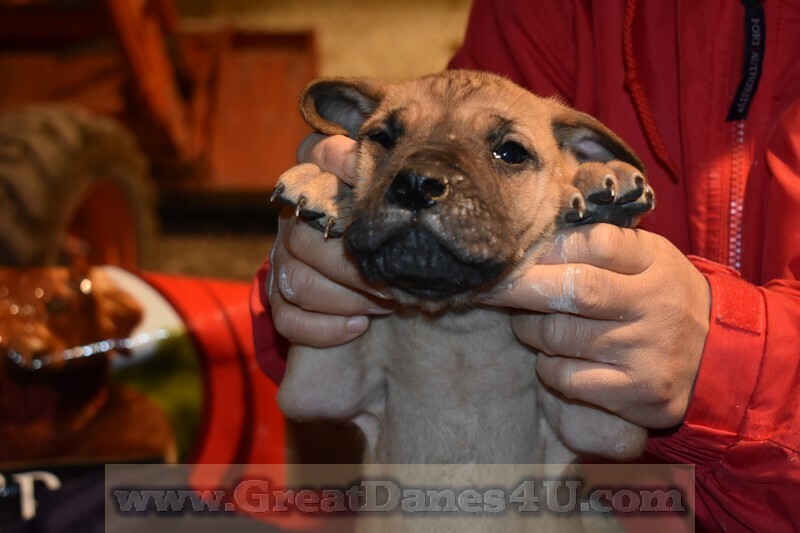 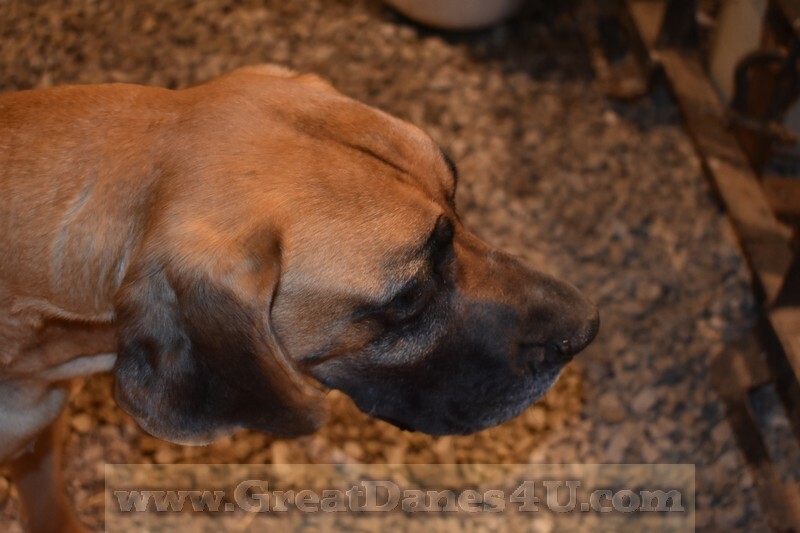 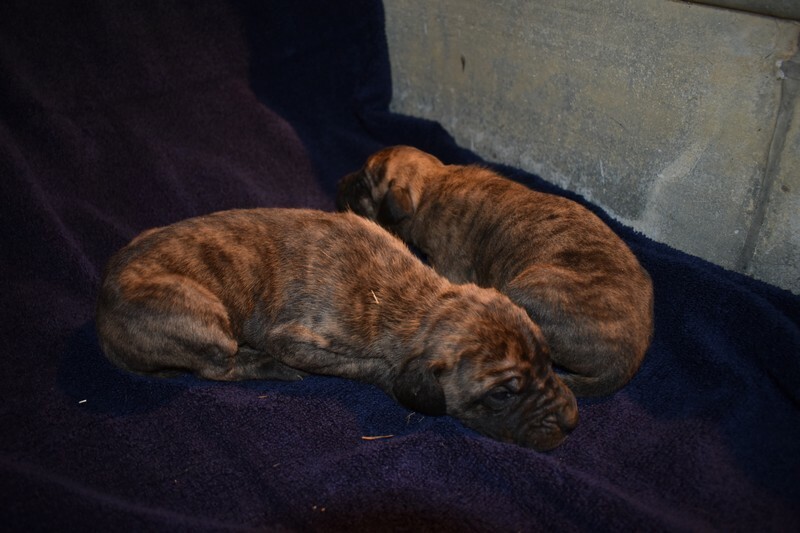 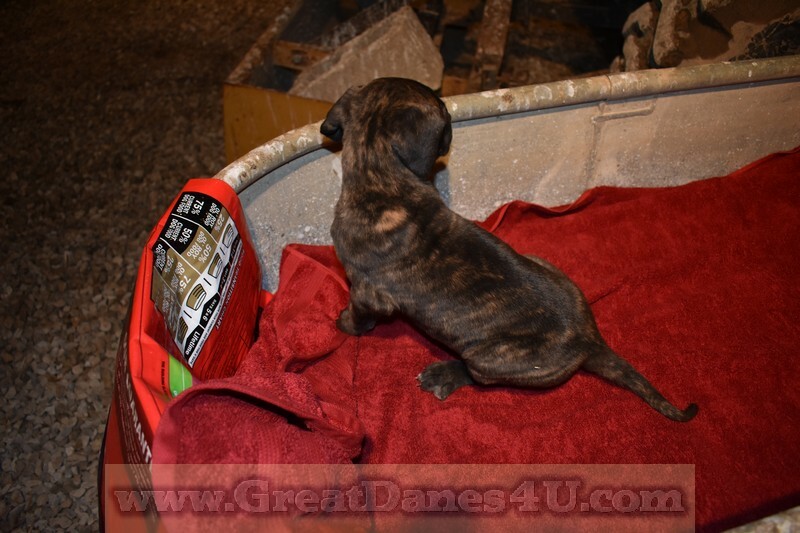 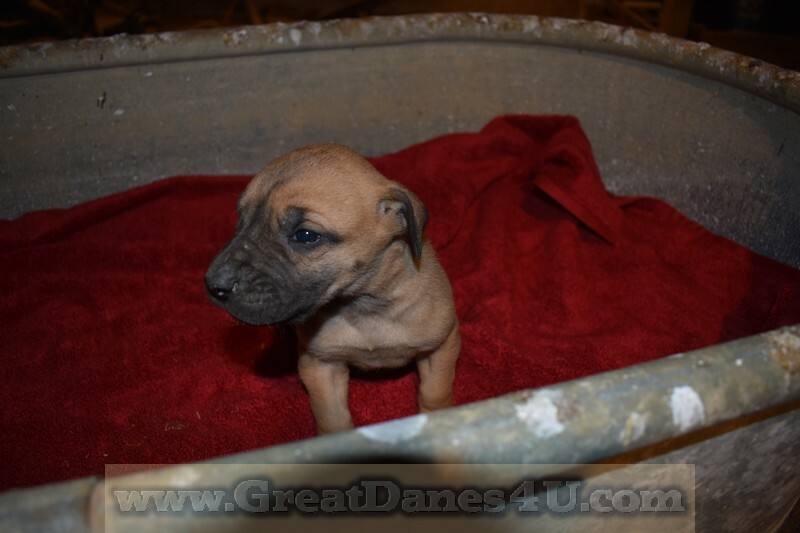 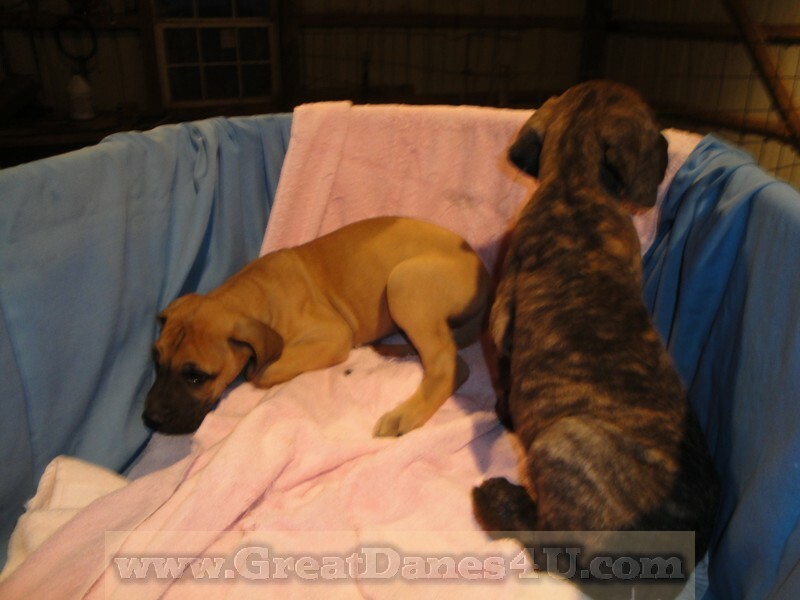 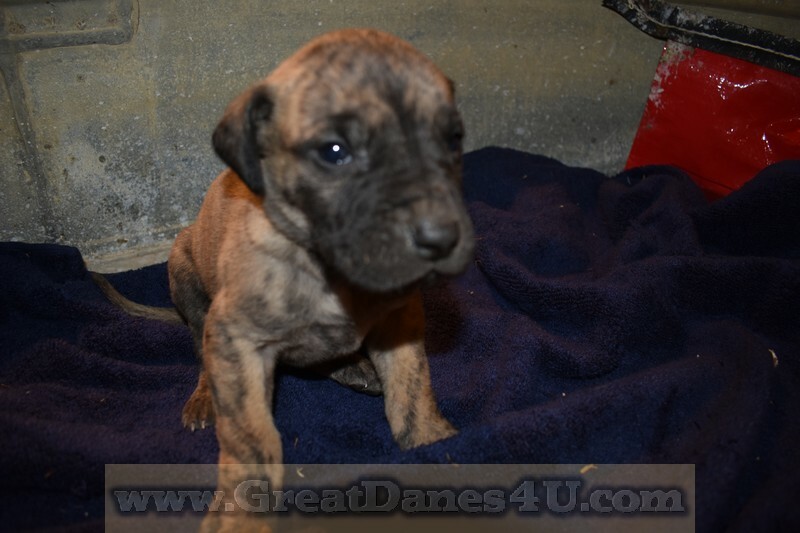 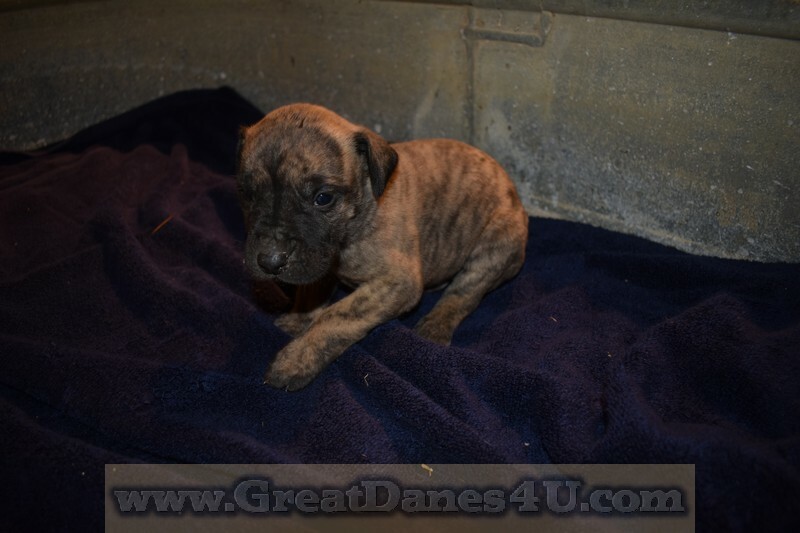 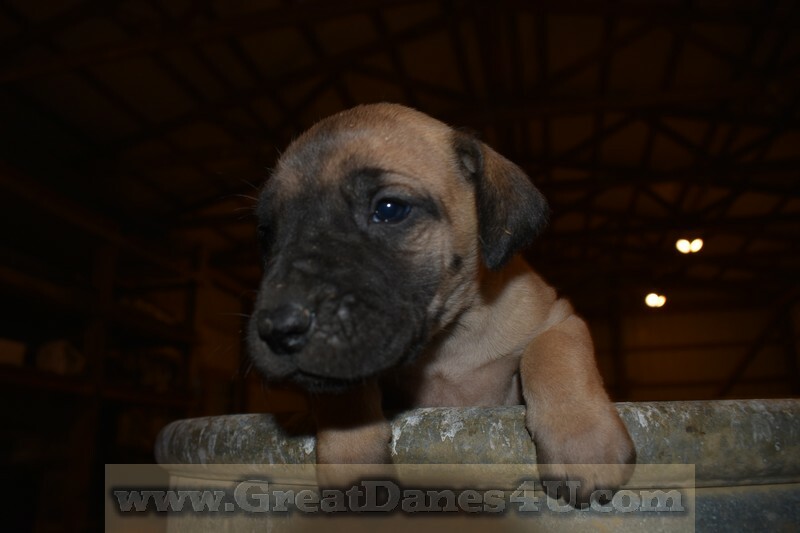 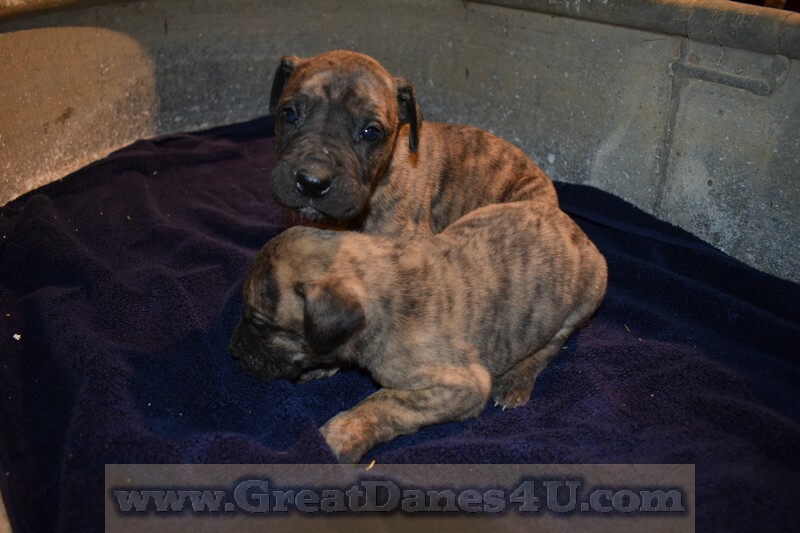 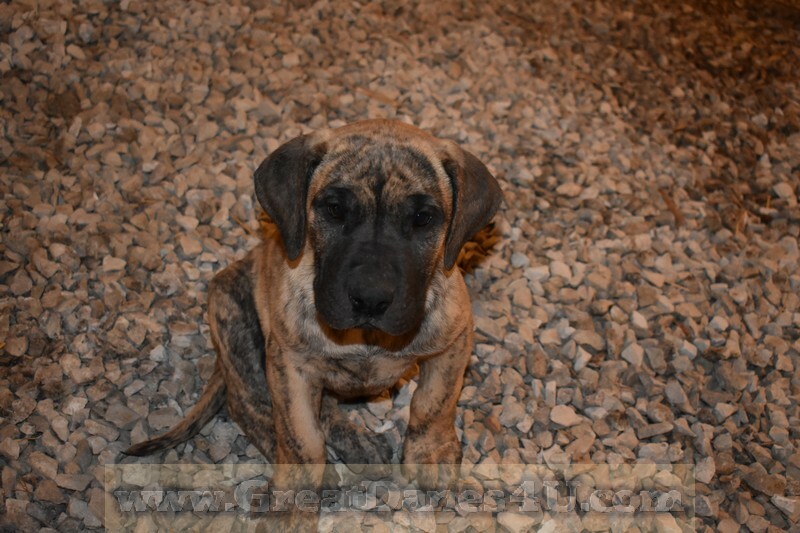 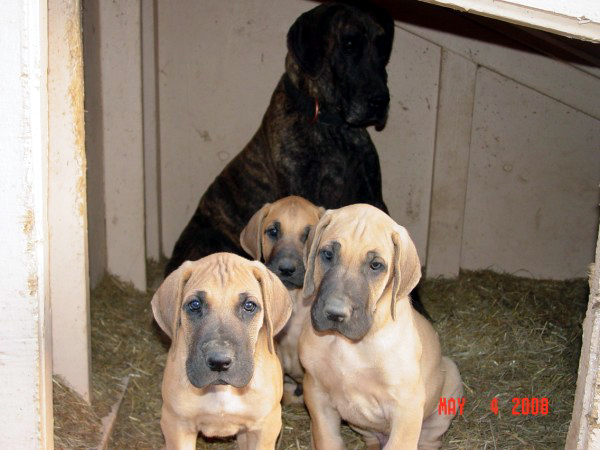 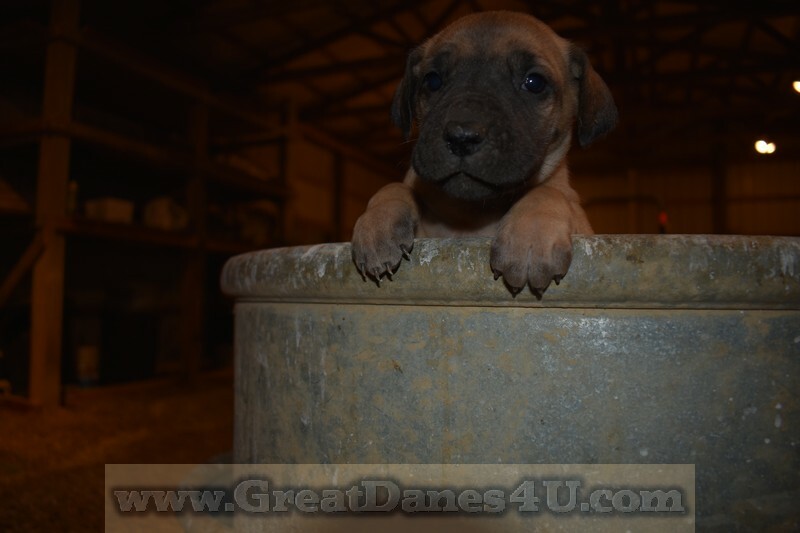 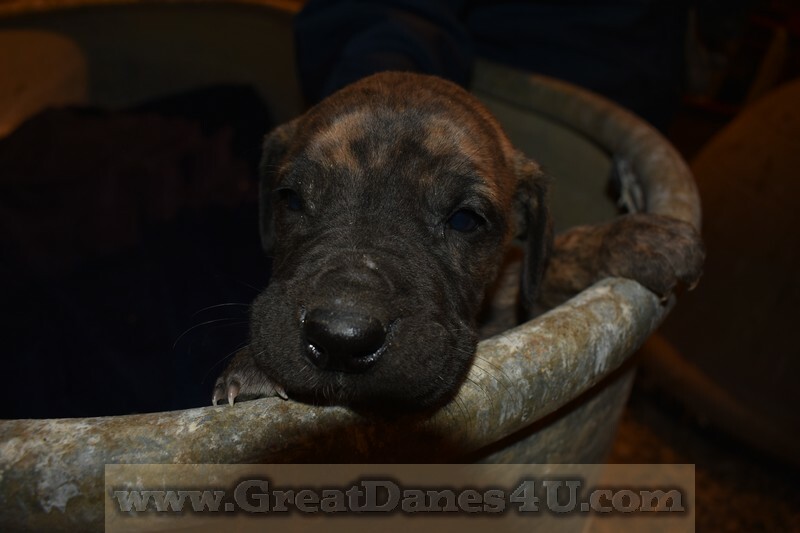 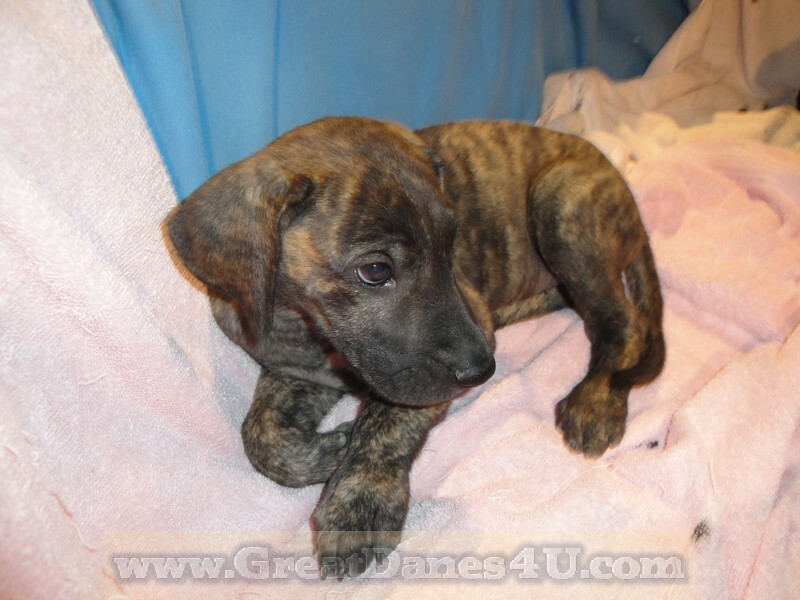 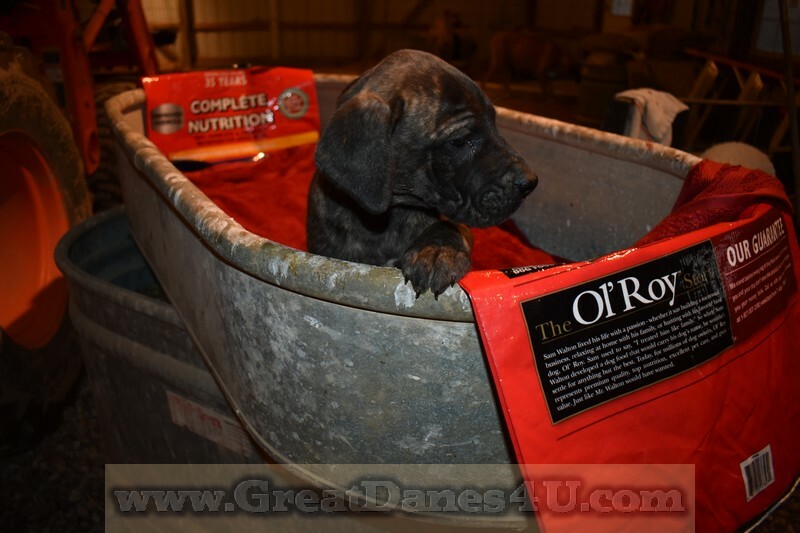 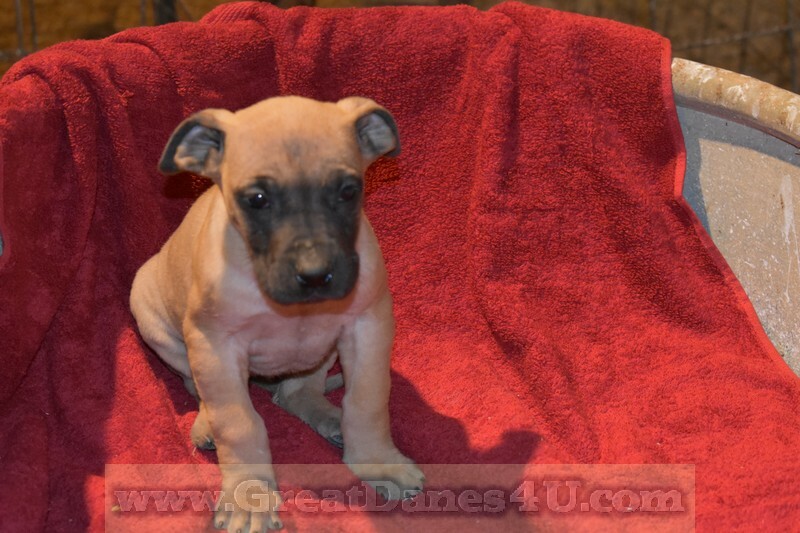 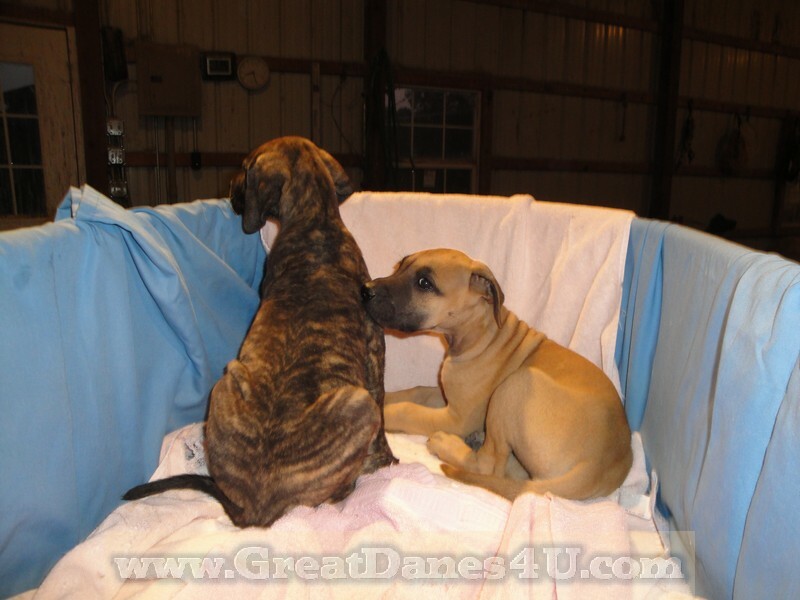 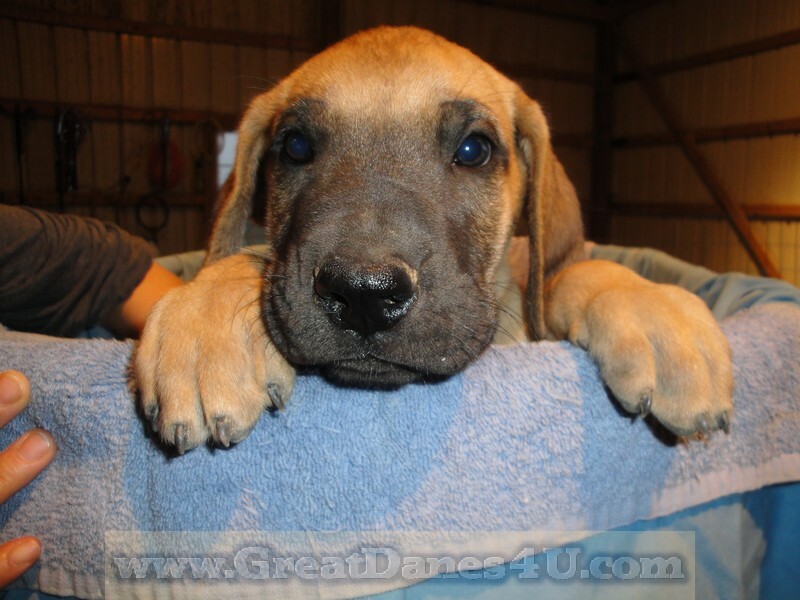 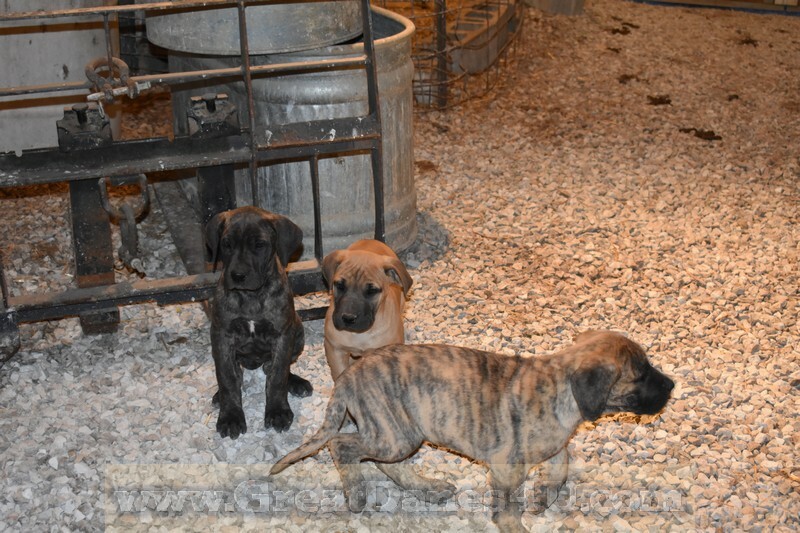 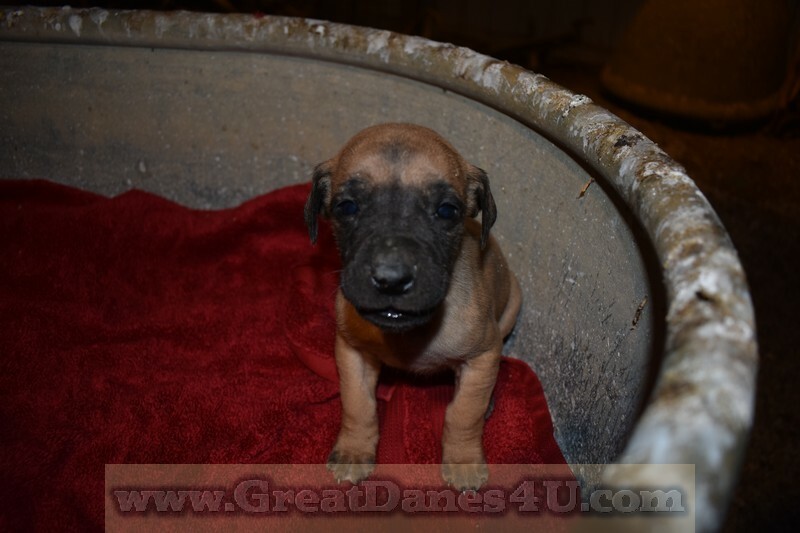 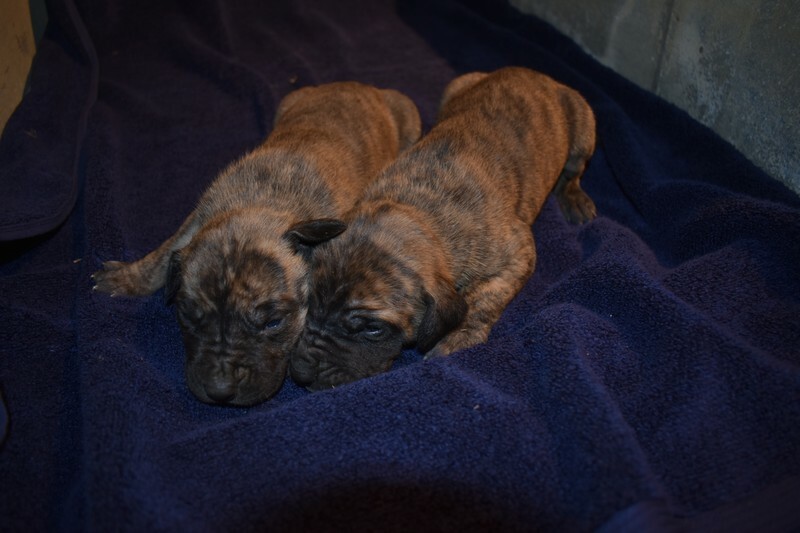 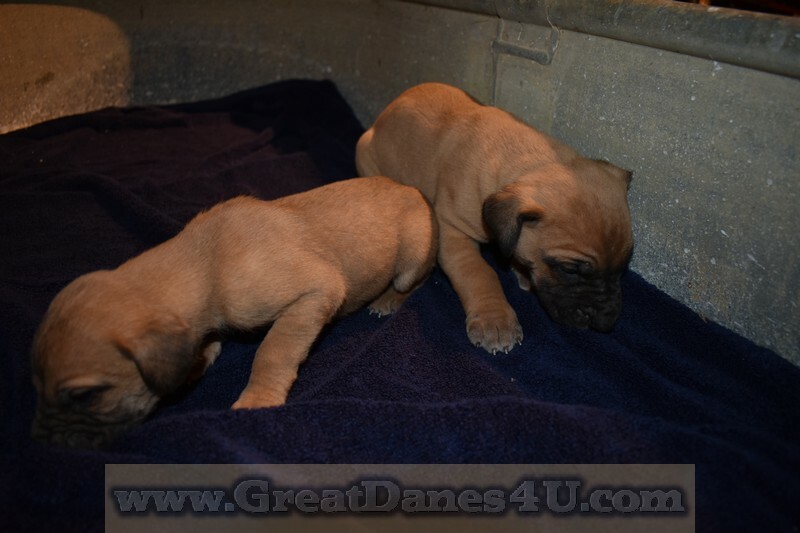 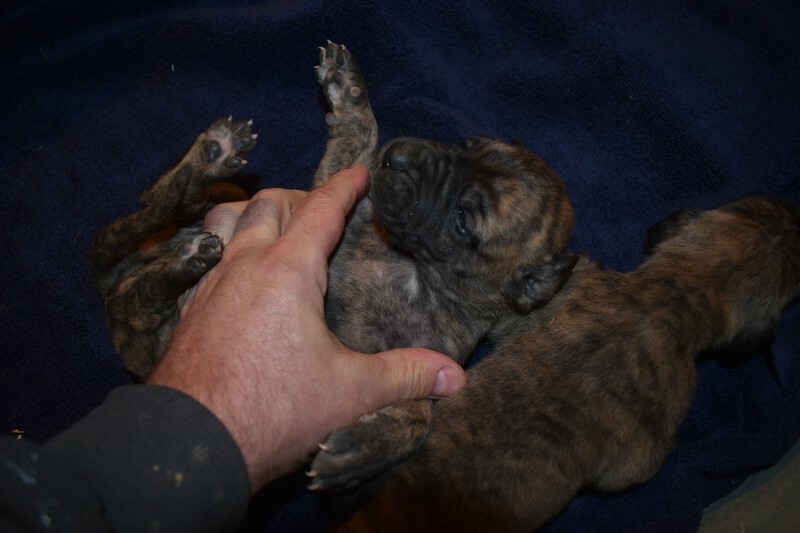 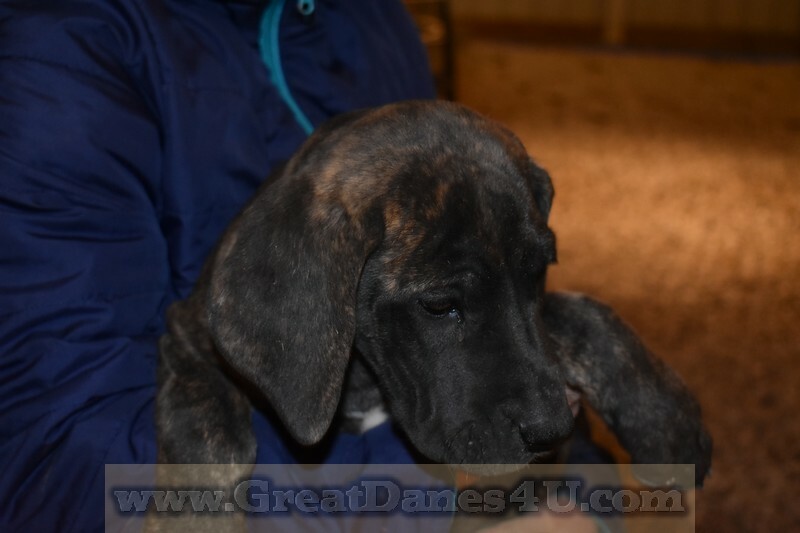 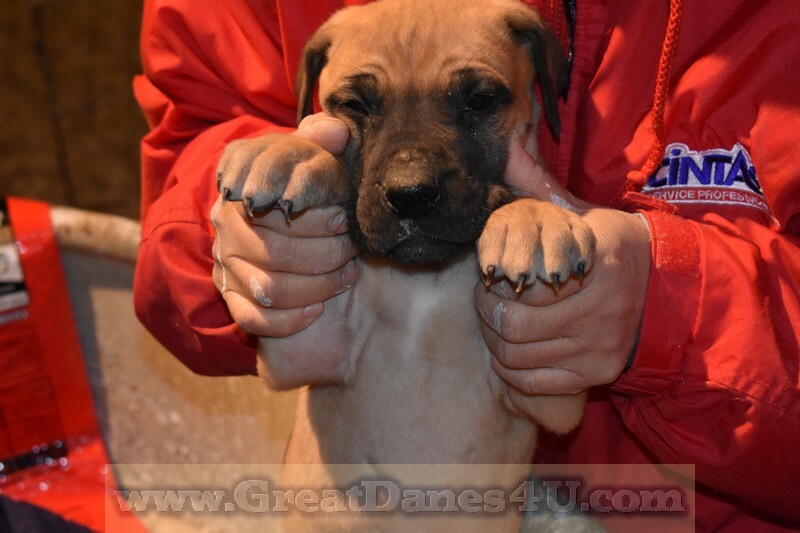 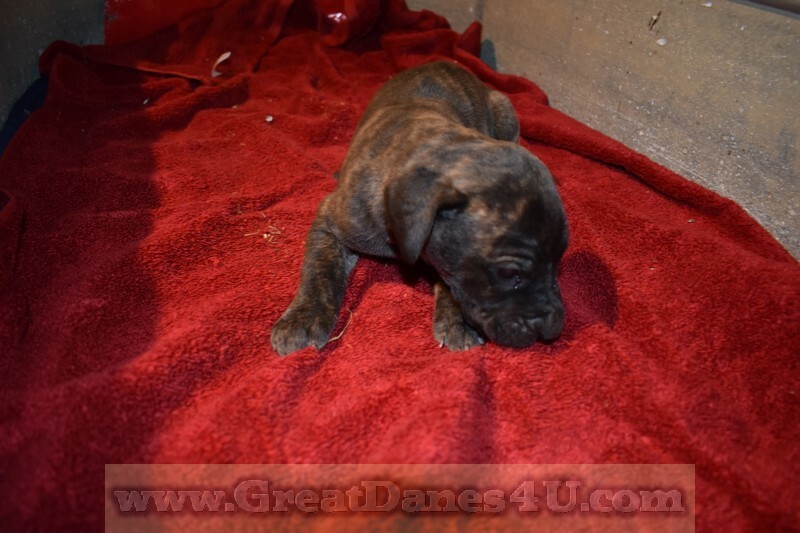 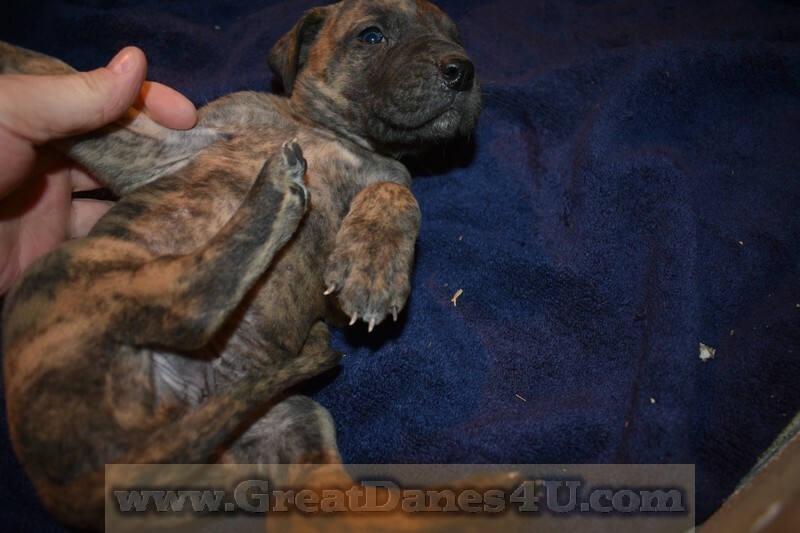 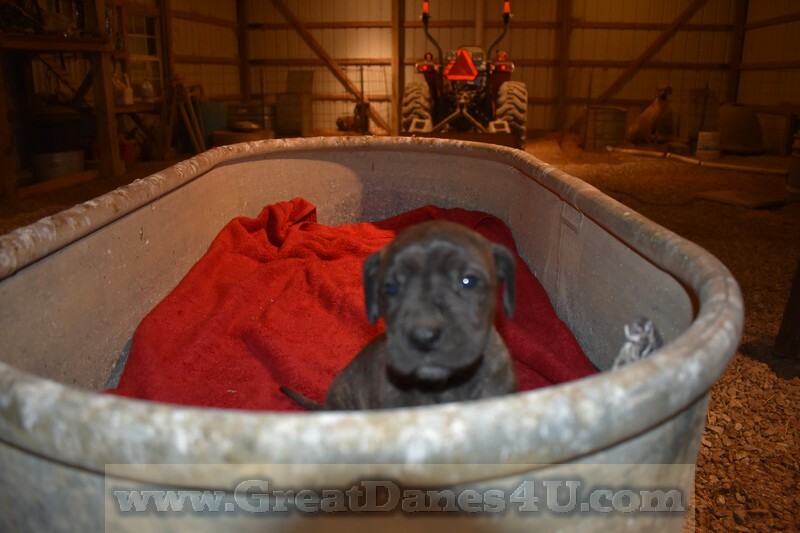 #1 Great Dane Breeder in the USA, according to Google and Yahoo for Fawn and Brindle Danes! 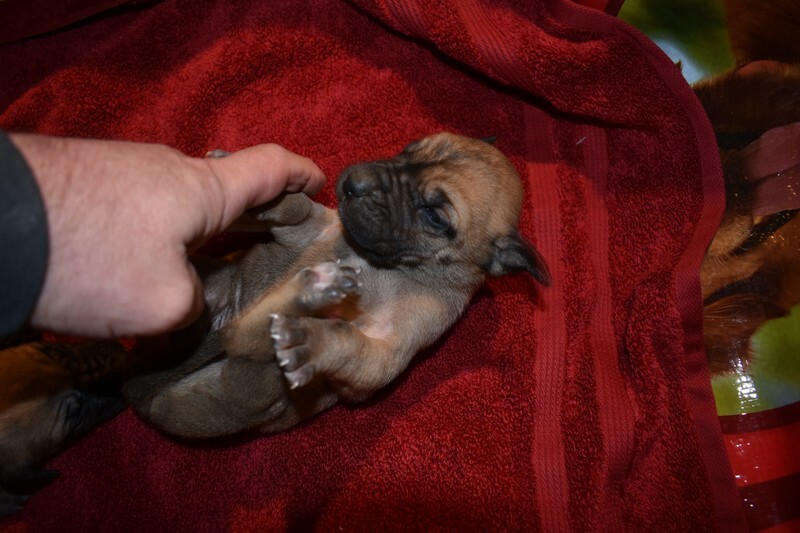 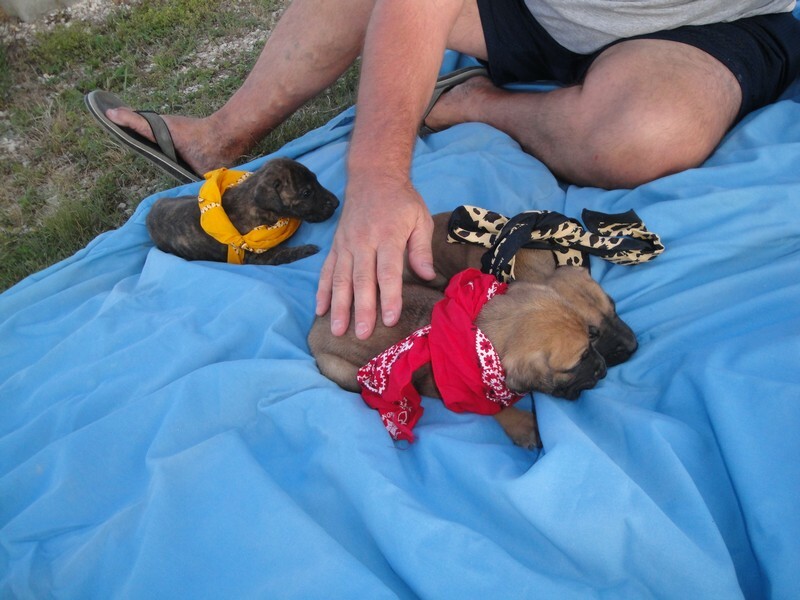 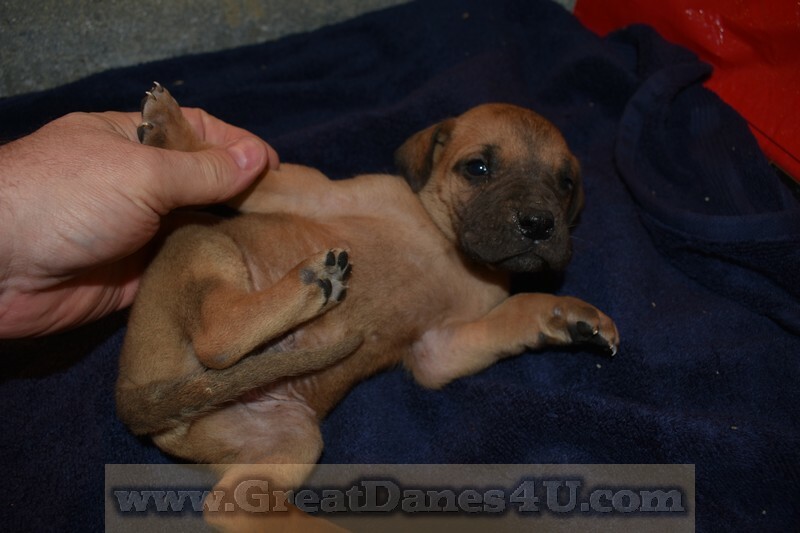 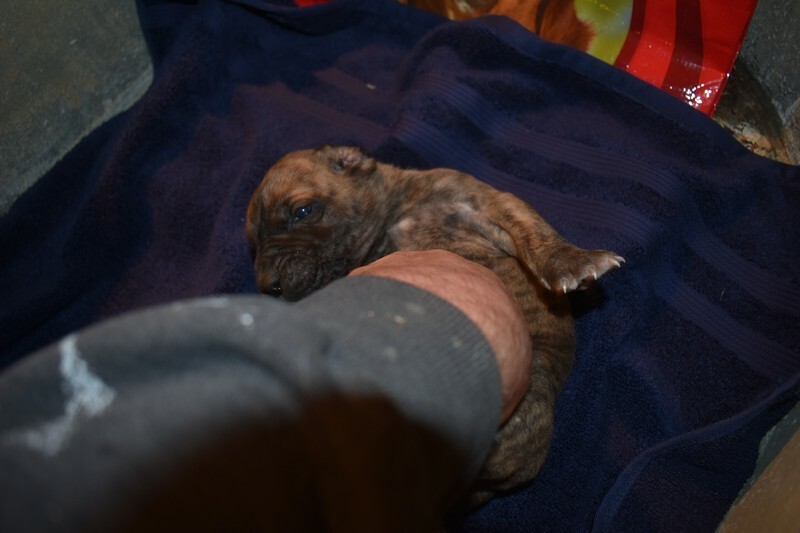 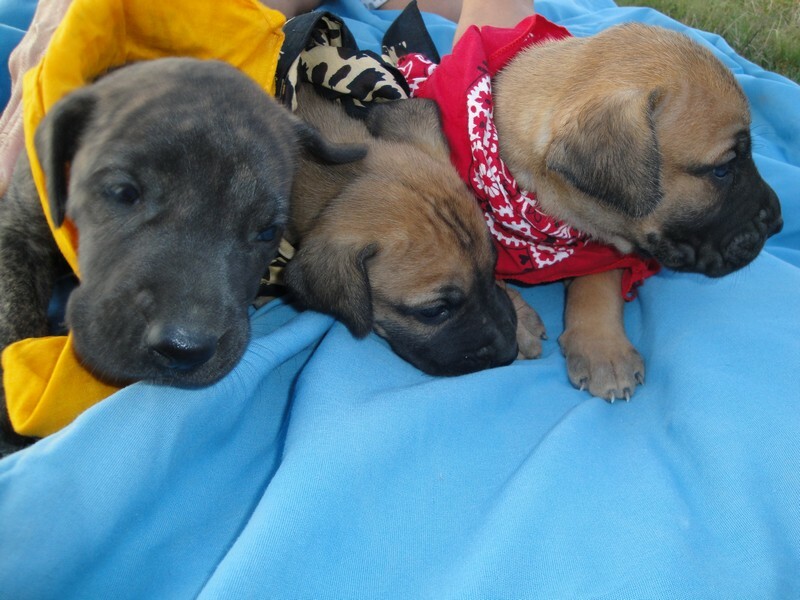 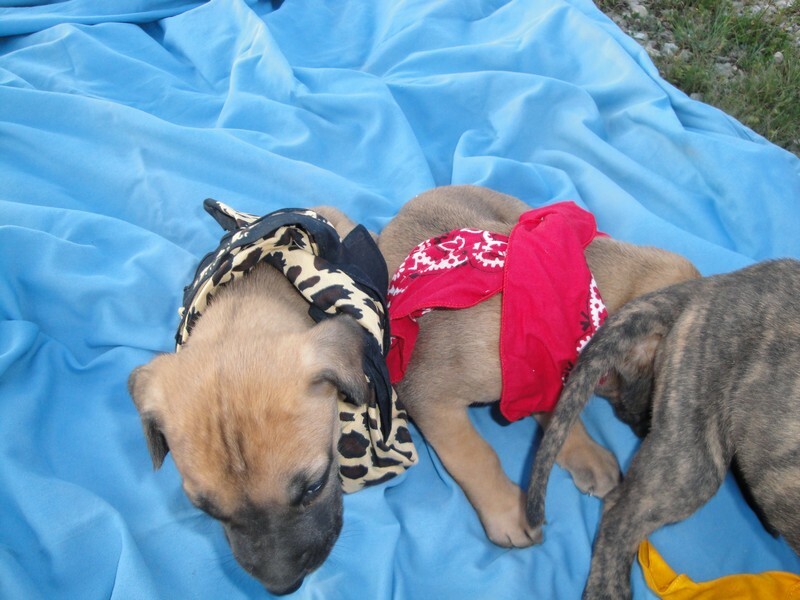 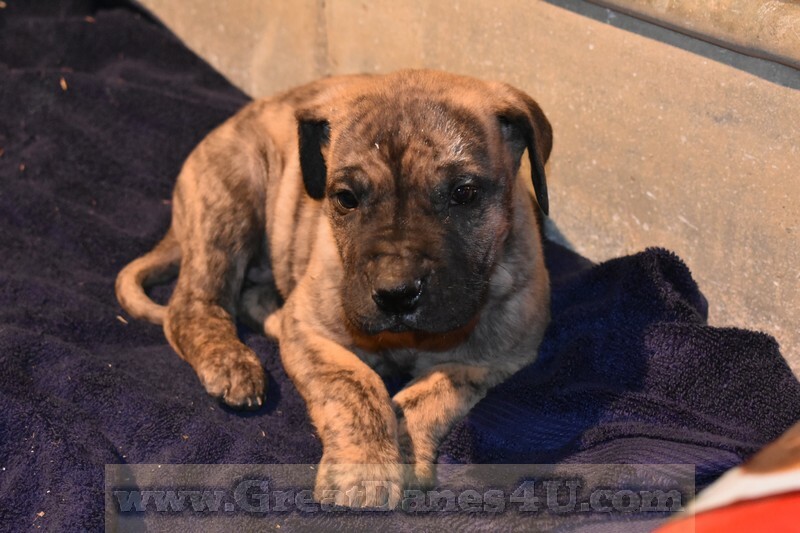 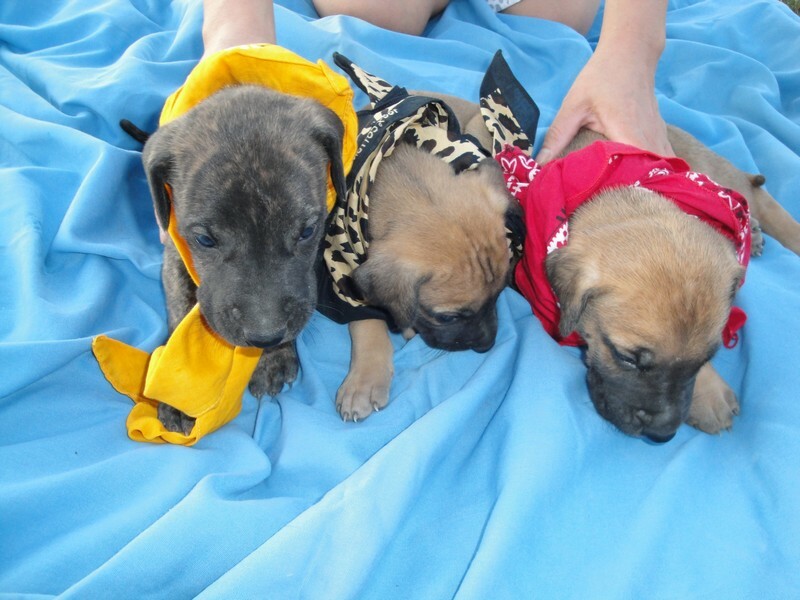 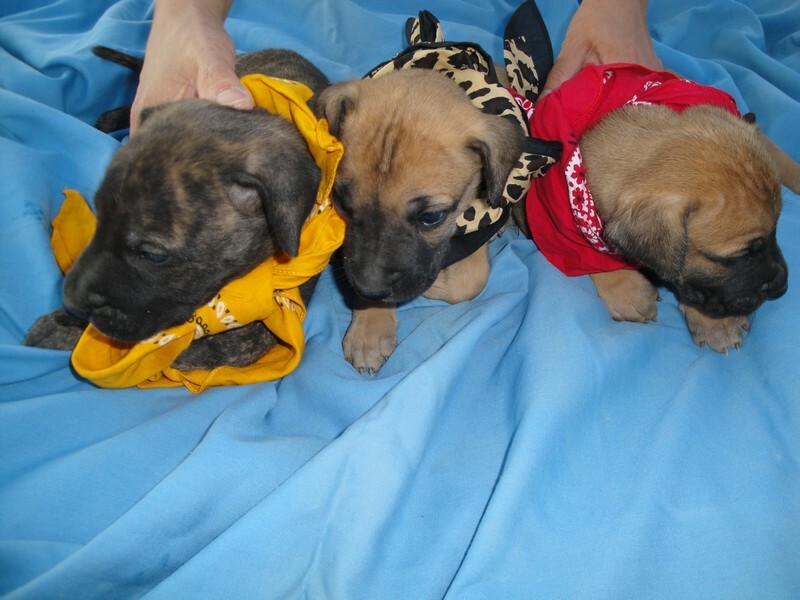 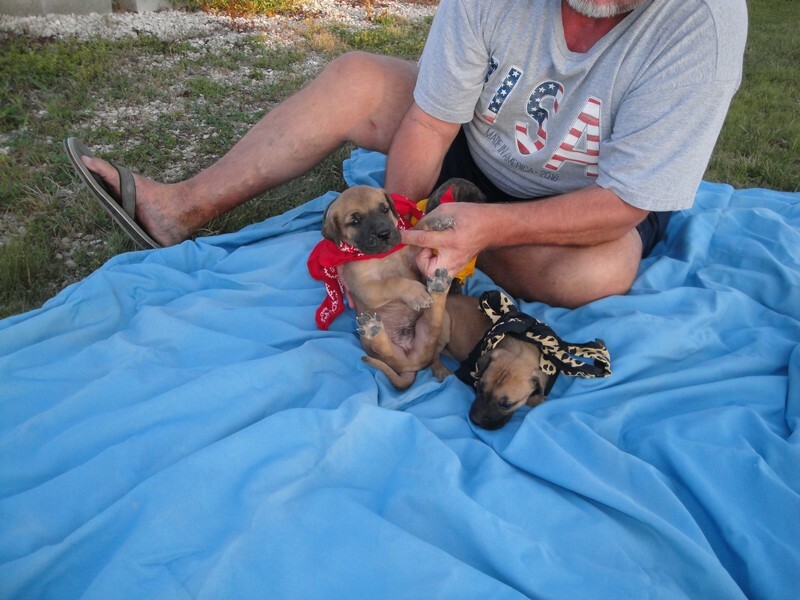 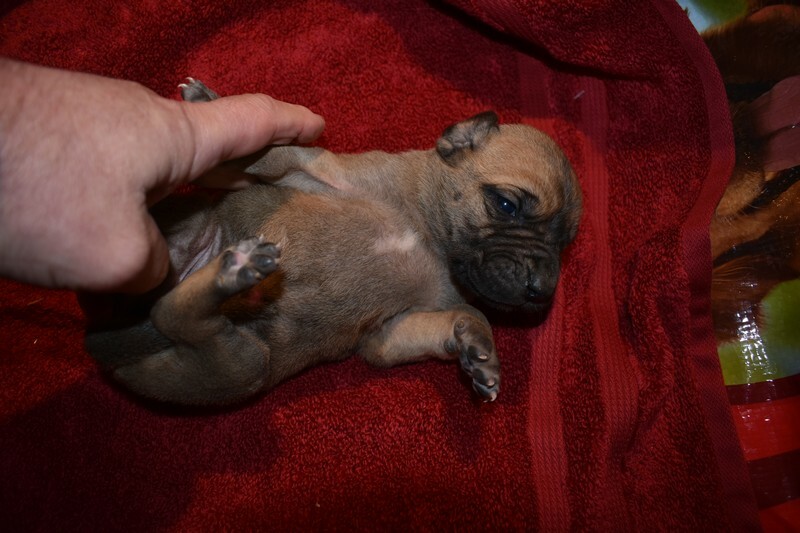 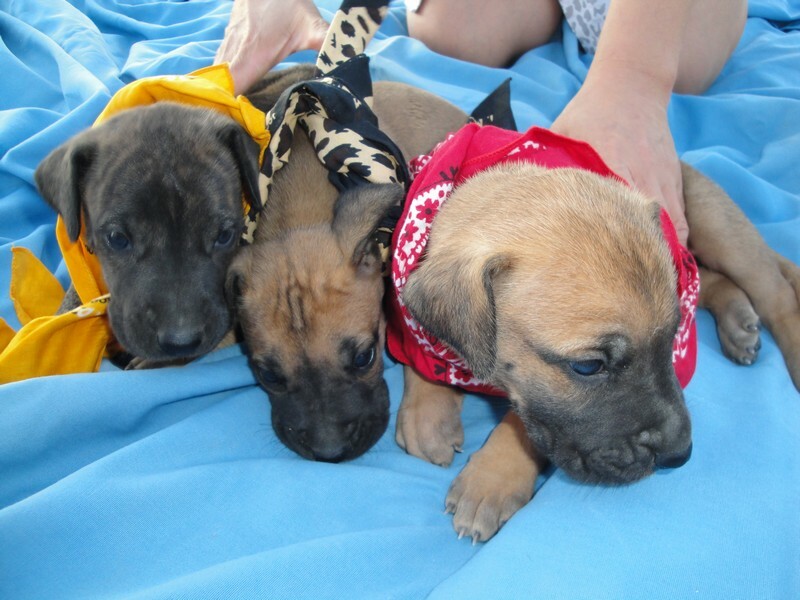 Please check out the: Past Litters web pages for consistency of puppies in each litter! 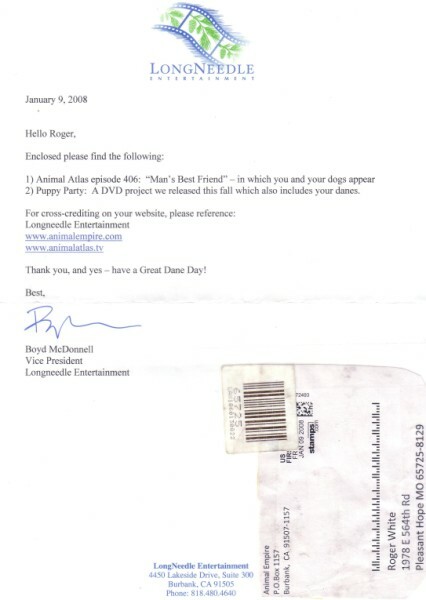 Click an image to enlarge, or Hover over an image to view text. 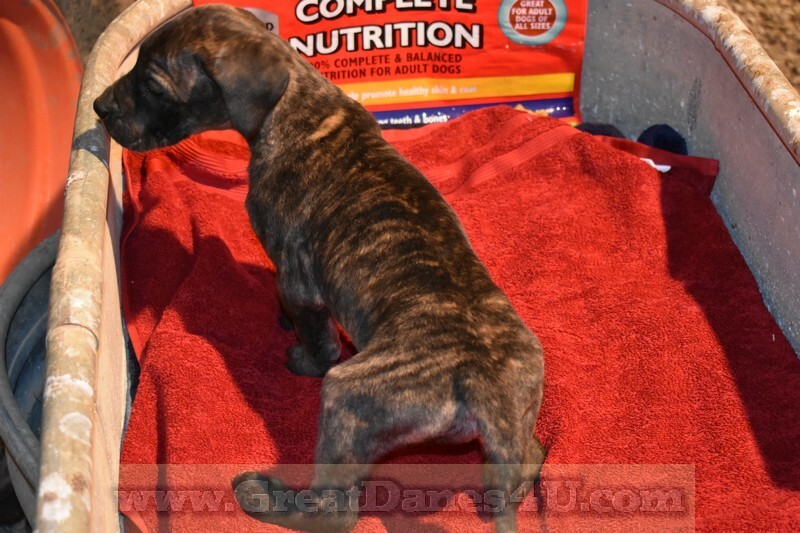 Learn what makes my puppies HEALTHIER! 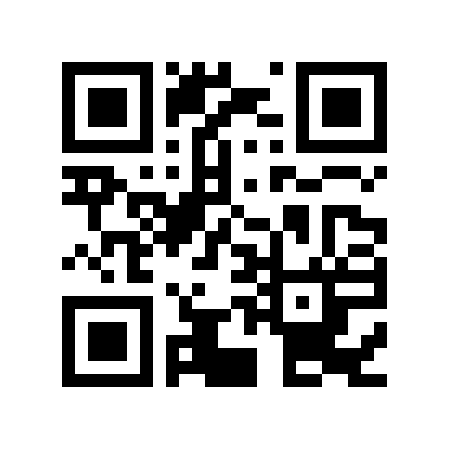 Available until... 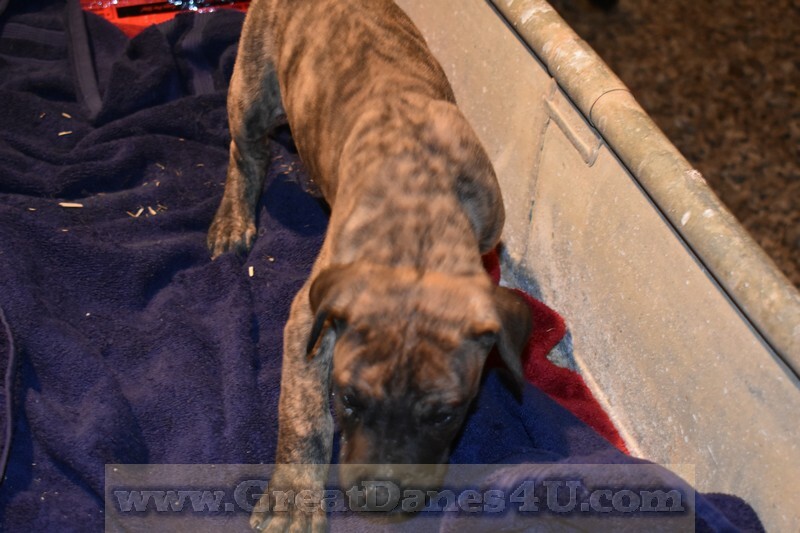 Photos taken 21 Feb.
Gone to Previous Client!!! 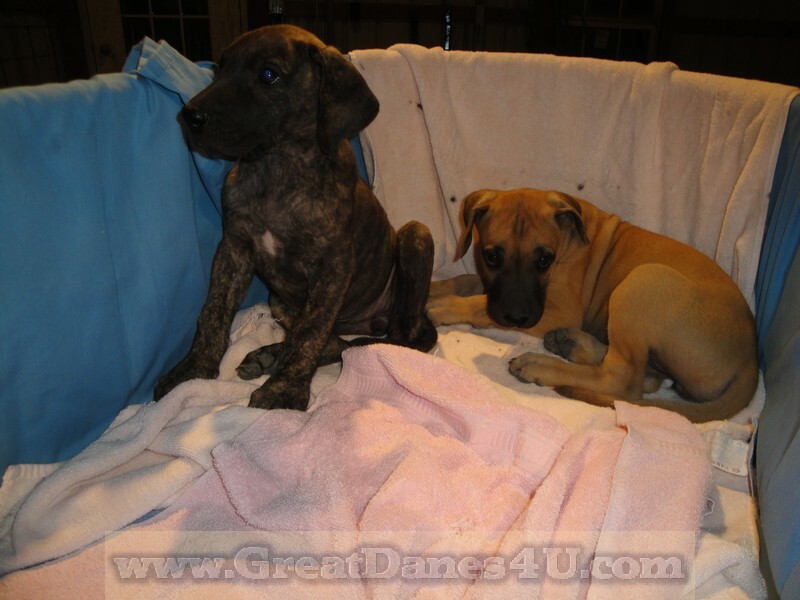 Photos taken 21 Feb.
Gone to: Nicole E. in Detroit MI. 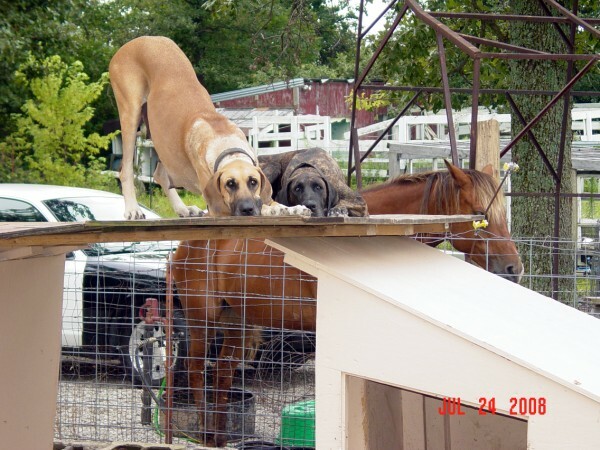 Gone to: R & D S. in Portland, OR. 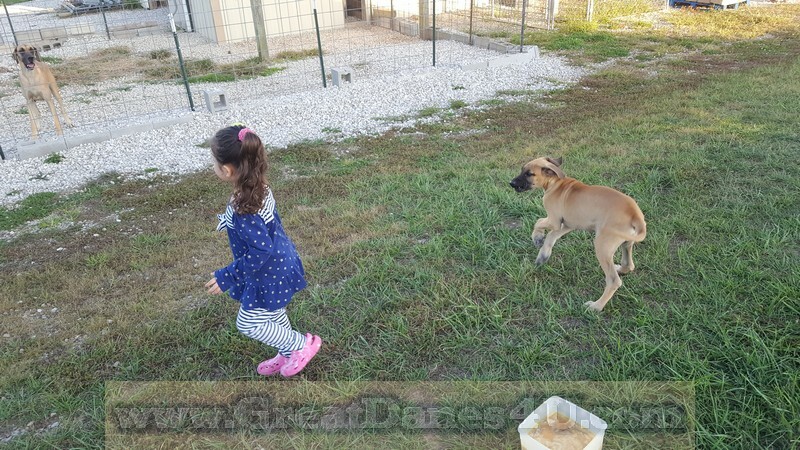 Photos taken 21 Feb. 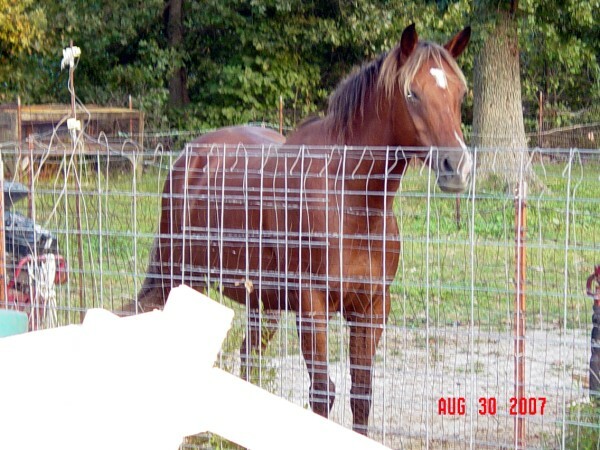 Photos taken 21 Feb.
Gone to: James T. in N.Y.
Gone to Katie K. in Dallas, TX. 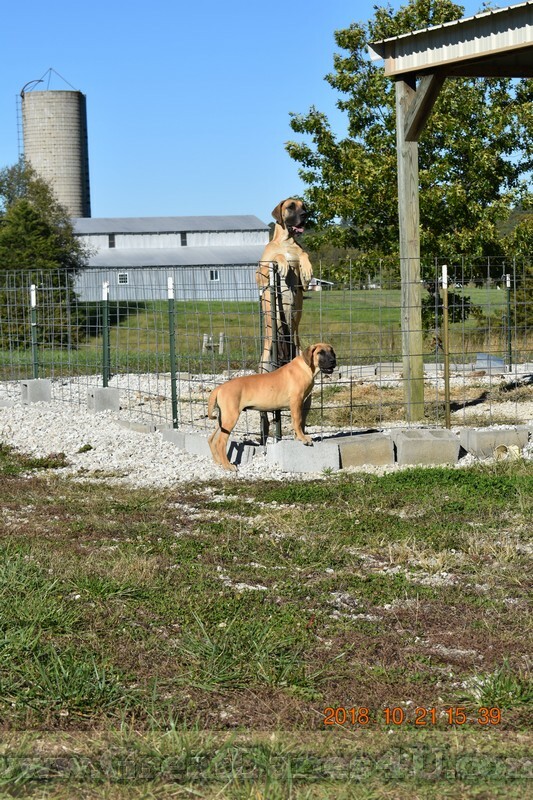 Ralph N. in Kansas City, MO.